D. and I caught a very late flight from London to Athens that didn’t land till 4.00 the next morning. D. parents met us at the airport and drove us to their apartment in Chalandri, a quiet tree-lined residential neighborhood in the northern Athens, where we were going to stay for the following 3-4 days. Thus, Greece was the second pit stop of our journey. I like to give detailed historical previews of the cities/countries I am visiting, but in order to describe the history or the importance of Athens to the world, I would need to spend years to research and just as many to record. That is why, I am going to give just a “snapshot” of it. Just as everything else in Greece (and you will read it in my future posts as well), the history of Athens is closely interwoven with mythology, making it impossible to extricate facts from fiction. 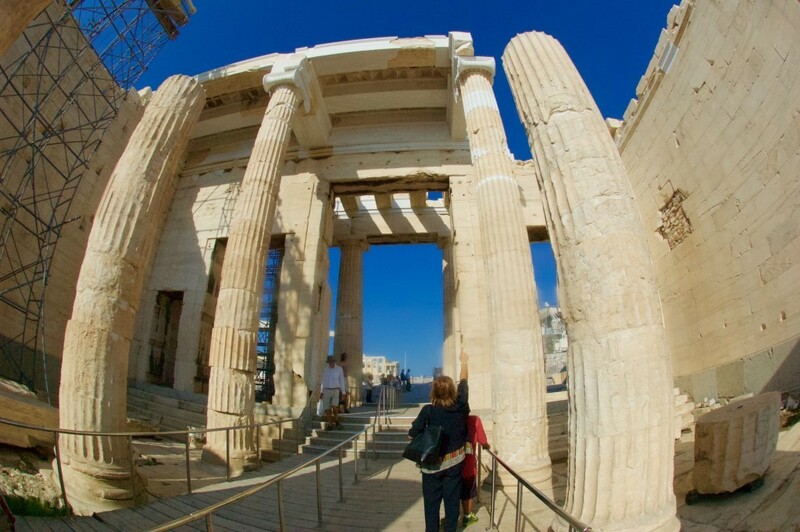 Continuously inhabited for over 7,000 years, Athens is a cradle of Western civilization, home of Plato’s Academy and Aristotle’s Lyceum, and don’t forget – a birthplace of democracy. 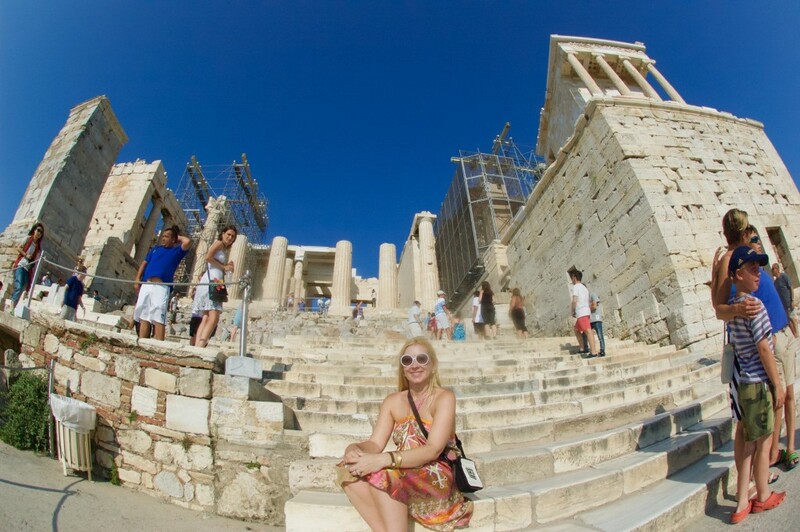 It is one of the oldest cities in the world, going back to the 11th–7th millennium BC when the earliest Neolithic settlers established themselves on the hilltop site of, what is now known as, Acropolis. By 1400 BC the settlement had become an important centre of the Mycenaean civilization and the Acropolis was the site of a major Mycenaean fortress, whose remains can be recognized from sections of the characteristic Cyclopean walls. Athens survived a Dorian invasion of 1200 BC, but like many other Bronze Age settlements, went into economic decline for around 400 years afterwards. Iron Age burials, in the Kerameikos and other locations, richly demonstrate that from 900 BC onwards Athens, ruled by aristocrats and generals, was one of the leading centers of trade and prosperity in the region. Widespread social unrest led to the reforms of Solon in 594 BC which improved the conditions of the poor, by introducing the annulment of debt and the implementation of trial by jury. These would pave the way for the eventual introduction of democracy by Cleisthenes in 508 BC. Despite Persians’ double take-over of the city, Athens won the battles of Salamis (480 BC) and Platea (with help of Sparta) and its power no longer knew the bounds. Pericles (ruler from 461 BC to 429 BC) transformed the city by building Parthenon and most of the monuments on the Acropolis and the decades that followed became known as the Golden Age of Athenian democracy. Athens of that time we associate with names of Aeschylus, Sophocles and Euripides (the playwrights), historians Herodotus and Thucydides, and the physician Hippocrates. Peloponnesian Wars (431 BC-404 BC) let the jealous state of Sparta gain the upper hand, and sadly, Athens was never to return to its former glory. Nevertheless, as if drawing its final breath, Athens of the 4th century BC bore three world’s greatest philosophers: Socrates, Plato and Aristotle. In 338 BC, Athens was conquered by Philip II of Macedon and after his assassination, his son, Alexander the Great favored Athens over other city-states. In 186 BC the Romans defeated the Macedonians, destroyed the city walls and took precious sculptures to Rome, however during 300 years of “Pax Romana” Athens continued to be a major seat of learning; many young Romans attended Athens’ schools and Greek was lingua franca of many wealthy Romans. The Roman emperor Hadrian, in the 2nd century AD, constructed a library, a gymnasium, an aqueduct which is still in use, several temples and sanctuaries, a bridge and financed the completion of the Temple of Olympian Zeus. After the subdivision of the Roman Empire into east and west, Athens, for some time, remained an intellectual center, however, after Emperor Justinian closed its schools of philosophy in AD 529, the city went into decline and between 1200 and 1450 was continually invaded by countries preoccupied with grabbing the bits of crumbling Byzantine Empire. The capture of Athens by the Turks in 1456 was followed by 400 years of Ottoman rule. The Acropolis became the home of the Turkish government, the Parthenon was converted into a mosque and the Erechtheion became a harem. After 8 years of Greek War of Independence (with help from Russia, France and Britain), Greece gained back its independence and city of Nafplio was named the country’s capital till 1834 when it was moved to Athens – then, a sleepy village of 6,000. After suffering a great deal during the German occupation in 1940s, the country plunged into a bitter civil war that took even more lives than WWII. And despite recession, increasing poverty, staggering unemployment rate, unstable government, Athens and Greece in general still remain one of the world’s most visited places, partially due to its invaluable contribution to the world’s art, theater, philosophy, literature, architecture (….fill in the blank), but also because of the unparalleled hospitality of Greek people, unforgettable beauty of the country, dishes that will make you drool, sunsets that you will never forget and many more. Let’s explore, I am on this journey with you. Since D and I arrived very early in the morning, we didn’t leave the apartment till around 11.00. We took a very comfortable and clean Subway to the Monastiraki stop (North of Acropolis map) and from there we proceeded by foot (yes, you can!) 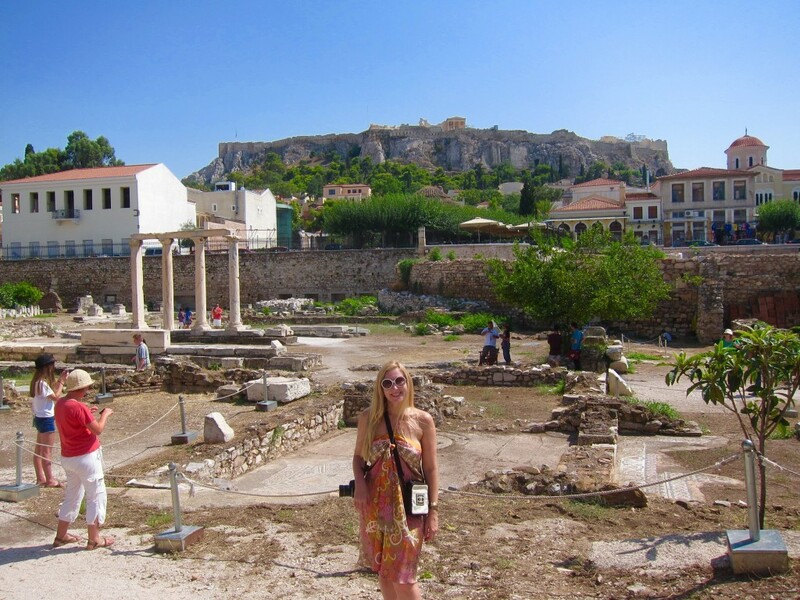 to see all the highlights of Athens. I have to mention that every subway stop (or pretty much any construction in the city) is an archeological site with its own right. Athens not only carefully preserves these sites, but also gives a detailed background on each and every one, where it is possible. 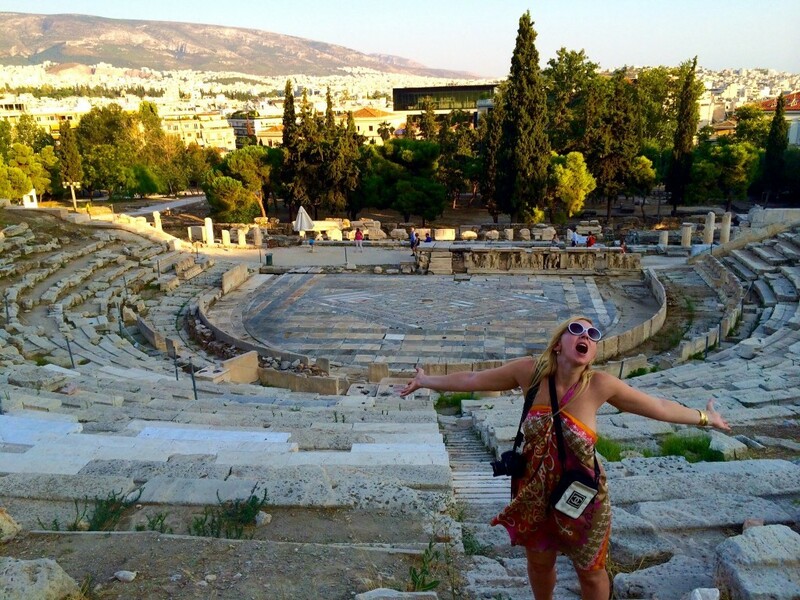 Basically, the best way to experience the history of Athens is to move from one subway station to another. There couldn’t be a better spot to start my acquaintance with the city but at a small picturesque Monastiraki square, which houses a 10th century church, the old Tzistarakis Mosque converted into the Kyriazopoulos Folk Ceramic Museum, and is only steps away from Athens’ famous flea market, Hadrian’s Library and the Ancient Agora. Pantanassa church is known to be built in 10th century (church attendant told us – 8th century) as a katholikon of a now-vanished monastery. The church was known as the Great Monastery, and then later as monastiraki (“little monastery”), which eventually became the name of the whole area. St. Philothea helped to convert it from a monastery for men to a monastery for women. Since “pantanassa” means “Queen of All” in Greek (one of the traditional epithets of the Virgin Mary in Greek Orthodoxy), the Turks spared it during the invasion considering it to be bad luck to destroy anything that is associated with a name of the Virgin Mary. Luckily for us, Pantanassa church was open (free of charge, no photos) and an attendant, upon my inquiry, gave us a brief history of the church in Greek. This fascinating little place was packed with relics and icons and deserved a thorough future investigation. The largest structure erected by Hadrian (122 m by 82 m), the Library was built in AD 132-134 in a typical Roman Forum architectural style. It wasn’t a library as we known today, but more a cultural complex, with lecture halls, a transcription room, a library hall – known as the Bibliostasio – and possibly even a theater. The complex was built around a large rectangular inner garden with a pond. The main room of the library, the one that Pausanias called “oikimata”, was at the eastern part of the peribolos. It had 5 large halls and 4 smaller of secondary use. The main hall, the bibliostasio, was rectangular in plan, it had a tall, continuous podium of at least two storeys that supported a series of passageways. The walls on each storey had niches with wooden cupboards in which the books were kept. The total number of niches was 40, accommodating approximately 16,800 “books”. The wider, arched niches on the main axis probably housed statues of Athena and the deified emperor. The two halls at the left and right of the bibliostasio were probably subsidiary rooms (reading and transcription rooms), the corners served as lecture halls, while the smaller rooms at the back were staircases for the upper floor. The two corner halls of the eastern side of the monument were small somewhat sloping auditoria, used for lectures and text readings. They had marble seats and prohedriae (seats of honor) of a slightly curved form which were accessed by two staircases, along the long walls. The Library building was seriously damaged during the sack of Athens in 267 AD by the Germanic Heruli tribe and was later repaired by Herculius, the Prefect of Illyricum (AD 407-412). In the early fifth century a tetraconch church was constructed in the interior courtyard on top of ruins. There are two versions of who commissioned the church, either Herculius or the empress Eudocia, former Athenais, daughter of the sophist Leontius and wife of the Byzantine emperor Theodosius B (AD 425-430). The main church consisted of a central hall, which ended on the east side at a semicircular apse. On the west side there was a narthex, which provided access to the main church though three gates. There is also a large atrium, which had galleries on three sides except that next to the narthex. The church was destroyed in the late 6th century, at the same place two churches were built successively – a three-aisled basilica in the 7th century and a domed Byzantine church, known as the church of the Megali Panaghia, in the end of 11th-early 12th century. It was burnt and demolished in 1885, so that the first archeological excavations could take place. 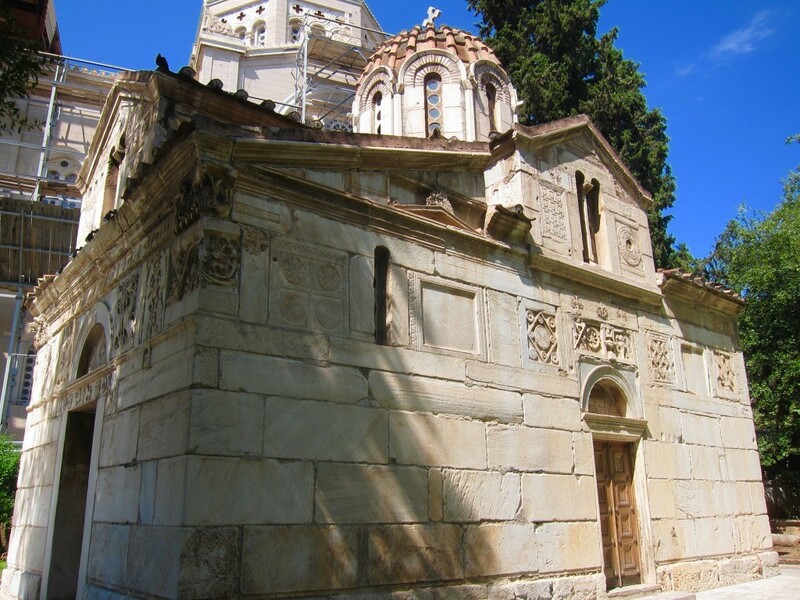 In the 12th century, the Chalkokondyli family built a small domed church of the not fully developed cross-in-square type dedicated to Saint Asomatos, adjoining part of the facade and propylon of the library. It was named Saint Asomatos because it was devoted to Archangel Michael by its synonymous founder, while because of its position at the Hadrian library’s propylon was named “Sta Skalia” (on the stairs). At the beginning of the 18th century the narthex fell into misuse and after 1843 the church was demolished. On the floor of the main temple, as well as in the narthex, were excavated eleven cist and vaulted graves, in which were buried mainly members of the Chalkokondyli family. Today, the only preserved visible remains of this church are the wall and wall paintings on the Library’s facade with depictions of the Prayer at Gethsemane, Judas’ Betrayal of Christ and the busts of Saints. There is a small exhibition area in the Library where the colossal (over 3 m high) statue of Nike in the type of the Victoria Romana is on display together with other finds from excavation in the area. It was found in 1988 built in the foundations of the Ottoman cistern that is located near the south wing of the Library. The statue – remarkably made of one single block of white Pentelic marble – is fairly well preserved. Nike is depicted at the exact moment of her touchdown, placing her right foot on the globe, her robe (peplos) waving, her upraised arms probably holding a shield. 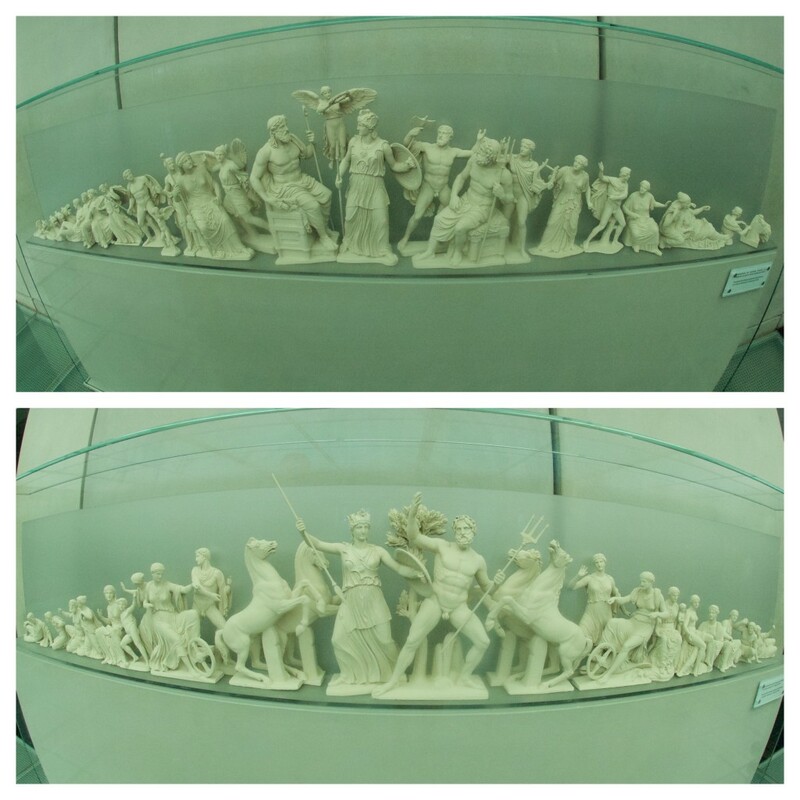 Statues of Nikai were often made with the aim of celebrating outstanding military victories, and it is possible that the Nike from the Library was set up to commemorate Augustus‘ victory against the Parthians (17-16 BC). The statue might have been part of a larger composition by the entrance of the Roman Agora, where once stood several statues of members of Augustus’ family. 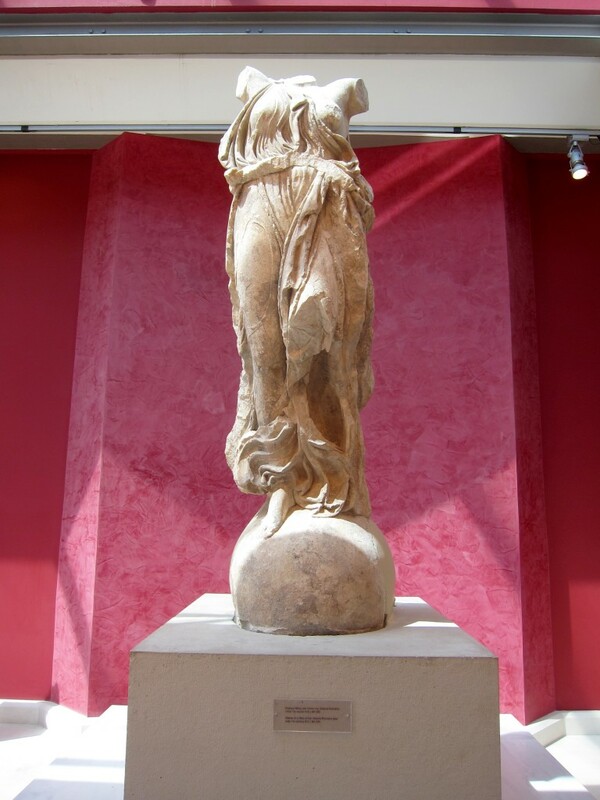 The statue of Nike was probably transferred into the area of the Library where it was later destroyed in one of catastrophic invasions of the Slavs towards the end of the 6th century AD, and was much later used in the construction of the Ottoman cistern, where it was eventually found. The most prominent remainder of the original library is a section of the outer wall, with huge Corinthian columns (made from marble from Karystos in southern Euboia) in front of the wall, on either side of the main entrance. Even though, very few of the Hadrian Library’s original structures remain, the informative and intelligent commentaries and plaques on the site were able to fill in the picture. We leisurely spent 30 minutes there, before proceeding to Roman Agora, just 5-10 minutes walk south. 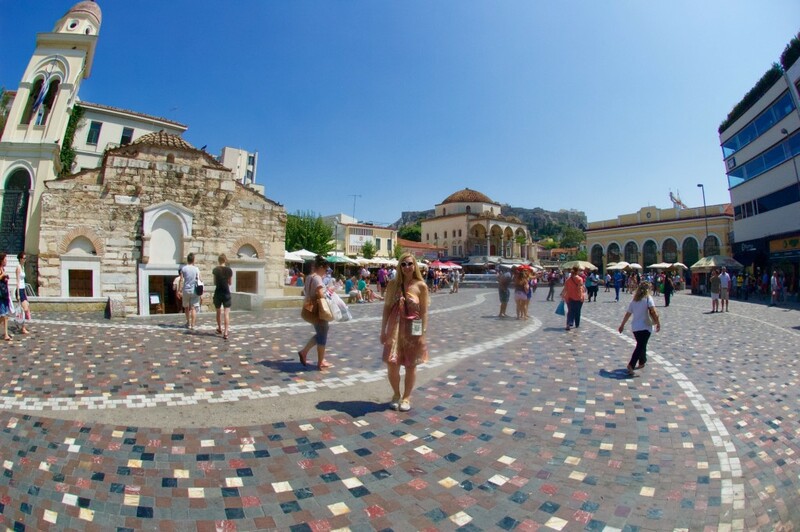 Agora means “market place” in Greek and there are few of them in Athens, most famous are the Roman Agora and just a short walk from it – the Ancient Agora. Two different places built in different epochs. Roman Agora (Roman Agora Map, free entry with Acropolis Pass) was built during the rule of the Roman Emperor Augustus, between 19-11 BC. 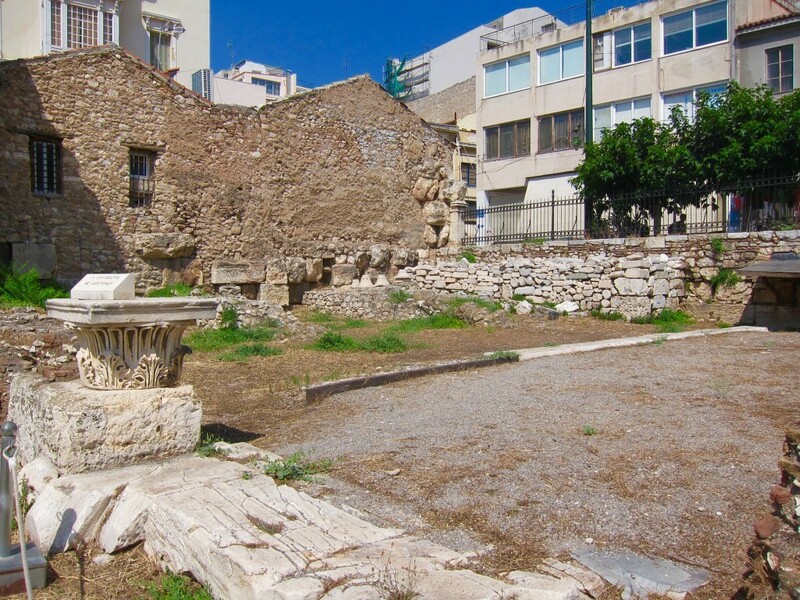 This small but important archeological site is evidence of the fascination that Roman Emperors had for the city of Athens. Roman Agora housed the commercial activities of Ancient Athens, when the ancient Agora’s central part was taken over by large buildings and there wasn’t enough space for the commerce. Entrance to the Roman Agora is from the west, through the well-preserved Gate of Athena Archegetis which is flanked by four Doric columns. The gate was dedicated by the Athenian deme in 11-10 BC, during the archonship of Nikias and sponsored by Julius Caesar. In the middle, there was a building (111 m by 104 m) with a large, rectangular open courtyard surrounded by stoas, shops and storerooms. It had two propyla – Gate of Athens from the west and the other propylon, on the east side, has Ionic columns made of grey Hymettian marble, with bases of Pentelic marble. The courtyard was paved during the reign of the emperor Hadrian (AD 117-138). It was at this time that the inscription containing the decree of Hadrian regulating the tax obligations of the oil-merchants was placed at the main door of the west Propylon. There are several other buildings in the Roman Agora, one of them is the so-called Agoranomeion, allegedly built in the 1st century AD. The wide staircase, the facade, with three archways, and parts of the north and south walls of the edifice are preserved. The inscription on the epistyle on the facade states that the building was dedicated to Athena Archegetis and the divi Augusti. The other extraordinary building is a well-preserved The Horologion of Kyrrhestos or Tower of the Winds (Aerides) that functioned as a sundial, weather vane, water clock and compass. 12 m high and 8 m in diameter, it was built in the 1st century BC by the astronomer Andronikos from Kyrrhos in Macedonia. It is an octagonal tower of Pentelic marble standing on the three-steps base. It has a conical roof, a cylindrical annex on the south side and two propyla. A bronze weather-vane in a shape of Triton (no longer preserved) on the roof indicated the directions of the winds, personifications of which are carved in relief at the top of each of the sides. Their names are inscribed beneath the cornice: Boreas, Kaikias, Apeliotes, Euros, Notos, Lips, Zephyros and Skiron. The rays of sun-dials are carved on each side, beneath the scenes of the winds and inside the building was a water-clock, which was operated by water running down from the Acropolis. In the early Christian period, the monument was used as a church, and in the 18th century, it was a Dervish monastery. Sadly, Tower of the Winds was all covered up for restoration. The rest of the ruins are hard to make sense of but there are 1st century Vespasianae (public toilets) to the right of the entrance which might catch your attention. The date at which the Roman Agora was destroyed in not known with certainty. In any event, after the raid by the Herulians (AD 267), when the city contracted within the late Roman wall, the commercial and administrative center was transferred from the Ancient to the Roman Agora and Hadrian’s Library, where it remained till the middle of the 19th century. In the Byzantine and post-Byzantine periods it was occupied by houses, workshops, churches and the Fethiye Cami or Mosque of the Conqueror (1456). 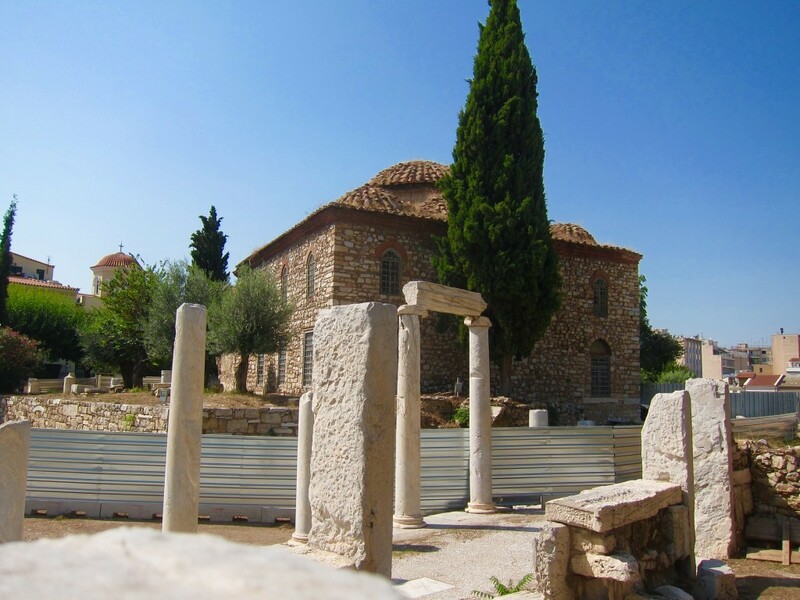 Ancient Agora is located just 100 meters south-west of Roman Agora, it is a pretty straightforward 10 minute walk. Note, Roman Agora was a mere warm-up in both, size and history. 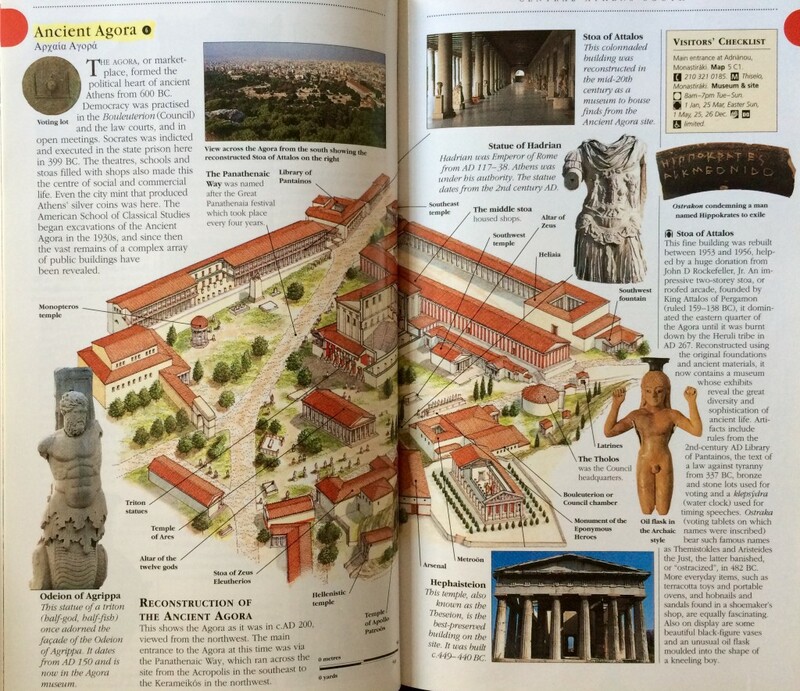 Please follow this Ancient Agora Map and the picture below (courtesy Eyewitness Travel Guides), otherwise, you get lost! Keep in mind that Agora, like every city’s market place continuously grew and developed, some buildings fell in ruins while other rose on top of them. When I refer to a building that is not on the map, I will mention the closest object to it on the map. Ancient Agora (free entry with Acropolis Pass), lying in a heart of ancient Athens, was the crowded administrative, commercial, political and social center, a true cradle of democracy, where grand ideas were born (Socrates expounded his philosophy here and in AD 49 St. Paul came here to spread Christianity). First developed in the 6th century BC, the Agora was destroyed by the Persians in 480 DC, however, it was rebuilt almost immediately and flourished till AD 267 (yes, Herulian tribe got it too). In the 10th century AD, following a long period of desertion, a Byzantine neighborhood grew up in the Agora area. During Ottoman time, it was a residential area which was demolished after Independence for archeological reasons. 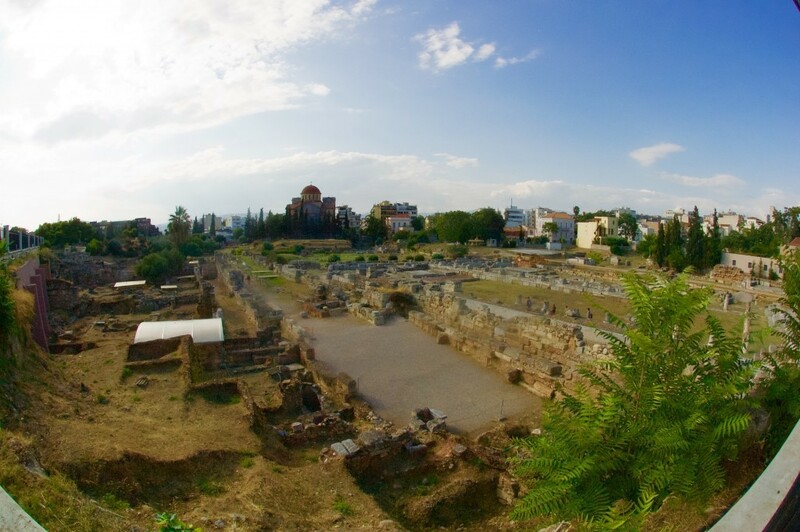 This site, with a multitude of temples and public buildings, housed the city’s most important events from the Mycenaean era until late antiquity. We entered from the south-east corner (p.28 on the map) and walked clock-wise. Please allow yourself at least 2-3 hours to explore this place in details. Just as we walked in, there was a Church of the Holy Apostles (near p. 27), an early 10th century church, built to commemorate St. Paul’s teaching in Agora. The original floor-plan of the church was that of a cross, with apses on the four sides and a narthex on the west side. The disposition of the tiles on the outer walls show “Kufic” decorative patterns of eastern origin. Building went through 4 different re-incarnations and among the many medieval monuments, known to have existed in the Agora, it is the only one preserved. The few surviving wall-paintings in the central aisle are of the 17th century, however, it contains the paintings from other nearby churches as well. The same area contained at some point the East stoa, the Library of Pantainos, the Nymphaeum and a temple. 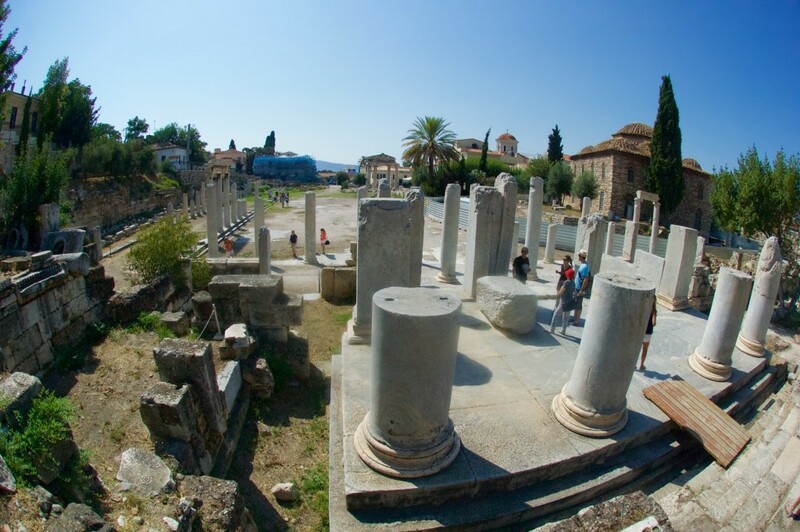 Continuing along the southern border of the Ancient Agora is Middle Stoa and South Square (p.12 and 17). Middle Stoa is the largest building in the Agora, 147 m long and 17.5 m wide, oriented east-west, with a Doric colonnade on each of its four sides. It is assumed that at the two corners of the monument the intercolumniations were covered with high, thin panelling (like that of the interior Ionic colonnade), which separated the Stoa into two passageways of equal width. In the east section, steps and three column-drums are preserved in their original position. In Roman times the flat terrace at its north was used as the shortest way of crossing the Agora from east to west. It was destroyed by fire in AD 267. A large fountain house (p.15) was constructed in the south-west corner of the Agora near a major crossroad of the ancient city. The building is in a poor state of preservation. It consists of a large L-shape draw basin with a floor area of just over 100 sq m surrounded by a colonnaded porch with unfluted columns. 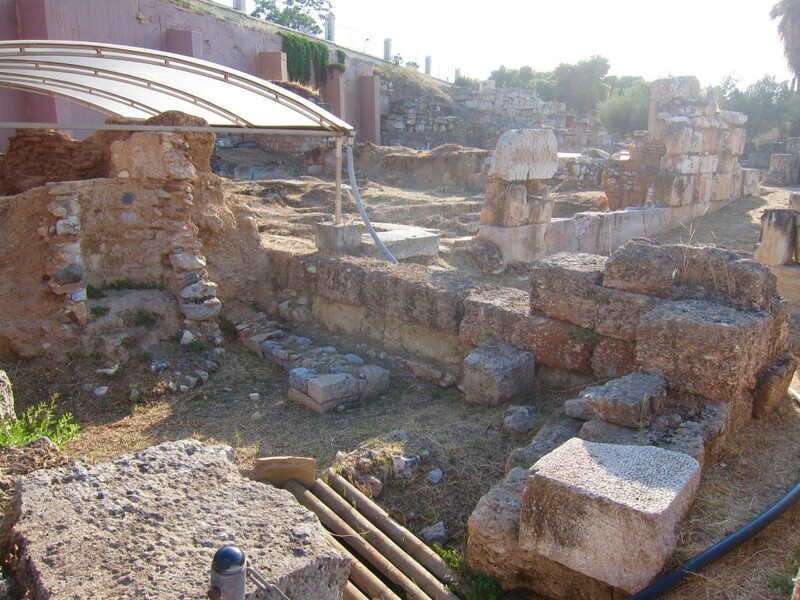 Water was brought in a great stone underground drain, which has been traced to the east for some 220 m. The new fountain house could be an indication that Athens may have suffered a period of severe drought in the middle of the 4th century BC. At the end of of the 4th century, a room was added at the north-west of the building, where the hydriai could be filled with water directly through the pumps. In the 2nd century BC the fountain house was further modified. The building was destroyed by the Roman troops under Sulla in 86 BC. Heading north across from the fountain, there is one of the more significant public buildings of the Agora – Tholos (p.10), a round structure with six interior columns and a propylon at the east that was added in the 1st century BC. It was the headquarters of the 50 prytaneis who served as the executive committee of the Boule (Council) for an interval of 35-36 days, after which they were replaced by prytaneis from another tribe, so that by the end of the year representatives of all ten tribes had a turn in the administration. Those in office dined in the Tholos, with 1/3 of them spending all night in the building, so that there were always responsible officials on hand (!!!) 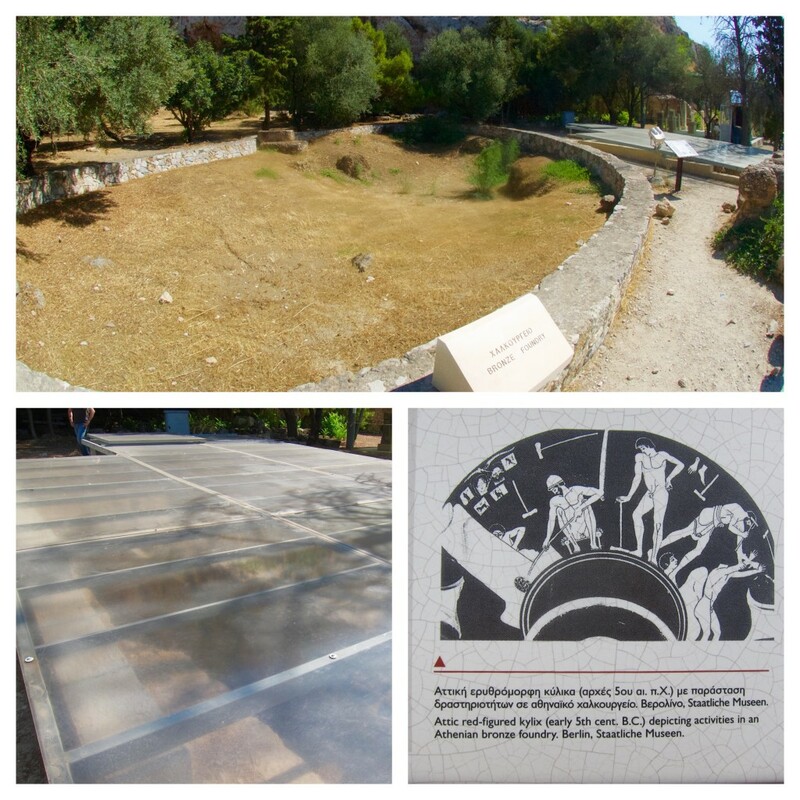 In the Tholos were housed the official weights and measures of the Athenian state. It was built atop a pre-existing building complex of the mid-6th century BC, which had a similar functional purpose, and went out of use around AD 400. Slightly north of Tholos is the New Bouleuterion and Propylon (near p.8), a rectangular prostyle building build in the late 5th century BC. It served as a new meeting place of the 500-member Boule (Council), made up of 50 citizens from each of the ten tribes, chosen by allotment each year (divisions into which, for administrative and political reasons, Cleisthenes in 507 BC organized the citizens of Athens). As a legislative body the council prepared the bills that afterwards were voted on in the Assembly of all citizens (Ekklesia of the Demos). For a time the New Bouleuterion functioned along with the Old Bouleuterion, which apparently due to lack of space came to be used only as a repository of state archives. The partial preservation of the New Bouleuterion at ground level makes it difficult to establish the arrangement of the benches on the interior. It was definitely smaller than the Old building but more sophisticated, with an amphitheater-like system of 12 levels of semicircular benches. 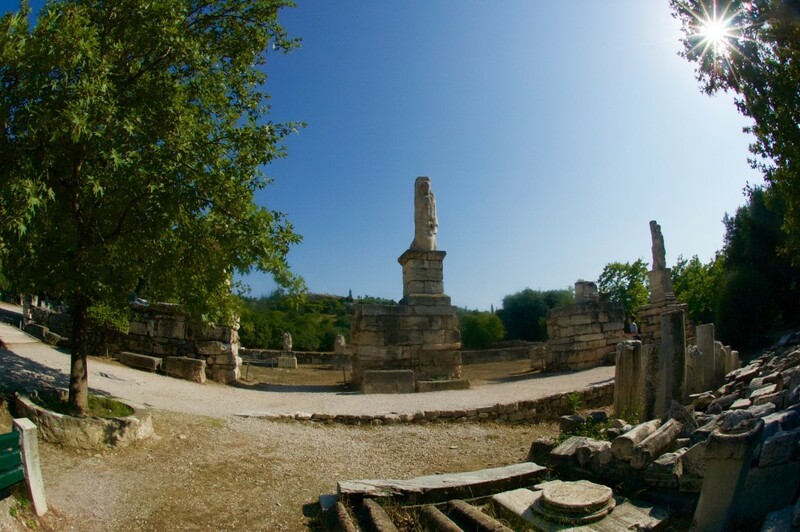 In the second half of the 4th century BC the entranceway acquired a monumental propylon of the Ionic order, that stood immediately south of the Old Bouleuterion. Old Bouleuterion and Metroon border the New Council building. Old Bouleuterion (p.6), built in early 5th century BC, was a large, nearly square building situated in part over the earlier building complex (early 6th century BC) that may have served as a meeting place of an early Council. 500-member (replaced an earlier 40-member body) Cleisthenic Boule met every day in the Bouleuterion to prepare the legislative bills. The building was the site of the worship of the Mother of the Gods and housed not only her cult statue (attributed to Agoracritus or less probably to Pheidias), but also the public archives of the city. 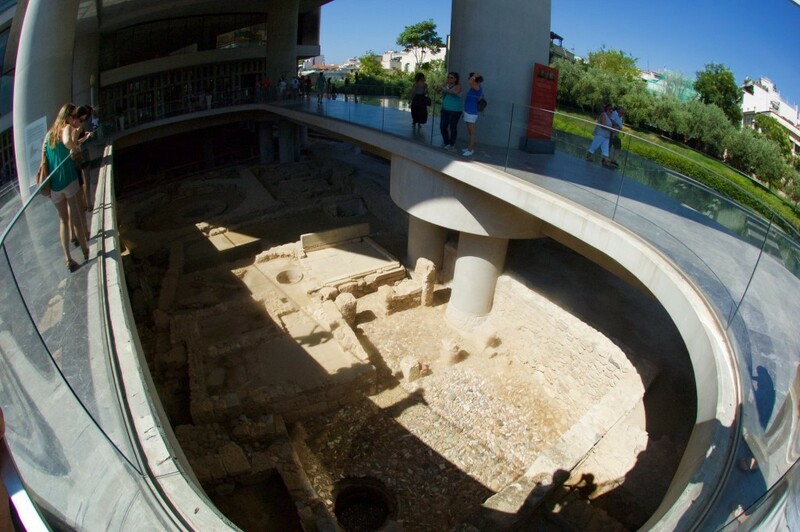 Its foundations are preserved under the Metroon, a building built in 150 BC. It is a prostyle building with 4 rooms, inside which were kept public documents: decrees, law codes, financial records, catalogues of ephebes and of votives, along with legal documents. Also, the second room from the south housed the temple of the Mother of the Gods, from which the name of the building, Metroon, derives. Her altar probably stood immediately east of the Metroon, on “West Street”. From its destructions in AD 267 until Byzantine times, parts of the building probably served as a tavern, a synagogue and an oil-press. 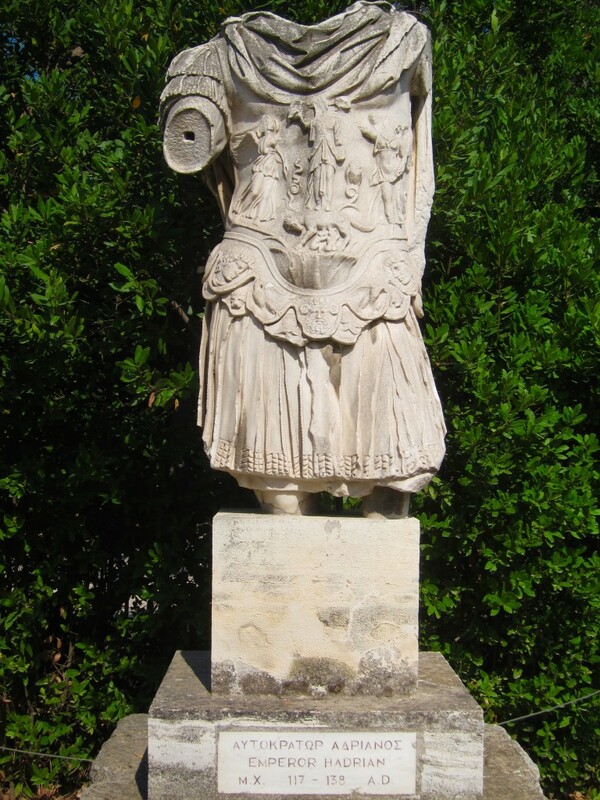 A statue of the Roman emperor Hadrian was located near the Metroon, facing the government buildings to the west. Along the Old Bouleuterion, across the street, ran a gallery of the Monuments of the Eponymous Heroes (p.7). A pedestal, built in 330 BC, was 16 m long, enclosed by stone posts connected to one another by three wooden beams. It housed the bronze statues of the mythical heroes of each of the ten Athenian tribes (such as Erechtheus, Aegeus, Pandion, Acamas, Hippothoon, Aias (Ajax) etc). A fluctuation on the number of tribes over the years necessitated the removal or addition of statues. On the sides were hung wooden boards with announcements meant for the citizens of Athens, legal decrees coming up for vote, lists of citizens conscripted into the army, civic honorary distinctions, forthcoming lawsuits. Between the building of Old Bouleuterion and the Monuments of the Eponymous Heroes, along the road runs the Great Drain (between p.6 and p.7). 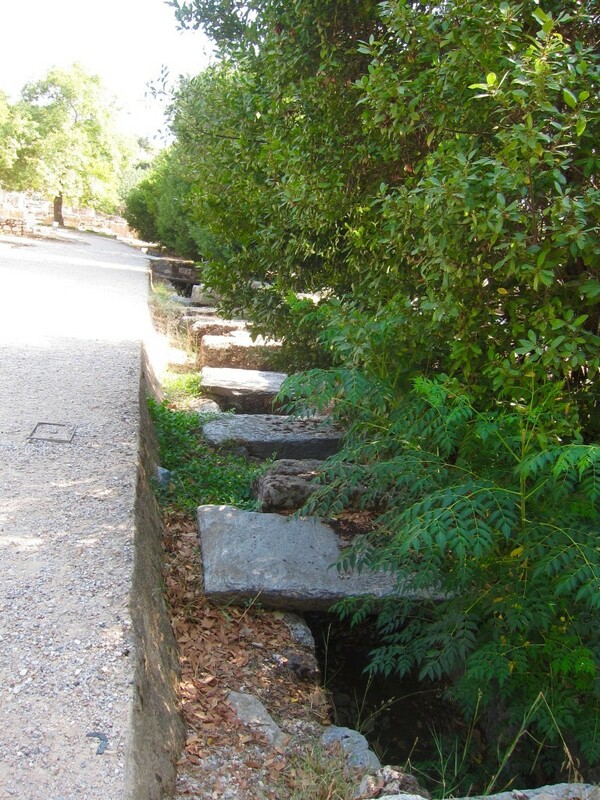 Built in early 5th century BC, drain has width and breadth of 1 m and its purpose was to convey to the Eridanos River waste from the buildings of the Agora and rainwater from the surrounding hills. At the beginning of the 4th century BC two branches were added immediately south of the Tholos to bring rainwater and waste from a broader section of the Agora into the main channel. We obviously couldn’t skip the most imposing building rising above the western part of the Agora, one of the first Pericles’ projects – Temple of Hephaistos (p.1). Built between 460-415 BC, a Doric peripteral temple, with pronaos (fore-temple) cella (inner shrine), and pisthonaos (rear temple), is the best preserved of its type in the Greek world. It occupied the crest of the Kolonos Agoraios Hill and was designed by an unknown architect (some say by Ictinus) probably in honor of Hephaestus, patron of metal-workers, and Athena Ergane, patroness of potters and crafts in general. It is built mostly of Pentelic marble, with its decorative sculpture in Parian. The east side, which faces the Agora, received special attention: it has ten metopes showing the Labors of Herakles, and the four easternmost metopes showing the Labors of Theseus. From these last, the temple and its surroundings took the name “Theseion” in recent years. The friezes show a scene from the Battle of Theseus and the Pallantides and the Battle of the Lapiths and the Centaurs. 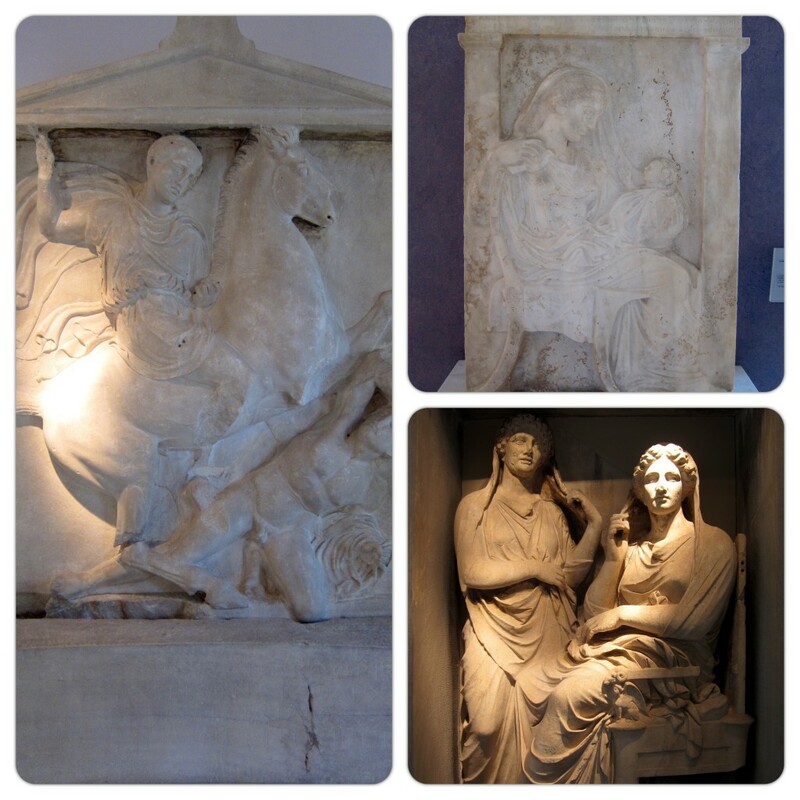 Fragments of sculpture from the pediments are on display in the Museum of the Stoa of Attalos. The east pediment seems to have shown the Deification of Herakles, his entry onto Mount Olympus. The two bronze cult statues of the cella are believed to be the work of Alkamenes (appx. 421-415 BC). The temple was converted into the church of St. George probably in the 7th century. 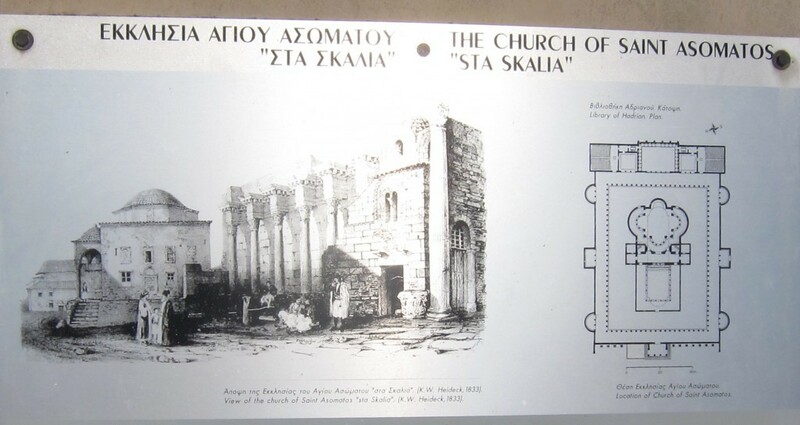 In the early 19th century the church was used as a burial place for Protestants and for many European Philhellenes who died in the Greek War of Independence in 1821. The building remained in use through 1834, when it was the site of the official welcome of King Otto, the first king of the modern Greek state. Since then, until the 1930’s it was used as a museum. After spending 2 hours on the hot July sun, it was a pleasure to quietly sit in the garden surrounding the Temple and enjoy the best views of Ancient Agora and the Acropolis. Upon coming down from the hill, we proceeded to the Odeion of Agrippa (ca 15 BC) (p.22), a grand and luxurious building designed for musical performances; it is known in the ancient sources as the “Odeion”, the “Kerameikos Theater” or the “Agrippeion” after its donor, Marcus Vipsanius Agrippa, son-in-law of the Emperor Augustus. The central part of the building, which rose, as if a separate structure, above a surrounding stoa, included an oblong rectangular stage, a semi-circular “orchestra” and an auditorium built like an amphitheater, with space for around 1,000 persons. The building originally had a pitched roof, without interior support, which collapsed around AD 150. Then the building was reconstructed with the addition of a transverse wall that reduced the seating capacity almost by half. The north face took the form of a stoa, the epistyle of which supported six colossal statues of Tritons and Giants. The building was destroyed by fire in AD 267. Gymnasium or “The Palace of Giants” (AD 410-530) was an impressive structure and included a section of the central area of the Agora, covering older buildings such as the Odeion, parts of the Middle Stoa and the South Stoa. It contained a bathing establishment, surrounded by several rooms, two colonnaded courtyards, and a garden at the south, covering, in all, 13,500 sq m. Its entrance facing the Panathenaic Way was monumental, with a triple opening and four pillars on which were placed the colossal statues of the Triton and Giants from Odeion. Originally the building was considered a gymnasium, but it was probably a palace, seat of a high administrative official. Just east of the Stoa of Attalos, there is a Monopteros (p.24), built in mid 2nd century AD; it is a small circular building, 7.17 m in diameter, surrounded by a colonnade of eight unfluted monolithic columns of green marble, which rise from a three-stepped foundation. The roof, its form that of a tholos, bore a richly decorated geison of Pentelic marble. The structure is usually considered to have housed the statue of some deity or hero, but it is likelier that it was a spring-house. It was destroyed in AD 267. Next to the monopteros was the bema – an elevated platform used as an orator’s podium. And finally, the substantial Stoa of Attalos (p.23) which occupies the entire eastern side of the Agora. Built in 159-138 BC, the Stoa was a gift of Attalos II, Kind of Pergamon. The building was 120 m long and 20 m wide and had two floors with a second series of columns on the interior and 21 shops at the back of both floors. 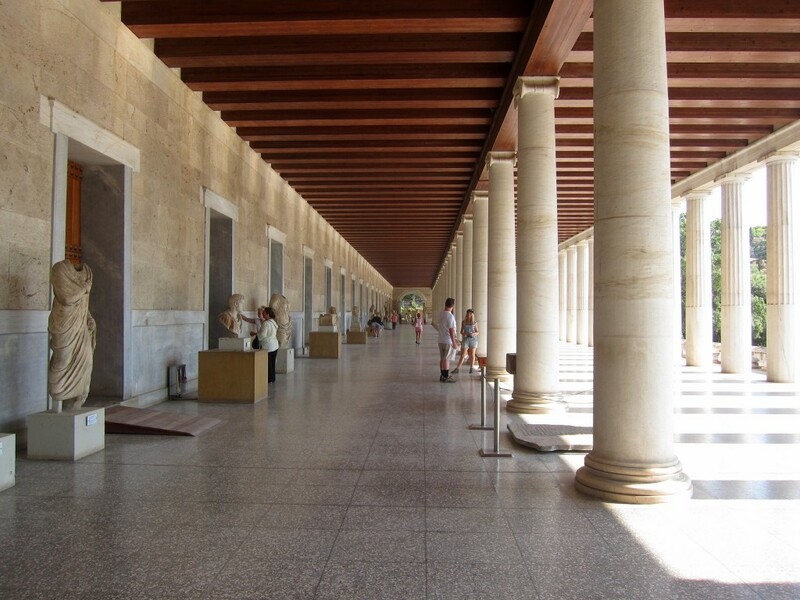 The Stoa of Attalos was a place for Athenians to meet, walk and to do business. The Heruli in AD 267 destroyed it and its ruins were incorporated into the Late Roman Fortification Wall. The restoration, based on studies by the architect John Travlos, was carried out in 1953-1956, sponsored by John D. Rockefeller Jr. The Stoa of Attalos houses the Museum of Ancient Agora, displaying clay, bronze and glass objects, sculptures, coins and inscriptions from the 7th to the 5th century BC, as well as pottery of the Byzantine period and the Turkish conquest. I admit, whether because of the weather or tiredness, we didn’t find/visit Arsenal (p.2), Temple of Apollo Patroos (p.5), Stoa Basileios (p.3), Poikile Stoa (p.18), Altar of the Twelve Gods (p.20), Basilica (p.19) and Temple of Ares (p.21). But most of all I regret of not locating the Stoa of Zeus Eleutherios (p.4), one of the places where Socrates expounded his philosophy. Oh well, there is always another time! We left from the same entrance where we came in and proceeded towards the Areopagus hill. 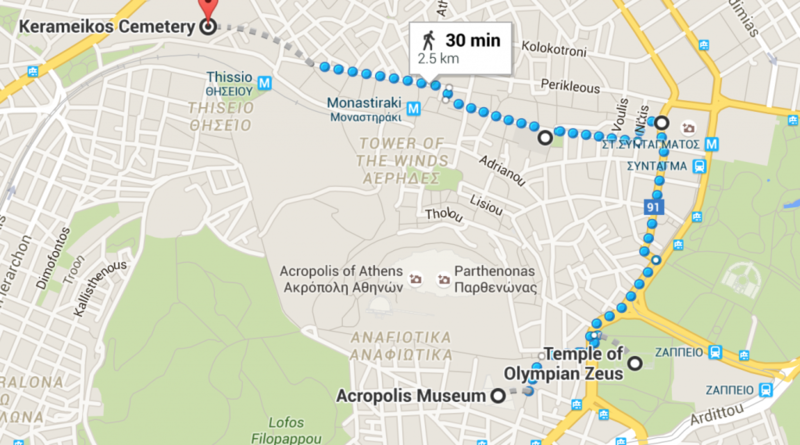 It sounds a bit complicated but the route is easily distinguishable, you just aim for the Parthenon on the south. A few minutes walk, on your left (don’t miss!) the “Eleusinion in the City” used to dominate the north slope of the Acropolis. It is a shrine sacred to the mystery religion of the goddesses Demeter and Kore (Persephone), together with their mortal counterpart Triptolemos. These Eleusinian deities were already worshipped here in the 6th century BC, in an open-air shrine surrounded by a wall. In the 5th century, a small rectangular Ionic temple was built in a shrine, oriented north-south. Of this Ionic tetrastyle amphiprostle temple, with an inner shrine and shallow pronaos are preserved only the groundwork of three sides. In the 4th century BC the need to reinforce the embarkment of the temple led to the construction of a stronger retaining wall. The area north of the temple, which is at a lower level, acquired a number of rooms in the early Roman period, which have been interpreted as shops or as storerooms for grain for the temple. In the corners at the east are round bases for dedications of the Hellenistic and early Roman periods. On the south and farther uphill from the Eleusinian stand a section of the Hadrianic aqueduct (2nd century AD) and remains of the round building ca. 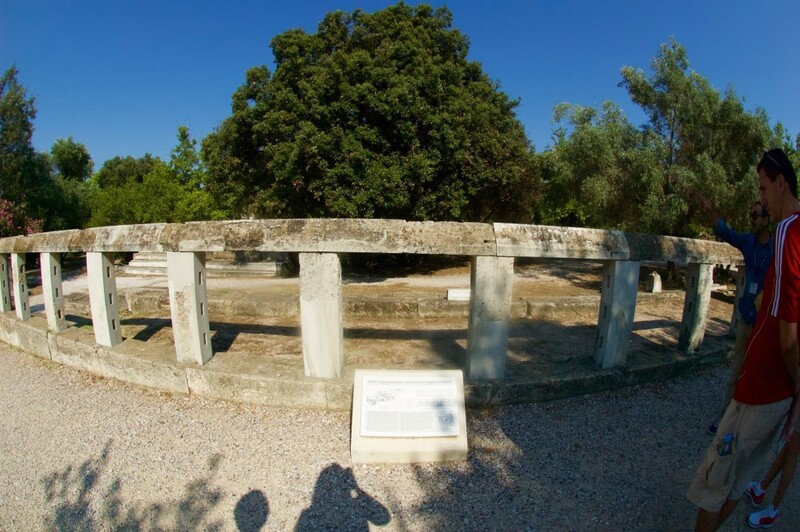 8 m in diameter, built in the 2nd century BC and thought to be a shrine of Pluto. The shrine was bordered by the Panathenaic Way on the west and the two branches of the “Steed of the Tripods” on the north and south. The Panathenaic Way extended from the Dipylon in the Kerameikos to the entrance to the Acropolis, cutting diagonally through the central square of the Agora. 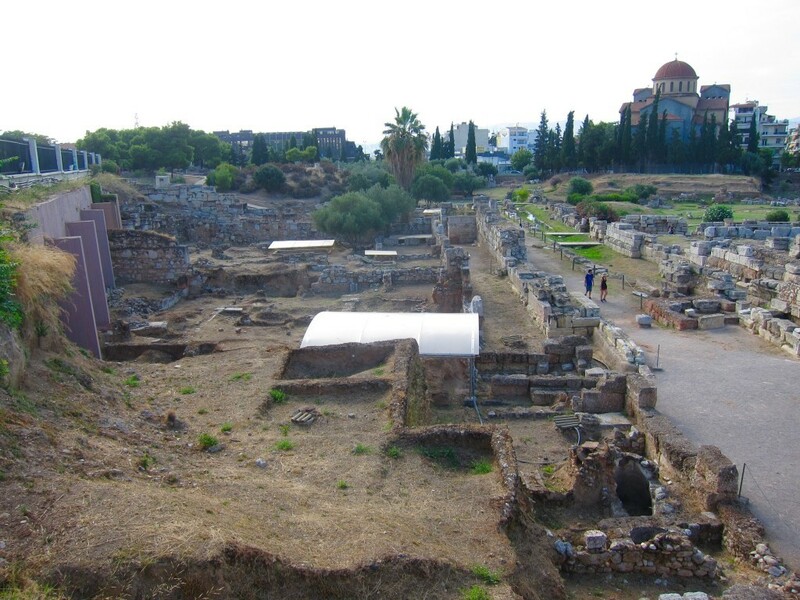 It was mainly of soil, but in the 1st and 2nd centuries AD the section in the north-east corner of the Agora and that along the west side of the Eleusinion was paved with stone. 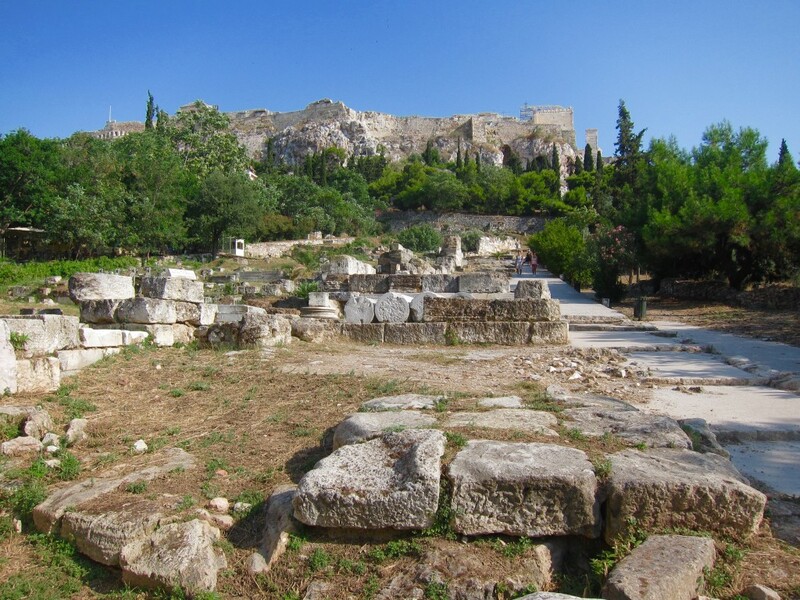 Once you see lots of people crowding in around a small hill area, you know, you are on the Areopagus Hill. This rocky outcrop (115 m), derives its name probably from Ares, the god of war, and the Ares-Erinyes or Semnes, underground goddess of punishment and revenge. A judicial body, the Areopagus Council, met on this hill to preside over cases of murder, sacrilege, and arson (though it is hard to imagine). It was also a place of religious worship, with many sanctuaries of Semnes or Eumenides, probably located in a cavity at the north-east side of the hill. In the Mycenaean and Geometric periods (1600-700 BC) the northern slope of the hill served as a cemetery, with both vaulted tombs and simple cist graves. From the 6th century BC onwards the hillside as a whole became a residential quarter belonging to the fashionable district of Melite. Cutting still evident in the bedrock attests to the district’s many roads, wells, drains, reservoirs, floors and irregular buildings. By the Late Roman period (4-6th century AD) four luxury houses, which probably served as philosophical schools, had replaced the houses of the Classical era. The Areopagus also associated with the spread of Christianity into Greece. 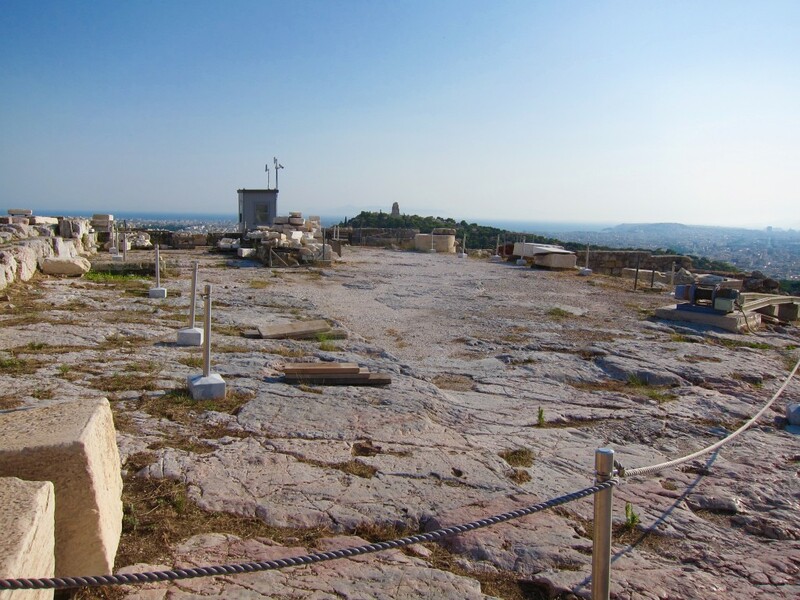 Some time near the middle of the 1st century AD the Apostle Paul is said to have converted a number of Athenians by teaching the tenets of the new religion from the summit of this hill. In AD 51 St. Paul delivered his famous “Sermon to an Unknown God” from the hill and gained a conversion of Dionysius the Areopagite, who later became the patron saint of the city of Athens, and according to tradition, was the city’s first bishop. The church of St. Dionysius the Areopagite was a three-aisled basilica with a narthex at west, central apse, diakoniakon and prothesis. Built in the middle of the 16th century, it was probably destroyed by an earthquake in 1601. The church and grounds were completely enclosed to the north and west by the monumental Archbishop’s Palace. This two-storey Palace was built between the middle of the 16th and end of the 17th century and consisted of a complex of rooms which included warehouse, a kitchen, a dining hall, and two winepresses. Remains of the church as well as the Archbishop’s Palace (16th-17th century) are still preserved on the northern slope of the hill. The nearby “cave of the Furies” inspired the playwright Aeschylus to set Orestes trial here in his play Eumenides (The Furies). Persians and Turks used the hills during their attack on the Acropolis citadel but there is little left to see on the hill right now except for lots of tourists and slippery stones. Nevertheless, it offers one of the most beautiful views of the Ancient Agora and the Acropolis, better than the Acropolis itself (don’t burn me at stake for saying that, but it is true). (picture credit: Eyewitness Travel Guide, Athens – I find this picture to be more visual and easy to understand). 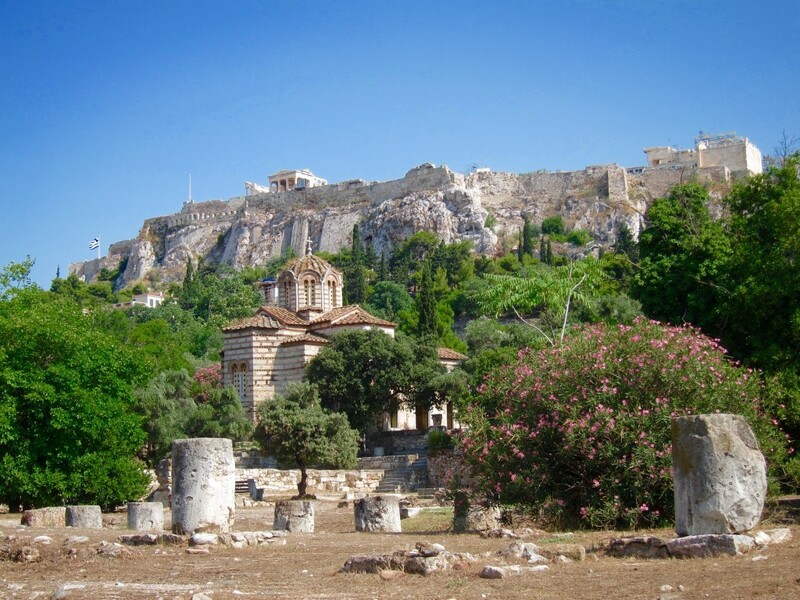 For many centuries the Acropolis was the most important religious center of the city. First traces of occupation go back to the Neolithic period (4,000-3,000 BC). In Mycenaean times it was the seat of the king, whose megaron stood roughly on the site on where the Erechtheion was built many centuries later. After the 11th century BC it became the home of the cult of Athena, patron goddess of the city that took her name, and of other gods, and was adorned down to the end of antiquity with majestic temples, brilliant buildings and a vast number of votive monuments. People used to live on the Acropolis up till the late 6th century BC, but in 510 BC the Oracle of Delphi declared that this place should be the “only god’s land”. After the place was destroyed by Persians in 480 BC, Pericles set about his ambitious artistic plan to build the Parthenon, the Propylaia and, a little later, the temple of Athena Nike and the Erechtheion. 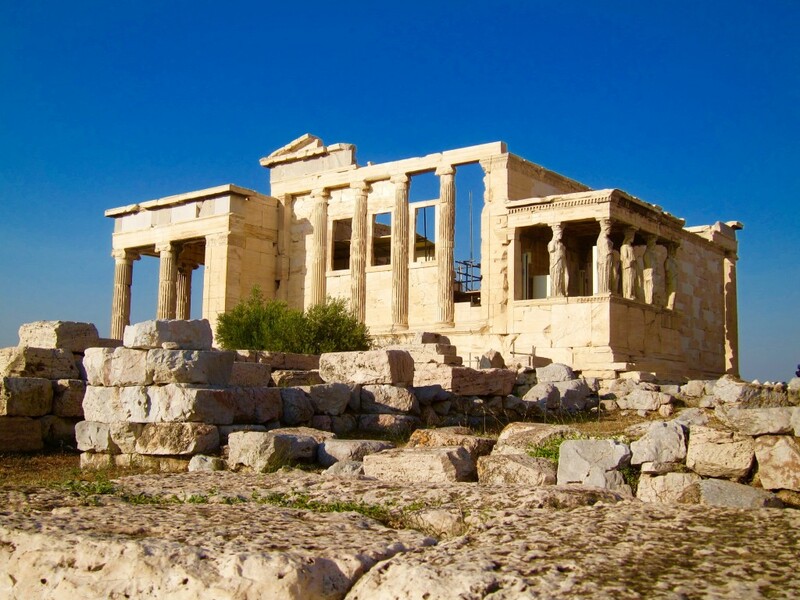 With no shortage of money or talent, all structures were erected between 447 and 406 BC, remaining to the present day the witnesses to the Greek Classical civilization. Time, people and the course of history weren’t very kind to the Acropolis – multiple occupations, pilfering by foreign archeologists (I get you, Lord Elgin), inept prior renovations etc. took their toll on the monuments. Needless to mention a real “blow” of 1687 when the Venetians opened fire at the Acropolis where the Turks stored their gun powder, causing a massive explosion. 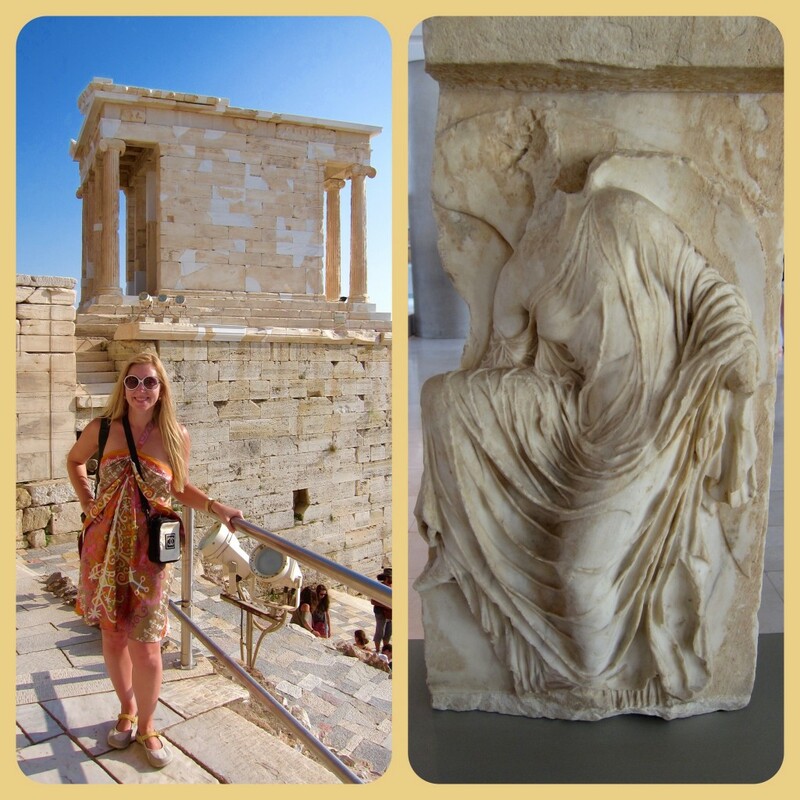 There are over a couple of dozen monuments on the Acropolis and even though I wouldn’t be able to describe them all, I dutifully expose as many of them as possible. 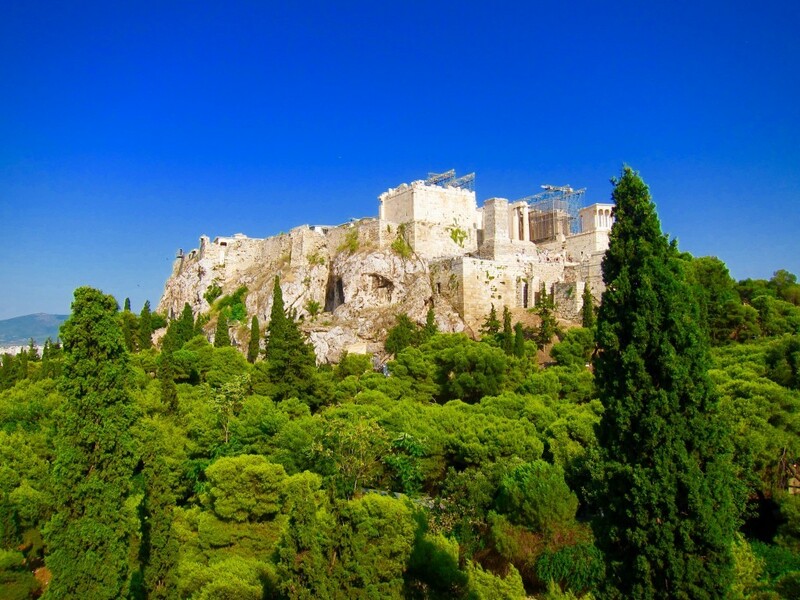 There are two entrances to the Acropolis, one is on the west side, just as you leave the Areopagus Hill and another is from the south-east corner, next to the Acropolis Museum. We entered through the west gate and exited through the eastern one. Even before we approached the main entrance, on the right side we could see a splendid structure of Odeon of Herodes Atticus (p.17), one of the two theaters on the slopes of the Acropolis. 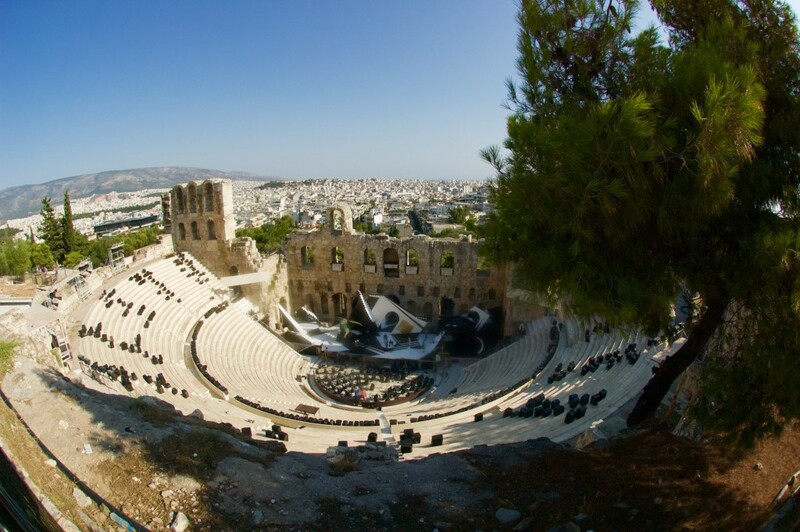 This Roman theater seats about 5,000 spectators and is very much in use today as a stage for drama, music and dance performances held during the Athens festival. It was built by the Roman consul Herodes Atticus between AD 161-174, in memory of his wife Regilla, by hollowing out of the rock on the southern slope of the Acropolis. The theater was originally enclosed by a roof made of famous Lebanese cedar, which provided shelter and better acoustics. Behind the stage, its distinctive colonnade once contained statues of 9 Muses. It was destroyed by the Herauli tribe in AD 267 and first time excavated in 1857-1858 (completely restored in 1950-1961). In modern time, the theater witnessed the performances of the world-stars like Maria Callas, Frank Sinatra, Luciano Pavarotti, Sting, Andrea Bocelli, Diana Ross, Liza Minelli and many more. Due to the time constrains, we weren’t able to attend any plays at the Odeon, but it is something to be added to the “bucket list”. Once inside (free entry with Acropolis pass), a short way along the path, there is a west gate – Beulé Gate (near p.21) on the left, named after the French archeologist Ernest Beulé, who uncovered it in 1852. It was built in AD 267, after the raid of the Heruli and as a part of the Acropolis fortification, on the base of the monumental marble stairway, dated to AD 52, which leads to the Propylaia. It is flanked by two rectangular towers and incorporates stone from earlier building, such as the choregic monument of Nikias (319 BC) that was situated near the Stoa of Eumenes on the south slope of the Acropolis. Part of the original monument’s dedication is still visible over the architrave. There is also an inscription identifying a Roman, Flavius Septimius Marcellinus, as donor of the gateway. The gate was in used for several centuries, while rooms were added to the inner side for protection from the weather for the guards and those who entered the castle. Probably in the 6th century, the height of the door opening was reduced with the placement of a lintel. In addition, in the 11th century an upper floor was built on the gate to provide better protection of the castle entrance and the lintel was decorated with an eagle and a snake in relief. At the time of the Frankish occupation of the De la Roche dukes (1204-1311), the usage of the gate ceased, whereas during the Ottoman occupation, in 1686, the Turks destroyed the Temple of Athena Nike, then used the marble to build a bastion for artillery over the gate. 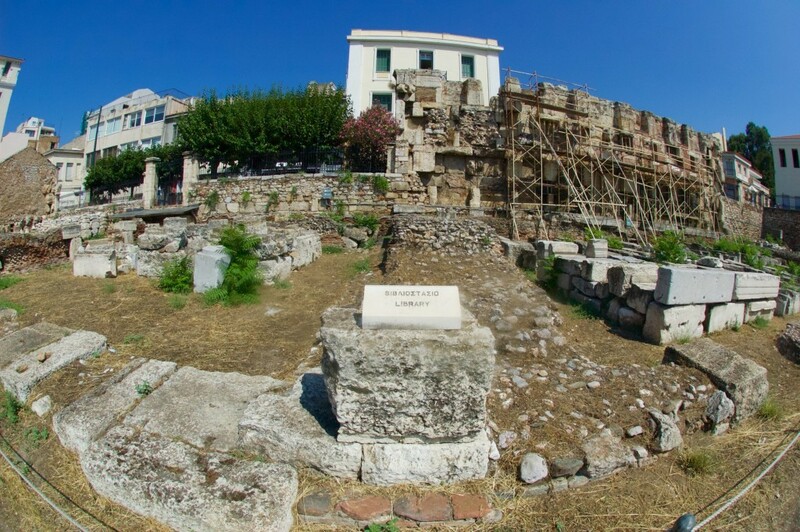 The 8.9 m tall pedestal on the left, halfway up the zigzagging ramp leading to Propylaia, once supported a bronze life-size quadriga (Monument of Agrippa, p.21), dedicated by the Athenians to Marcus Vipsanius Agrippa, son-in-law and general of the Roman Emperor Octavian Augustus. Agrippa was a benefactor of the city, as indicated by the incised honorary inscription on the western face of the pedestal. Today only the pedestal is preserved. The quadriga, which would have been mounted by Agrippa, is gone. The dedication was made between 27 BC when Agrippa became consul for the third time and 12 BC, the year of his death. Important to say, that the monument was not originally intended for the Roman general. The archeological features of the pedestal, the technical details of its upper surface, as well as traces of an earlier defaced inscription indicate that the monument was erected in the first half of 2nd century BC and originally bore the chariot of one of the Pergamene kings, probably Eumenes II or Attalus II. The deme dedicated the monument in order to commemorate a victory of the Pergamene Kings in a chariot race in Panathenaic Games. The Pergamene Kings benefited the city by funding the erection of two important public buildings, the Stoa of Eumenes to the south of the Acropolis and the Stoa of Attalos in the Ancient Agora. Across from the monument of Agrippa, there is a small but beautiful Temple of Athena Nike (p.1) (goddess of Victory), built in 426-421 BC to commemorate the Athenians’ victories over the Persians. Designed by Callikrates, the almost square temple stands on a 9.5 m bastion (which has been used as both observation post and an ancient shrine); built of Pantelic marble, it has four graceful Ionic columns 4 m high at each portico end. Legend records the temple site as the place from which King Aegeus threw himself into the sea, believing that his son Theseus had been killed in Crete by the Minotaur. The temple frieze had scenes from mythology, the Battle of Plataea (475 BC) and Athenians fighting Boeotians and Persians. Parts of the frieze are in the Acropolis Museum, as are some relief sculptures, including the beautiful depiction of Athena Nike fastening her sandal. The temple also housed a wooden statue of Athena. The temple of Athena Nike was taken apart and put back in 3 times: the Turks dismantled it in 1686 in order to use the platform for the cannon, it was carefully reconstructed in 1836-1842, but then it was taken apart again 60 years later when the platform started to crumble. In 1998 the temple was dismantled one last time due to the faults in its floor, it was “rebuilt” in 2010 according to the information resulting from more recent research. The Propylaia (p.2), the monumental entrance of the sanctuary of the Acropolis, was built at the west edge of the hill in the frame of the building plan of Pericles. The building’s architect was Mnesikles, who applied ingenious and innovative architectural solutions, making Propylaia as architecturally brilliant as the Parthenon itself. Its construction (437-432 BC) was interrupted by the outbreak of the Peloponnesian War, and as a result the original structure remained unfinished. The Propylaia comprises a rectangular central building divided by a wall into two porticoes. Two wings flank the main building, the north wing was home to the pinakothiki, an art gallery and the southern wing was the antechamber to the Temple of Athena Nike. The porticoes were punctuated by five entrance doors, rows of Ionic and Doric columns and a vestibule with a blue-coffered ceiling decorated with gold stars. The middle gate, which was the largest, opened into the Panathenaic Way. The Propylaia is aligned with the Parthenon – the earliest example of a building designed in relation to another. It remained intact until the 6th century AD when the south wing was transformed into a single-aisle Christian basilica. In the Medieval times, Frankish and Florentine rulers converted the Propylaia into a palace and a tall tower was built at the south wing. During Ottoman occupation, in 1640, the building was either struck by a lightning or a cannonball which blew up the gunpowder stored there and caused extensive damage to the monument. The Medieval and later remains were removed during the excavations of the Acropolis in the the 19th century, in order to reveal the Propylaia of the Classical period. Reconstruction took place in 1909, 1917, after WWII and the latest one was completed in 2009. South-east of the central building of the Propylaia is situated a small shrine dedicated to Athena Hygieia (Health) and Hygieia, the daughter of Asklepeios, who was the god of medicine. The cult of Athena Hygieia on the Acropolis is dated since 6th century BC according to epigraphical testimony, whereas the cult of Hygieia is dated around 420 BC. In the shrine, part of the rectangular altar and the cylindrical marble base of a bronze statue of Athena Hygieia made by the Athenian sculptor Pyrrhos were preserved. 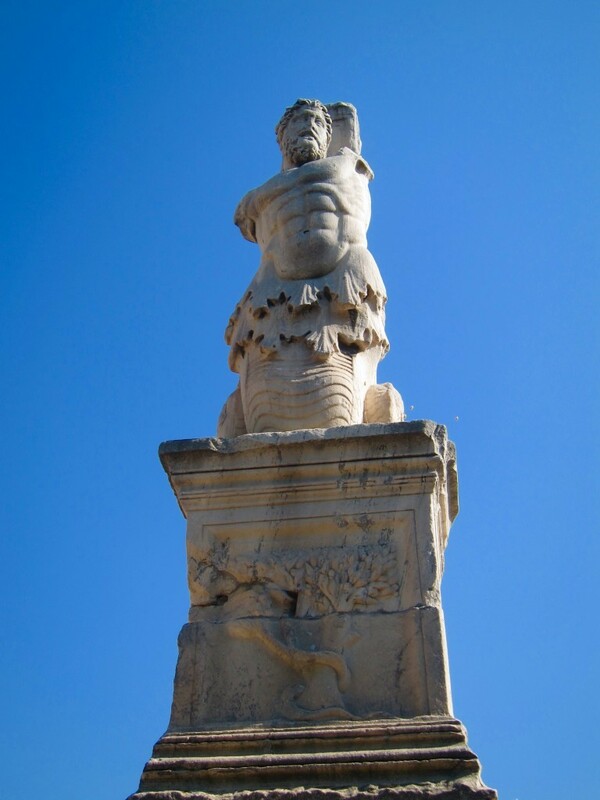 According to tradition (Plutarch, Life of Pericles) the statue was dedicated for the salvage of the workman who had suffered an accident during the construction of the Propylaia. 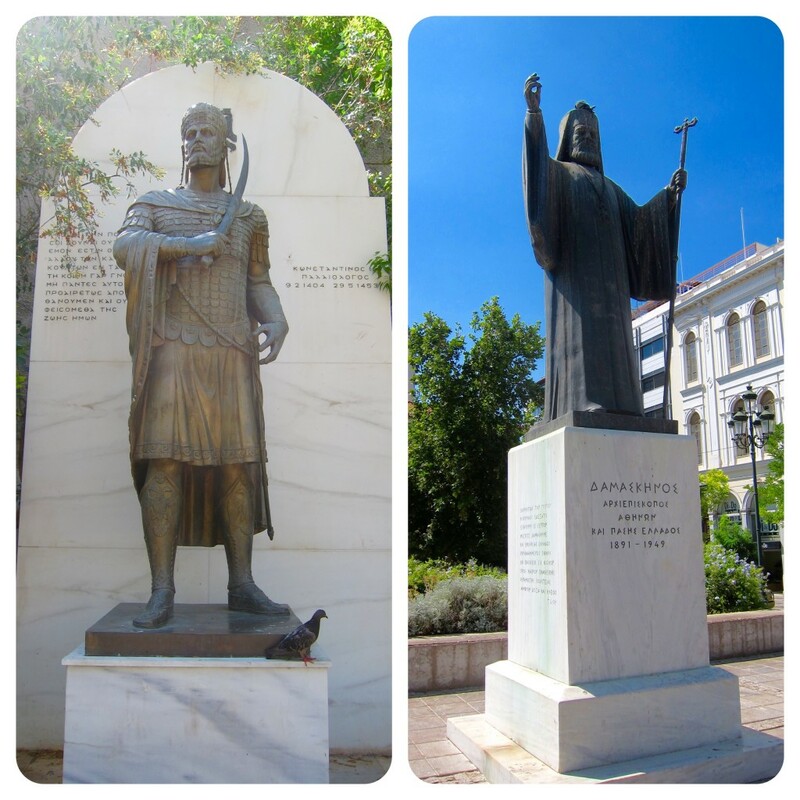 However, it is more likely that the demos dedicated the statue in relation to the plague that stroke the city at the beginning of the Peloponnesian War. 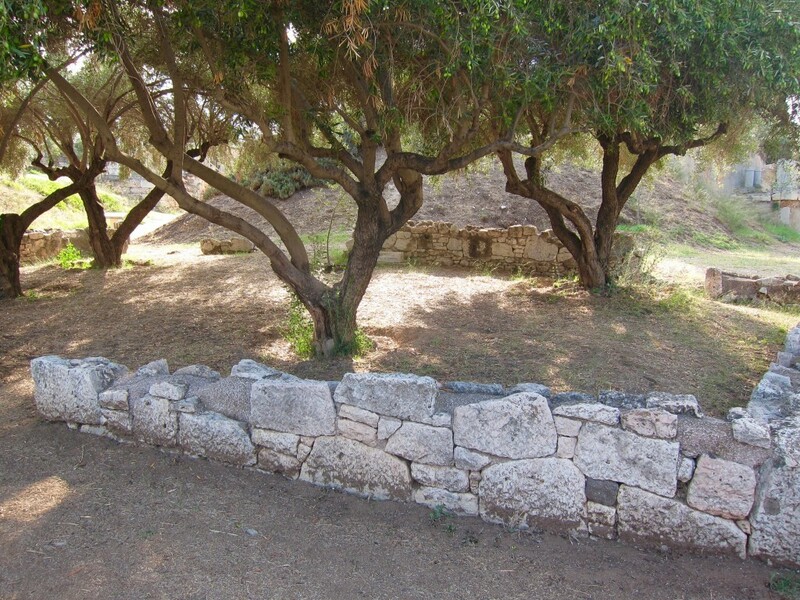 After passing through the Propylaia, the sanctuary of Artemis Brauronia (p.4), the so-called Brauronion, lies to the right of the processional way. It was associated with the early sanctuary of Artemis in Brauron, a coastal town in eastern Attica. Artemis was worshipped as the goddess of nature and hunting, and she was the protector of girls, expecting mothers and women with newborn babies. It is believed that the cult of Artemis was established on the Acropolis in the 6th century BC by the tyrant Peisistratos who originated from Brauron. No architectural remains of the early sanctuary have been found, but at least the cult of Artemis is attested by terracotta figurines and sculptures. According to recent studies, a small temple which housed the cult statue of the goddess, was presumably located in the west part of the sanctuary, along with an altar. Pausanias, the 2nd century traveler, saw in the sanctuary a statue of Artemis, made by Praxiteles, the renowned sculptor of the 4th century BC. The colossal female head found in the area, belongs to this cult statue and it is exhibited in the Acropolis Museum. Attached to the east side of the sanctuary of Artemis Brauronia lies the foundation of the Chalkotheke (p.5), a large rectangular building (43 m by 20 m) with a Doric portico along the facade which was erected soon after 400 BC. According to ancient inscription it housed mainly bronze vessels and utensils used in religious processions, as well as weaponry. Continuing ahead along the Panathenaic Way, you will see to your left the foundation of pedestals for the statues that once lined the path, including one that held Pheidias’ 9m-high statue of Athena Promochos (Champion) (p.6). The Athenians dedicated the statue to Athena, to express their gratitude for her contribution to the victories in the Persian War. Later sources refer that its construction was financed from the Persian spoils, however, according to the inscription with the expense accounts, the construction of the statue is dated to 475-450 BC. The exact form of the statue isn’t know, but later copies of coins of the Roman Period present the helmeted goddess standing, in a calm pose, wearing a belted peplos (robe). According to another version, the outstretched right hand held a Nike, an owl or a spear. Pausanias mentioned that her shield (resting upright against her leg) was decorated with scenes from the Centauromachy (battle between Centaurs and Lapiths), executed by the famous bronze sculptor Mys, following drawings by the painter Parrhasios. According to ancient tradition, the point of her spear and the crest of her helmet were visible to sailors at sea off cape Sounion. Athena Promochos stood overlooking her city for about 1,000 years until Pheidias’ masterpiece was carried off to Constantinople by Emperor Theodosius in AD 426 and was placed at the hippodrome. By 1204 it has lost its spear, so the hand appeared to be gesturing. This led the inhabitants to believe that the statue had beckoned the Crusaders to the city, so they smashed it to pieces. What a pity! 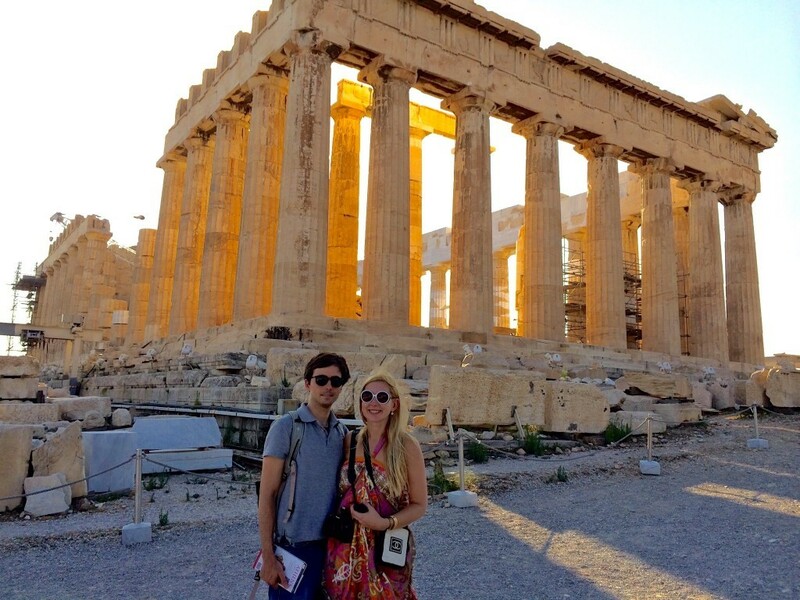 We have already passed nine different structures of the Acropolis, but of course, every road inevitably leads to the Parthenon – the largest, most famous and glorious monument of Ancient Greece. 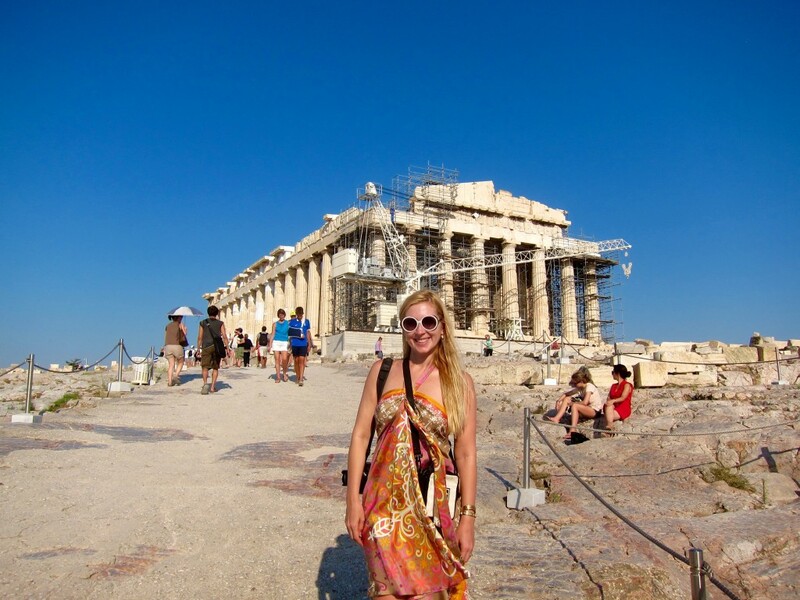 The Parthenon (p.12) was a temple dedicated to Athena Parthenos (Virgin). It was built on the highest part of the Acropolis, on the site of at least four earlier temples dedicated to Athena. Built in the Doric order, it was made of white Pentelic marble with a width of almost 31m, length of 69.5 m and a hight of 15 m. To achieve perfect form, its lines were ingeniously curved to create an optical illusion – the foundations are slightly concave and the columns are slightly convex to make both look straight. It has an outer colonnade (pteron) of 8 columns on the short and 17 columns on the long sides, as well as an inner colonnade (prostasis) of 6 columns on the short sides. The interior of the temple was divided into the pronaos, the sekos (cella), the opisthodomos and the opisthonaos. See plan below no.1,2,3,4 respectively. The Parthenon was the most important building of the Pericles’ plan for the re-establishment of the Acropolis sanctuary. The temple was built between 447-438 BC and its sculptural decoration was completed in 432 BC. Iktinos and Callikrates were the architects of the temple. Its sculptures were designed and party sculpted, in collaboration with his colleagues, by the famous Athenian sculptor and a friend of Pericles, Pheidias, who also had the general supervision of the construction of the temple. The rich sculptural decoration of the Parthenon, which through the centuries suffered severe damages and looting, consisted of 92 metopes, the compositions on the pediments and the frieze, all of which were, hard to imagine, brightly colored and gilded. Great part of the original sculptural decoration is exhibited in the Acropolis Museum. The metopes depict the battle between the Olympian gods against the rebellious Giants (Gigantomachy) on the east side, the sack of Troy by the Greeks on the north side, the repulsion of the Amazons who threatened the city (Amazonomachy) on the west side, and the scenes of battles between Greeks and Centaurs (Centautomachy) on the south side. The east pediment represents the birth of Athena from the head of the father Zeus, in the presence of other Olympian gods. The duration of the birthday of the goddess is defined by the chariot of Helios (the sun) and the chariot of Selene (the moon) at the corners of the pediment. The west pediment shows the dispute between Athena and Poseidon for the protection of Attica, in the presence of the Kings who were the forefathers of the Athenians and local heroes or personifications of the Attic landscape. The frieze, of a total length of 160 m, depicts the procession of the festivals of the Great Panathenaea which concludes on the east side, with the offering of the peplos (robe), for the cult statue of Athena Polias in the presence of the Olympian gods. The frieze was damaged in the explosion of 1687 and later defaced by the Christians, but the greatest existing part (over 75 m long) of the controversial Parthenon Marbles, taken by Lord Elgin, is now in the British Museum in London. The ceiling of the Parthenon, like that of the Propylaia, was painted blue and gilded with stars. At the eastern end was the holy cella (inner room of a temple), into which only a few privileged initiates could enter. Sculptor Pheidias created the chryselephantine (gold and ivory) 12 m-hight statue of the goddess Athena Polias (Athena of the City) with an imposing formal appearance, which stood in this cella. Her wooden frame was gold-plated; her face, hands and feet were made of ivory, and her eyes were fashioned from jewels. Clad in a long gold dress with the head of Medusa carved in ivory on her breast, the goddess held a statuette of Nike (goddess of victory) in her right hand, and in the left a spear with a serpent at its base. On top of her helmet was a sphinx with griffins in relief at either side. In AD 426 the statue was taken to Constantinople, where it disappeared, but its appearance is known from ancient writers and later copies. Over the centuries, The Parthenon was used as a church, a mosque and an arsenal, and has suffered severe damage. I doubt I have ever seen the pictures of the Parthenon without any scaffolding, it is always under construction, renovation, addition, but I hope to come back one day and take a proper photo of it, unveiled! East of the Parthenon lay the foundation of a small building attributed by the first excavations of the Acropolis to the Temple of Rome and the Roman Emperor Octavian Augustus (p.13). The architectural parts indicate that the Temple was of the Ionic order and it featured in single circular colonnade made of nine columns, without a walled room inside. It diameter measured ca 8.60 m and its height reached 7.30 m up to the conical roof. 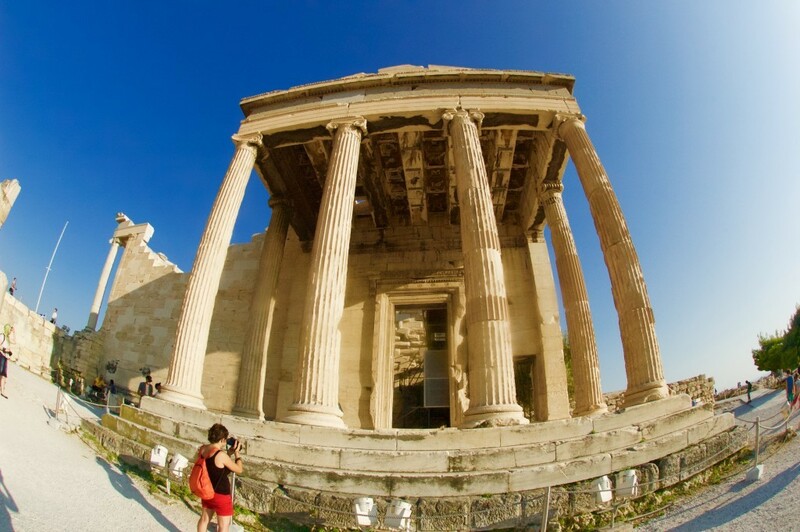 The construction of the temple is associated with the architect who repaired the Erechtheion in the Roman Period, because the architectural details of its parts replicate those of the Erechtheion. It is possible that the temple interior housed statues of Rome and Augustus, although no fragments of sculptures have been identified to date. The temple of Roma and Augustus is the sole Roman temple on the Acropolis and the only Athenian temple dedicated to the cult of the Emperor. 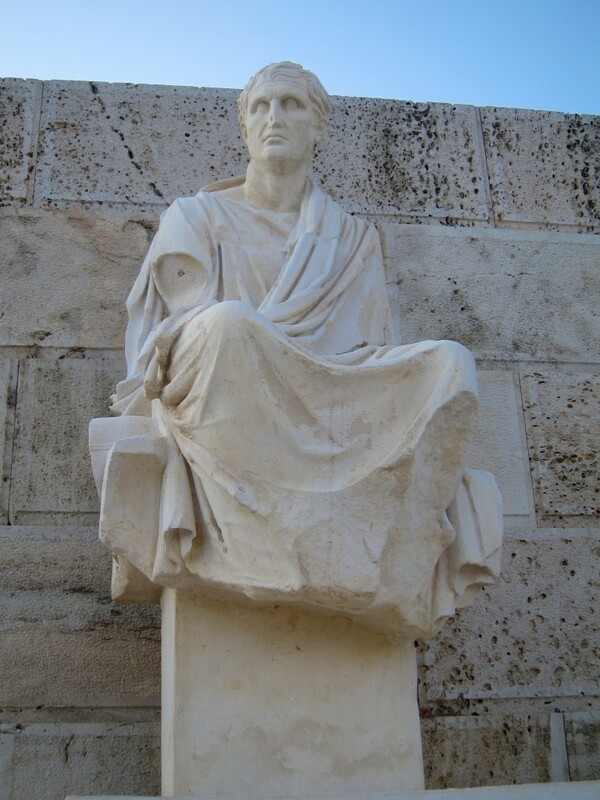 The Athenian deme constructed it in order to propitiate Octavian August and reverse the negative climate that characterized the relations of the two parties, as, during the Roman civil wars, the city of Athens had supported his opponent, Marcus Antonius. The temple was securely dated after 27 BC, when Octavian was proclaimed Augustus – most probably between 19-17 BC. By the eastern edge of the Acropolis you find a building of the old Acropolis Museum (p.16), Sanctuary of Pandion (p.15), Sanctuary of Zeus Polieus (p.14) and a huge flagstaff with an immense Greek flag on it. Undoubtedly, it was the visitors’ favorite place on the Acropolis, since it provided the most stunning views of the city. Although the Parthenon was the most impressive monument on the Acropolis, it was more of a display than an actual sanctuary. That role fell to the Erechtheion (p.9), which was built on the most sacred part of the Acropolis, where Poseidon struck the ground with his trident (and left a mark on a rock), and where Athena produced the olive tree, in their battle for possession of the city. To be precise, Erechtheion was built as an eastern attachment to another sanctuary, built in Archaic Period, dedicated to Pandrosos, the Pandroseion (p.8). 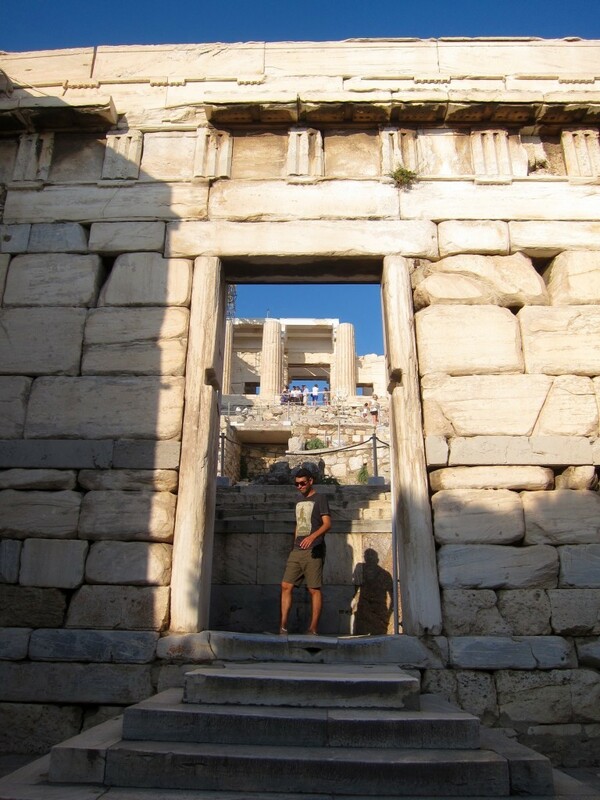 Named after Erechtheus, a mythical king of Athens, the temple housed the cults of Athena, Poseidon and Erechtheus. The Erechtheion is immediately recognized by the six larger-than-life maiden columns, the Caryatids (modeled on women from Karyai, modern-day Karyes, in Lakonia), that support its southern portico. 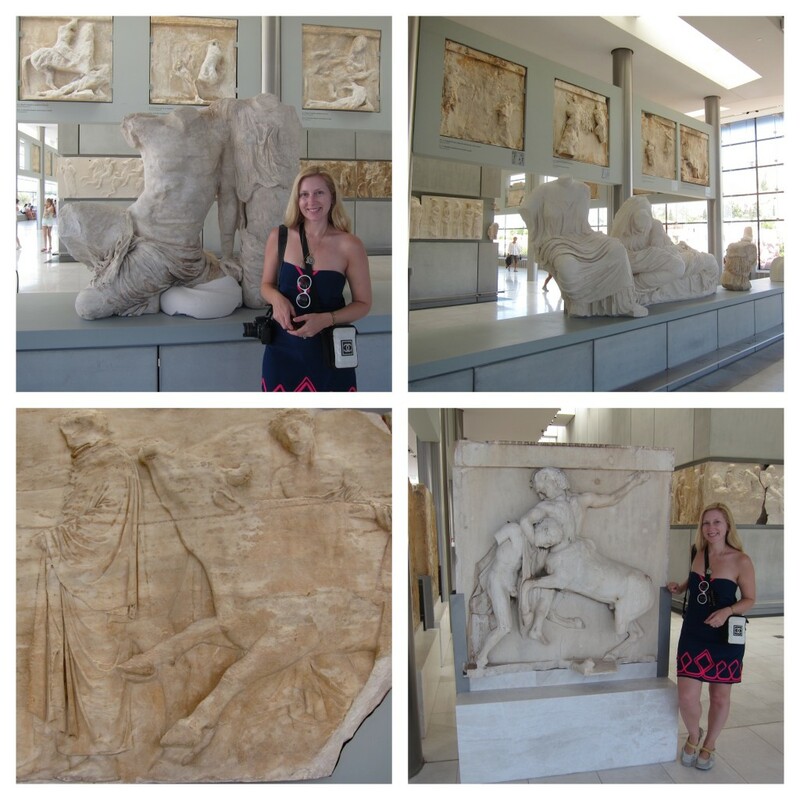 The one you see outside are the plaster copies, while the 5 originals (which were removed by infamous Lord Elgin) are now on the display at the Acropolis Museum. The Erechtheion was part of Pericles’ plan, but the project was postponed after the outbreak of the Peloponnesian Wars. Work didn’t start till 421 BC, eight years after Pericles’ death and was completed around 406 BC. Architecturally it is the most unusual monument of the Acropolis, a great example of Ionic architecture ingeniously built on several levels to counteract the uneven bedrock (west and north sides are about 3 m lower than the south and east sides). The large rectangular cella was divided into up to 4 rooms (different sources quote different numbers), but one was definitely dedicated to Athena and contained the holy olive wood statue of Athena Polias holding a shield adorned with a gorgon’s head, and another – to Poseidon, representing the reconciliation of the two deities after their contest. The northern porch consists of six Ionic columns, on the floor are the fissures supposedly left by the thunderbolt sent by Zeus to kill Erechtheus. It had elaborately carved doorways and windows, and its columns were ornately decorated (far more so than is visible today); they were painted, gilded and highlighted with gilt bronze and multi-colored inset glass beads. To the south of here was the Cecropion – King Cecrops‘ burial place. The Erechtheion complex has been used for a range of purposes, including the harem for the wives of the Turkish commander in 1463. It was almost completely destroyed by a Turkish shell in 1827 during the War of Independence. I failed to mention (and frankly, notice) the remains of Altar of Athena (p.11), “Old Temple” of Athena (p.10), Arrhephorion (p.7) and Pinakotheke (p.3), but they must be somewhere there to be found, so please look for them! We exited the Acropolis from its other entrance by the Theater of Dionysus, and even though it was getting dark and we were coming back the next day to check out the southern slope of the Acropolis, I still couldn’t resist and sang one of Andrea Bocelli’s operas for D. while standing in the middle of the ancient theater (luckily many people have left by then). Well, we’ve done pretty damn great for one day, but I wouldn’t advise anybody to rush through the sites, monuments and experiences. They require time to be re-discovered and understood. They do actually deserve it. When we finally got back home in Chalandri, D. parents were already waiting for us to have dinner at the restaurant called Tzitzikas Kai Mermigkas. Definitely try this comfy, family-run restaurant if you are in the area. 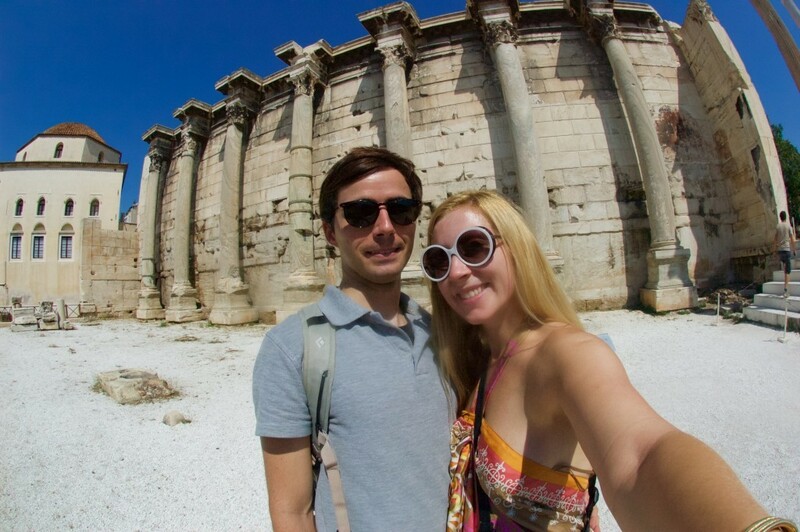 We had another busy day ahead of us, so we woke up early and went back to the Acropolis, this time – to check out in more details its southern slope as well as the Acropolis Museum. 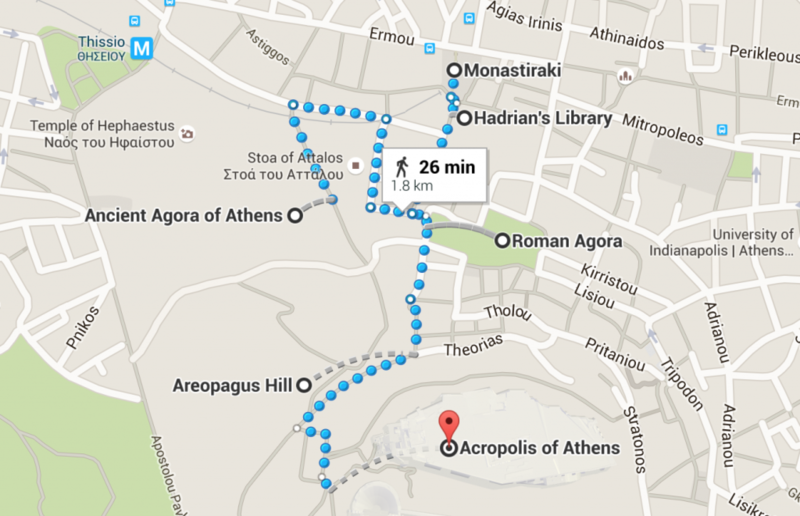 We got off Akropoli subway stop which was just a few minutes away from the site’s eastern entrance. The south slope of the Acropolis is just as archeologically rich, as the Acropolis itself, it contains over 26 different sites, in different state of preservation, but all of them were well marked and explained. I will follow South slop of the Acropolis Map while describing some of the sites we visited (obviously, we weren’t able to fit all of them in one morning). Next to the Odeion of Herodes Atticus, which we saw from the top the day prior, the bronze foundries (p. 22) are located. In 5th-4th century BC it was a busy manufacturing site. 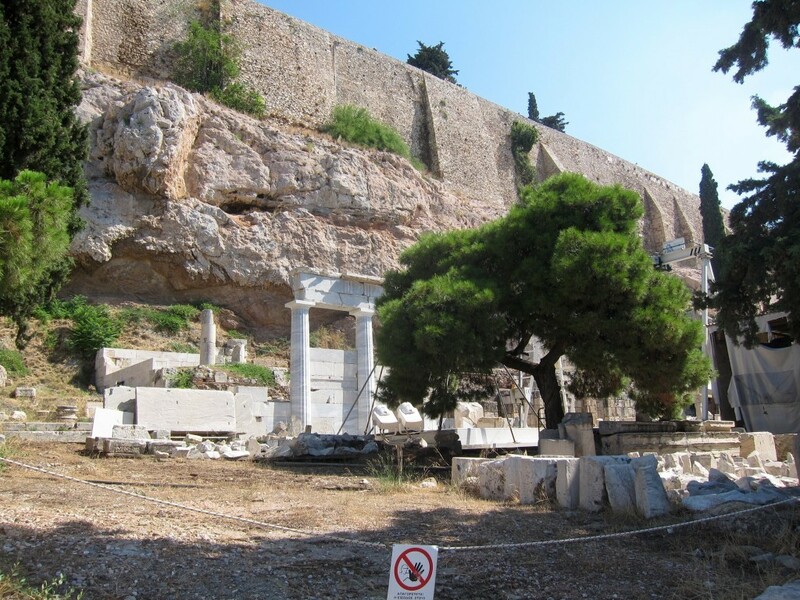 Excavations from 1877 to 2006 have revealed a total of four pits cut into the soft rock (kimelia) of the Acropolis that are connected with the process of casting bronze statues. The two largest pits (A and B), depth 2.8 m, are accessed by stairways and have facilities in their interior. Foundry D to the east, protected under the shed, was excavated in 2006 and has a square base of clay-plastered porous plinths at its center. During the excavation of the pit, thousands of mould fragments were collected. The extensive manufacturing activity in the area is connected either with the monuments of the Asklepieion (one of the structures on the south slope) or with those on the Acropolis; according to one view, here was the place where the statue of Athena Promachos was cast. Just south of the bronze foundries is the Stoa of Eumenes (p.14), which was placed between the Odeion of Herodes Atticus and the Theater of Dionysos, along the Peripatos (the ancient road around the Acropolis) and served as a shelter and promenade for theater audiences. The king of Pergamon, Eumenes II, donated this Stoa to the Athenian city, during his sovereignty (197-159 BC). This elongated building, 163 m long and 17.65 m wide, had two storeys. The stoa was made of a kind of island marble, which was used for the majority of the buildings at Pergamon, and is not to be found in any other building in Athens. The ground floor facade was formed from a colonnade of 64 Doric columns, while the interior colonnade consisted of 32 Ionic columns. Nowadays, a visible part of the monument is the north retaining wall, reinforced with buttresses connected by semi-circular arches. This wall was constructed in order to hold the north earth embankment in place and to support the Peripatos. It is also possible to see the Krene (spring) included in the north wall, the stylobates of the inner colonnade on the ground floor and the foundation of the exterior colonnade. Besides, a part of the substructure of the east wall of the stoa has also survived, in addition to the west wall, which suffered some changes during the Roman period, when the Odeion of Herodes Atticus was erected. To north-east of the Stoa of Eumenes (and right above the Theater of Dionysus) is the Asclepieion (p.15), the sanctuary of the god Asclepios and his daughter Hygieia, the personification of “Health”. 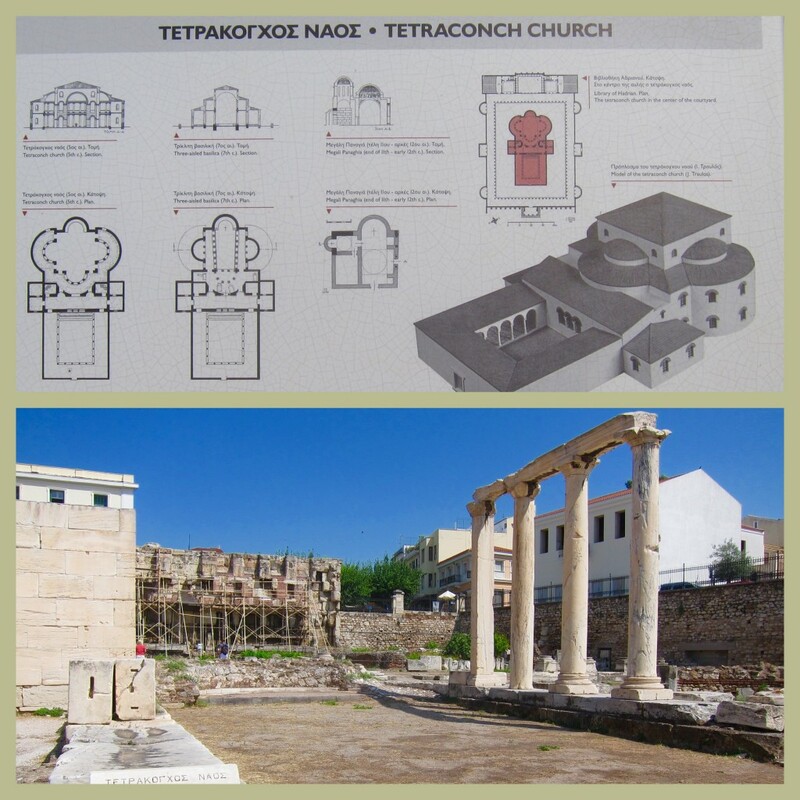 The sanctuary was founded in 420-419 BC (when the plague was sweeping the city) by an Athenian citizen from the deme of Acharnai, named Telemachos. The Asclepieion consisted of a small temple, an altar, and two halls, with Doric Stoa which served as a dormitory hall for the visitors to the Asclepieion who stayed there overnight and were miraculously cured by the god who appeared in their dreams, and the Ionic Stoa which served as a guest house for the visitors to the shrine and the priests. The traveler Pausanias, who visited the temple in the 2nd century AD, noted the statues of the god and his children, which were kept inside the temple. The Doric Stoa, a two-storey building with a facade of 17 Doric columns, was built in 300-299 BC, as epigraphical testimonies attest. 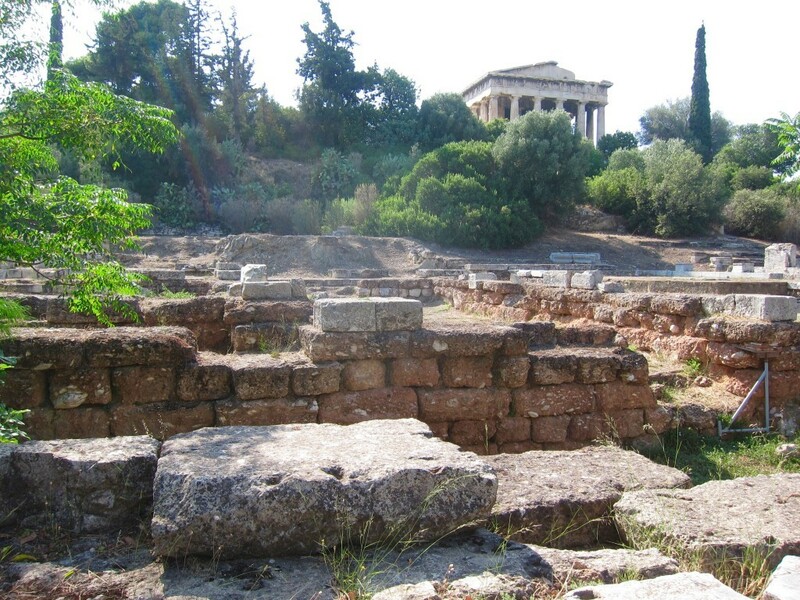 The Stoa integrated in o its eastern part the Sacred Spring, a small cave with a spring in the Acropolis rock. Since water has always been a significant element in the cult of Asclepieion, it probably accounts for the selection of this site for the sanctuary, and in to its western part the Sacred Bothros, which functioned as a sacrificial pit. 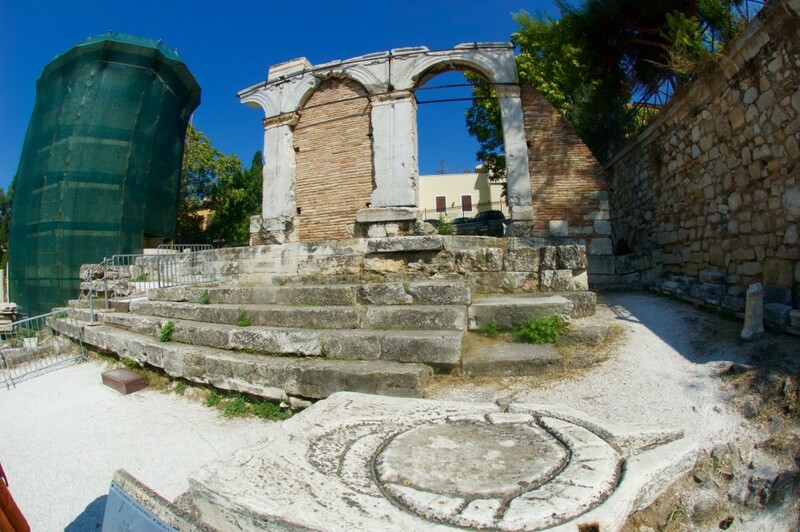 The Sacred Bothros, a well with polygonal masonry, placed in the first floor of the Stoa, is dated earlier than the Stoa itself, to the last quarter of the 5th century BC. It served as a Well Altar, on which the Heroa, the sacrifices to the chthonian deities and the Heroes took place. During the 5th-6th century AD, almost entire area of the sanctuary was occupied by a three-aisled Early-Christian basilica. 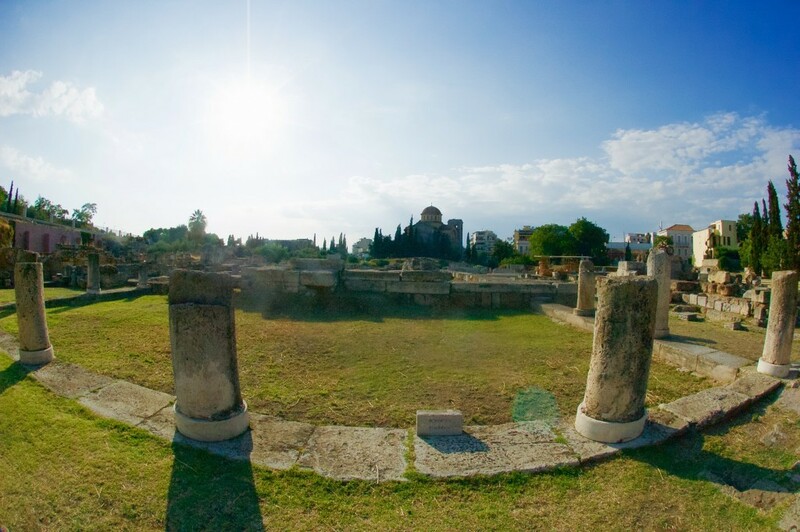 Today, you can see the ruins of most of the buildings as well as another spring, known as the Archaic fountain, two Byzantine cisterns and the foundation of a temple dedicated to Themis. West of the road leading to the Acropolis, just south of the Stoa of Eumenes, there is a magnificent choragic monument. The institution of the Choregy, in operation from the late 6th century BC, involved wealthy Athenians who sponsored the preparation of performances in dithyrambic or dramatic contests. The events took place in the theater during the festival of Dionysus, called the Greater or Dionysia (late March- early April). The prize for the winner in dithyrambic contests of boys or men was a bronze tripod, dedicated by the patron (Choregos) to the god Dionysus, preferably in a conspicuous place near the sanctuary and the theater of Dionysus. The monument of Nikias (p.13) was a small temple-like, with six Doric columns in front and pediments on both of its narrow sides. At the end of the antiquity (3rd century AD) the monument was dismantled and a large number of its architectural parts was transferred and used to construct the Beulé Gate of the Acropolis. Visitors can still find there the choregic inscriptions, engraved on the three central sections of the architrave of the facade, referred to Nikias, son of Nikodemos, who won teaching the chorus of the boys in the archonship of Neaichmos (320-319 BC). The sanctuary of Dionysus Eleuthereus (p.6) with the theater to the north of it, is the first group of monuments encountered by visitors and the earliest on the south slope. The Archaic Temple of Dionysus (p.6a) was constructed in the second half of the 6th century BC, when the cult of the god was introduced into Athens from Eleutherai in Boeotia by the tyrant Peisistratos. The Great Dionysia, the most splendid festival in honor of the god, was celebrated in the spring inside the precinct of Dionysus. During the Dionysian rituals, the believers, disguised as Silenoi and Satyrs, the god’s attendants, danced the “cyclical dithyrambic dance”, which was the nucleus of the ancient Greek drama. To the south of the Archaic temple, a second temple, called the Later Temple of Dionysus (p.6b), was erected in the second half of the 4th century BC. This housed the chryselephantine statue of the god carved by Alkamenes. All that now survives are the foundations of the temple and the base of the cult statue, made of conglomerate. 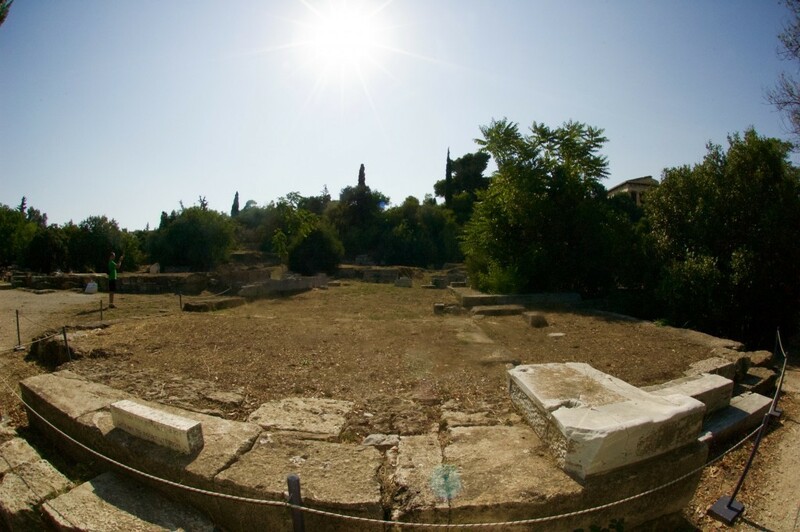 The ancient Theater of Dionysus (p.7) was the world’s first theater and a birthplace of Greek tragedy. Of the three sections of the theater (orchestra, cavea and stage building), the stage building is most closely connected with the evolution of theatrical creating. During the approximately thousand years that the theater functioned, it has therefore altered to the greatest extent. In the age of the great dramatic poets, Aeschylus, Sophocles, Euripides and Aristophanes (5th century BC), the stage was a simple, rectangular, timber construction south of the spectators’ space. 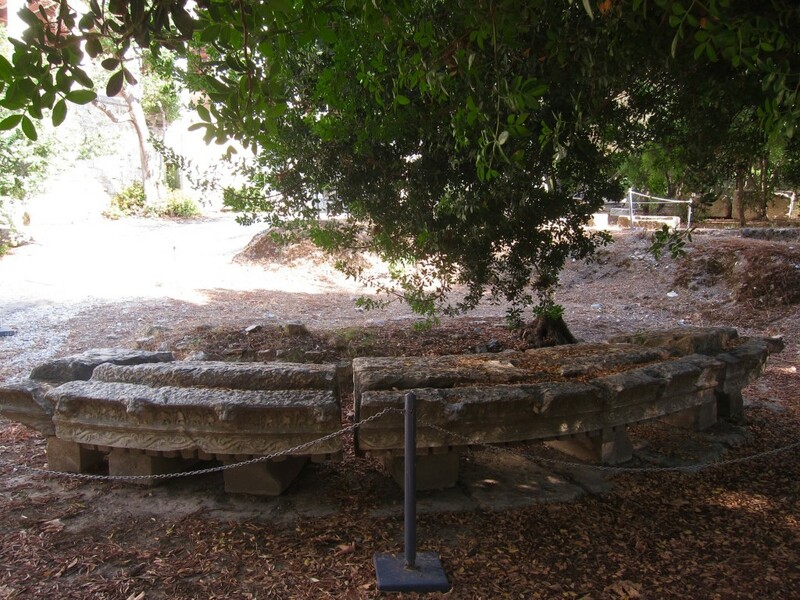 At that time the cavea had wooden benches and special stone seats for priests and other officials. In this phase the action of the play took place mainly in the orchestra, where men clad in goatskins sang and danced which followed by feasting and revelry. 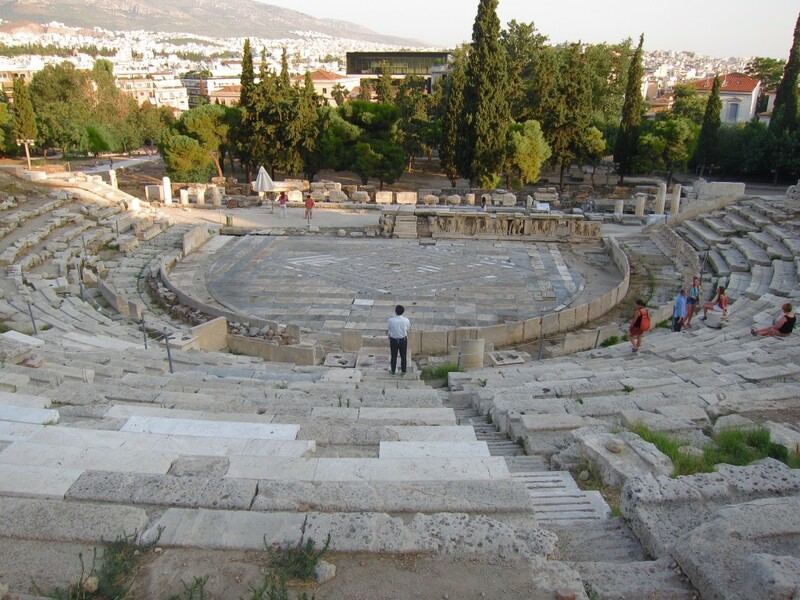 When the theater was rebuilt entirely of aktites, a stone local to Piraeus,(Lycutgean phase, 342-326 BC), and the auditorium was extended to the foot of the sacred rock by the addition of the Epitheatron (64 tiers of rows with 17,000 seat capacity), the stage building was likewise constructed of stone. A second floor was added, the paraskenia were shortened and the facade of the ground floor received a Doric colonnade. These alterations were dictated by the development of dramatic performance (New Comedy, etc. ), in which the role of the actor was emphasized more than the chorus and the theatrical action was transferred to the level of a raised stage. The socio-political changes of the Roman period led to substantial changes in the stage building, which became higher, had an extensive proscenium (pulpitum) and a facade with elaborate architectural decoration and statues of Satyrs, who are connected with the mythological cycle of the god Dionysus. A final period of prosperity for the theater, after its destruction by the Herulians (AD 267), is marked by the so-called Bema of Phaedrus (4th century AC), which replaced the Roman pulpitum and was decorated with marble slabs taken from older buildings and showing the scenes in relief of the life of Dionysus. The eastern parodos was the main entrance into the the theater, through which priests and officials arrived for the theatrical performances during the Dionysian festival of the city. The northern side of this entrance was chosen as the site for the erection of statues honoring the most important dramatic poets, who symbolized the perennial values of classical education and functioned as examples for participants in the theatrical contests. The completion of the “Lycurgan era” theater, also included the erection of the posthumous honorary monument to the three Tragedians (Aeschylus, Sophocles and Euripides) in the main entrance, in around 330 BC. The Tragedians, who served the glory of classical Athens, were represented in typical poses and in the clothes of distinguished Athenian citizens. East of this monument the honorary base and statue of the most important representative of the New Comedy, Menander, was erected in 291-290 BC. He wrote over 100 plays, but won the contest only few times. His innovative work focused on ordinary people and he is considered to be the father of psychological drama. At the age of only 51, he drowned while swimming in Piraeus. The monument in his honor was erected immediately after his death while Athens was under the rule of the Macedonian Kind, Demetrios Poliorketes. The poet is represented seated on an honorary throne, his beardless face mirroring the new fashion introduced by Alexander the Great. 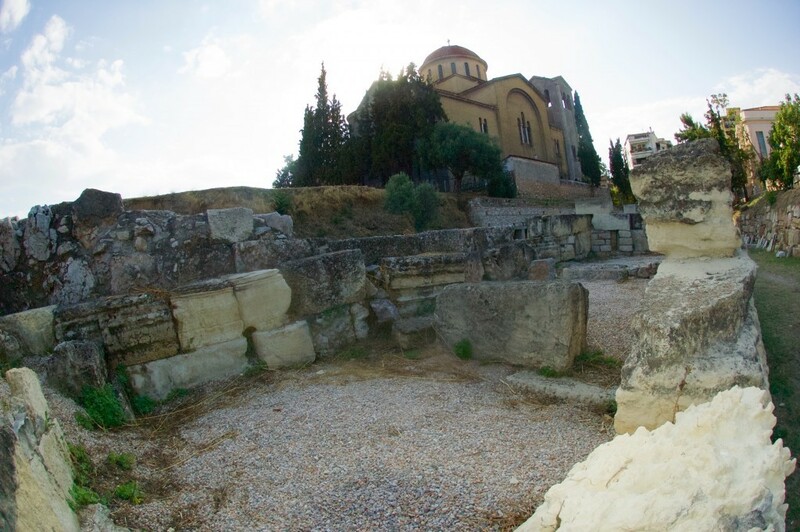 With the prevailing of Christianity, the northern part of the stage building was incorporated in the building complex of an Early Christian basilica, erected on the site of the east parodos during the 6th century AD. 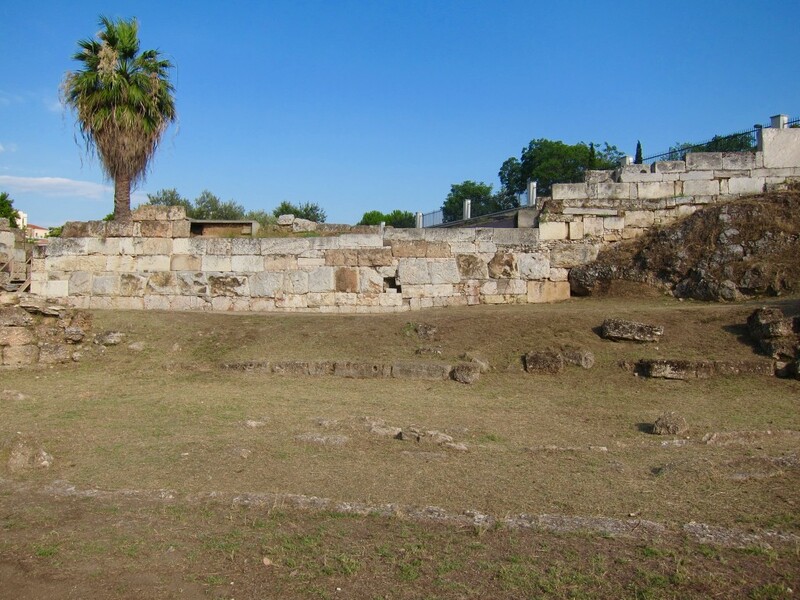 The area to the east of the theater of Dionysus was occupied after the middle of the 5th century BC by the Odeion of Pericles, a building used for music contests. On the basis of the literary sources and some small-scale excavations, this may be reconstructed as an almost square roofed hypostyle building. Above the theater there is a cave (hard to find) sacred to the goddess Artemis. This was converted into a chapel in the Byzantine era, dedicated to Panagia i Spiliotissa (p.11) (Our Lady of the Cave), and was the place where mothers brought their sick children. Two large Corinthian columns nearby are the remains of choregic monuments erected to celebrate the benefactor’s team winning a drama festival. South of the precinct wall and the roadside shrine, the ruins of a single-nave church, dedicated to St. Paraskevi, have been found. Its floor was composed of ancient marble spoils and remains of wall paintings were still preserved on its side walls. The basilica, which appears for the first time on a plan by the Venetian engineer Verneda, in 1687, had three building phases from the late Byzantine times to 1860. It had probably suffered extensive damages during the siege of the Acropolis in 1827. In its place a small chapel was built, around 1860, as a remembrance of the earlier building. Today, the remnants of the second phase of the 17th century are preserved. South slope of the Acropolis requires a day of its own exploration. You need to equip yourself with a good map and sites’ descriptions, otherwise, sometimes it is hard to see where one monument ends and another starts. After spending good 2-3 hours on the slope, we descended to the Museum of the Acropolis, located just 300 m from the eastern entrance to the Acropolis. The Acropolis Museum (€5 entry) – or the New Acropolis museum opened in 2009 to replace the old one which was located on top of the Acropolis, east of the Parthenon. As the archeological work continues today, more sites and artifacts were (and still are) uncovered but weren’t displayed due to the old museum’s lack of space. The new museum was designed to accommodate the expanding collection as well as to become a bargaining chip in negotiation with Great Britain for the return of the Parthenon Marbles, stolen by Lord Elgin in early 19th century. to maintain visual contact with the monuments of the Acropolis while browsing the galleries of the museum – which was accommodated by having transparent glass walls which create almost no barrier between the site and the new home of its artifacts. to exhibit the Parthenon sculptures in their entirety – the 4th floor is dedicated to the Parthenon, where a rectangular, solid concrete core was built to the same dimensions and orientation as the Parthenon. It was specifically designed to receive and display the entire temple frieze. to adapt the building to the archeological excavation that extends across its foundations – the building is built on 100 concrete pillars providing an impressive shelter for the site’s archeological excavation presently happening underneath the museum (which already uncovered buildings from Byzantine and Classic era). 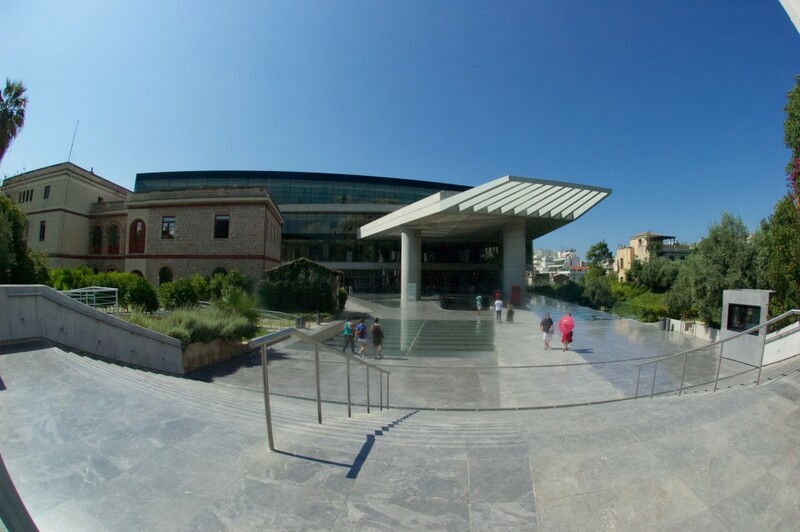 The museum has 4 floors (in addition to the underground excavation level), but exhibits its collection chronologically on 3 of them (3rd floor is an office space, multimedia center and a cafe) – Acropolis Museum Map. Note, pictures aren’t allowed on the ground and 1st floors (I mistakenly took a few, so, please enjoy). Located on the ground floor, the “Gallery of the Slopes of the Acropolis” houses finds from the sanctuaries that were established on the slopes of the Acropolis, as well as objects that Athenians used in every day life from all historic periods. 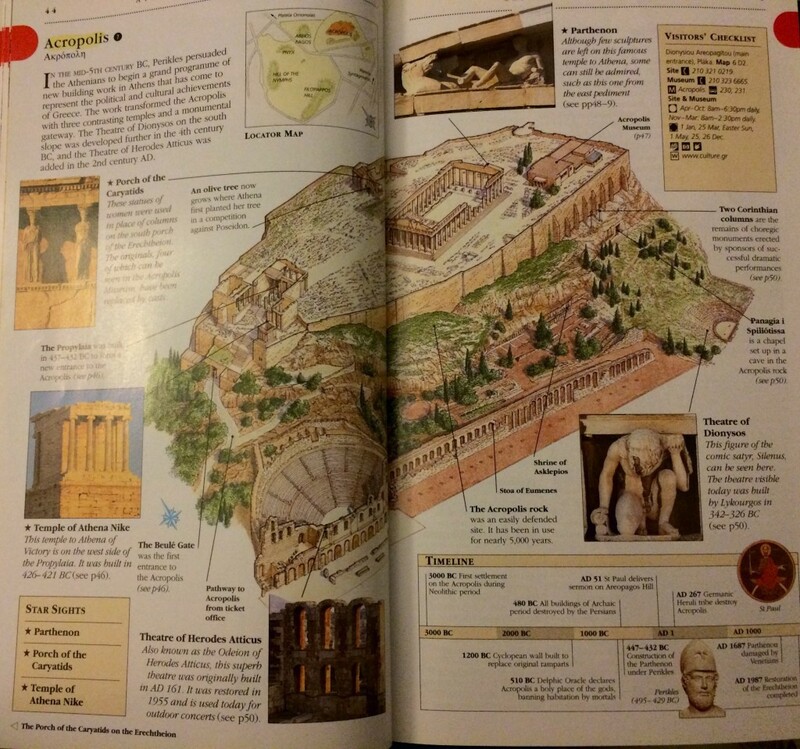 It also contains multiple miniature layouts of the Acropolis at different times of its existence. The long and rectangular hall whose floor is sloping, resembling the ascension to the sacred hill. The nine-meter high, naturally lit “Archaic Gallery“, in the east and south sections of the first floor, hosts the magnificent sculptures that graced the first temples on the Acropolis. It also displays the votive offerings dedicated by the worshippers, such as the Hippeis (horse riders), statues of the Goddess Athena, sculptures of male figurines, marble reliefs, and a smaller bronze and clay offerings. This floor contains the works created after the construction of the Parthenon, namely, the Propylaia, the temple of Athena Nike and the Erechtheion. The north wing displays striking Classical sculptures and their Roman copies. Five Caryatids (the sixth is in the British Museum), the maiden columns that held up the Erechtheion and a giant floral akrotirion (a decorative element placed on the brick at the end of a gable of a classical building), that once crowned the southern ridge of the Parthenon pediment are on this floor too. The second floor has a media center where you can watch a short movie about the history of the Parthenon and the Acropolis, and see the detailed layout of the Parthenon and both of its pediments (birth of Goddess Athena and a battle between Athena and Poseidon). The Museum’s exhibition culminates on the 3rd floor, in the glass-encased “Parthenon Gallery”. For the first time in more than 200 years, the relief sculptures of the Parthenon frieze depicting the Panathenaic procession are exhibited in continuous sequence along the perimeter of the external surface of the rectangular concrete core of the gallery (160 m). The metopes, the marble slabs with relief representation from Greek mythology, are exhibited in between the stainless steel columns of the Gallery, which are the same in number as the columns of the Parthenon. The Acropolis Museum is a wonderful, well-thought museum which won’t overwhelm you, but will definitely fill in the blanks of the Acropolis’ monuments. Please allow yourself 1.5-2 hours at least. 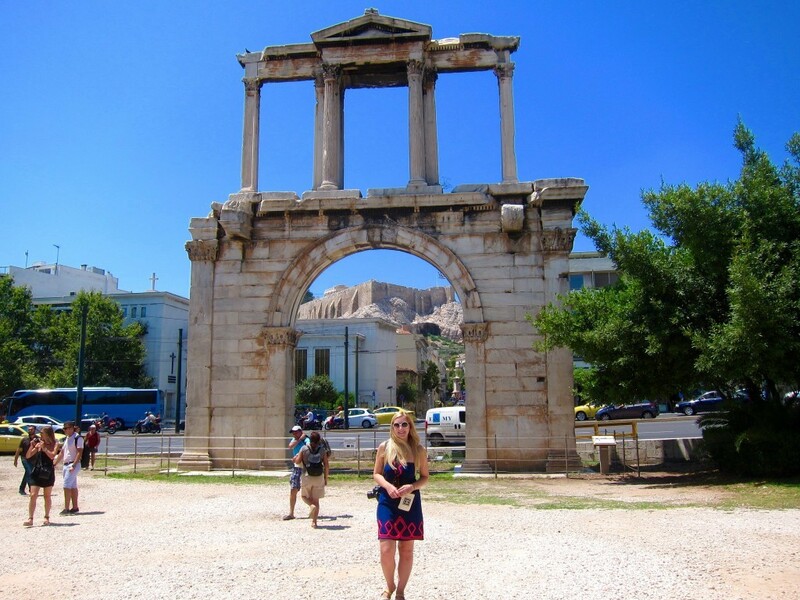 After grabbing a lunch at one of the places on Makrigianni street, we proceeded to our next destination – the Hadrian’ s Arch and the Temple of Olympian Zeus. Along the way, different shops beautifully mingled with ancient ruins and churches. On our left, we passed the Lysikrates Choregic Monument. As I mentioned earlier, once a year, during the Great Dionysia festival, men participated in tragedy competition and the winner received a tripod as the highest honor. In the 5th century BC, those contests took place on regular rectangular bases, while in the 4th century BC, they stood on more elaborate buildings, usually resembling temples. The Lysikrates choregic monument is thought to be one and was established in 334-333 BC. 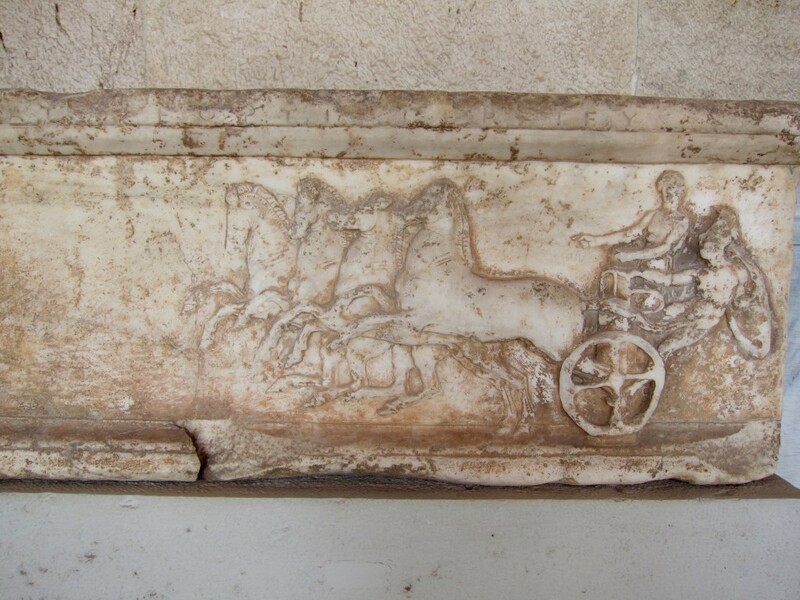 The marble frieze depicted the adventure of Dionysus with pirates, whom he turned into dolphins. In 1669, the monument and its surrounding area were incorporated into the Capuchin monastery and was used as a cell, library and study room. Lord Byron, Chateaubriand and others stayed there. With the exception of the Lysikrates Monument all the buildings of the monastery were destroyed in 1824 by Omar Pasha. A few steps further, there is the Church of Agia Aikaterini. The central part of the church dates back to the Byzantine period, while the narthex was added at the middle of the 20th century. According to the inscription at the altar, this church was constructed at the place where Irene, wife of the emperor Theodosius II, founded the Church of St. Theodore in the 5th century. The Byzantine part was constructed in the second quarter of the eleventh century and it is the oldest example of the cross plan with the central dome in Athens. At least since then until 1767 the church was dedicated to St. Theodore. It was rededicated to Saint Catherine in 1767 when the church was given to the Monastery of St. Catherine in Sinai (Egypt). In this church there are holy relics of St. Polydoros of Cyprus, St. Athanasios of Persia, and St. Triphone. 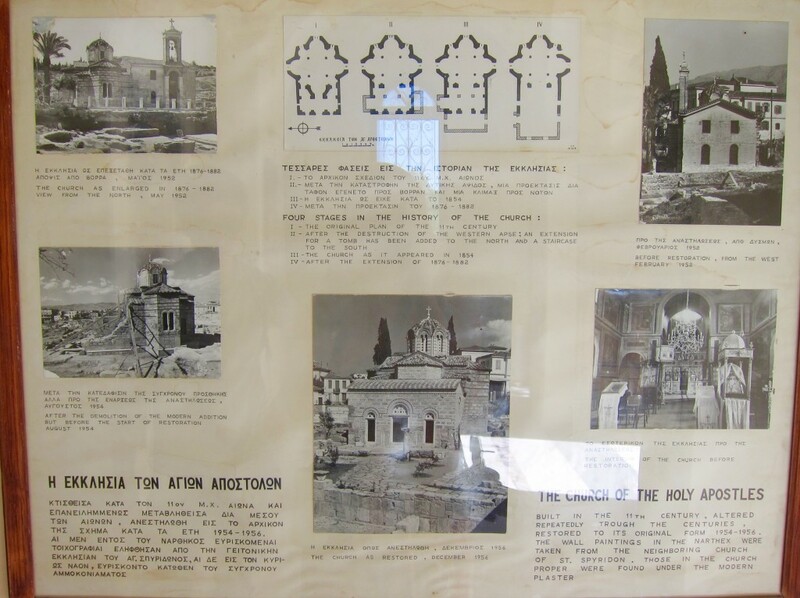 These relics were brought here by the priest Cyrilos Psylas who was banished from Ephesos in 1922. The building was closed (like many churches in Greece), but we stopped to admired its beautiful facade. Two more minutes walk and before entering the site the Temple of Olympian Zeus, we passed the triumphal arch – the Hadrian’s Arch – made of Pentelic marble. 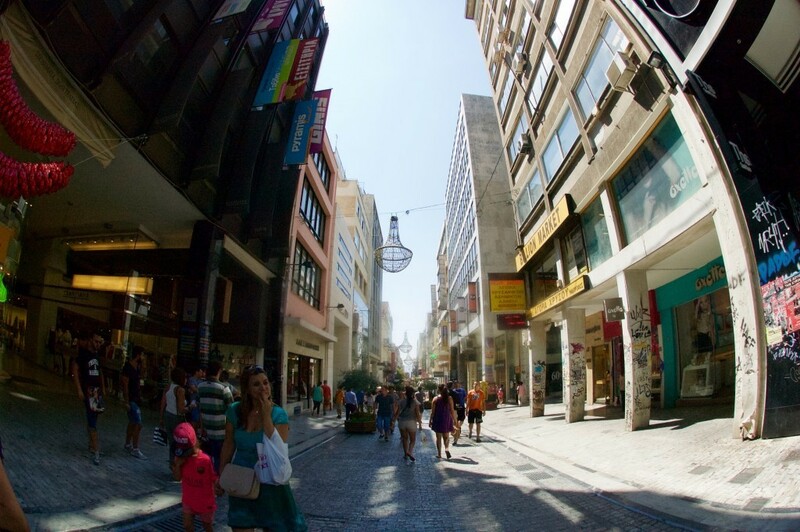 It lies on an ancient street that led from the old city of Athens to the new section built by Hadrian. It was contracted by the Athenians in AD 131-132, in honor of their benefactor – Hadrian. Despite the removal of the city’s classical artwork to Rome, he embellished Athens with multiple monuments influenced by classical architecture. The Hadrian’s Arch, which is 18 m high and 13 m wide and is in the Corinthian order, has two identical facades and is divided vertically into two distinct sections. The lower follows the form of a Roman honorary arch, while the upper imitates the traditional Greek propylon. 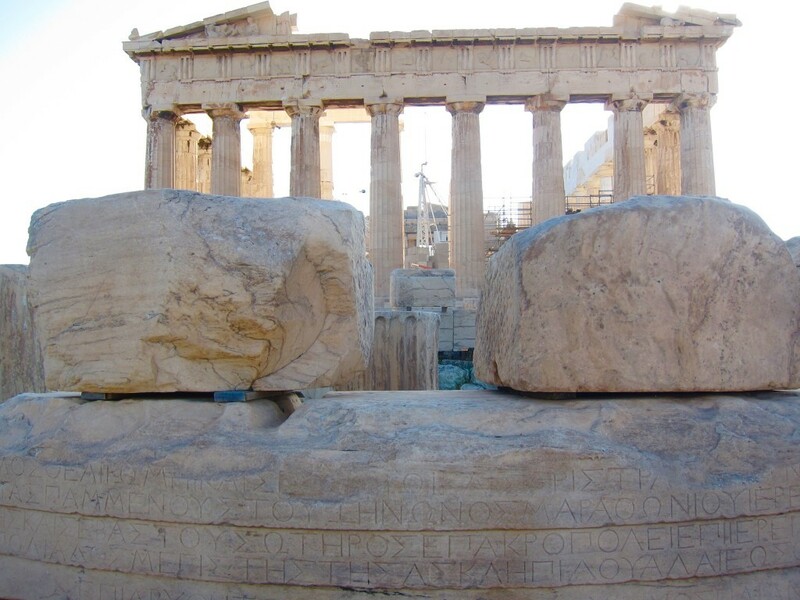 Two inscriptions are carved on the architrave, one of each side: the first, on the side towards the Acropolis reads “This is Athens, the ancient city of Theseus”; the second, on the other side, facing the new city, reads “This is the city of Hadrian and not of Theseus”. The remains of wall painting may suggest that in the Middle Ages the arch was part of a Christian church. In 1778 it was converted into a gate of the Turkish defense wall around Athens, and was known as the “Vasilopoula’s Gate” (“Princess Gate”). 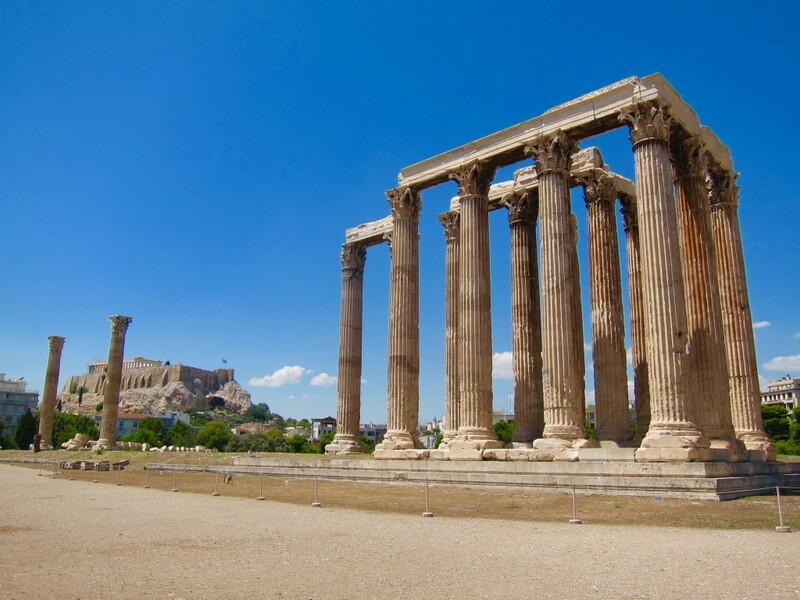 You can’t miss the remains of the Temple of Olympian Zeus, not only because it is a well-maintained open space in the center of Athens (just 320 m from the Acropolis), but mostly because it is the largest temple of ancient Greece, exceeding even the Parthenon. Its construction began in 515 BC, during the reign of the tyrant Peisistratos (by his sons, Hippias and Hipparchos), who allegedly initiated the building work to gain public favor, but abandoned it for lack of funds. It was completed 638 years later, in AD 132 by Hadrian, who dedicated the temple to Zeus Olympios during the Panhellenic festival, on his second visit to Athens. The temple had 104 columns (17 m high and 1.7 m in dimeter) – two rows of 20 columns on the sides (dipteron) and three rows of 8 columns at the end (triperon). The temple measured 110 m long and 43.7 m wide and its cella contained a gold and ivory inlaid statue of the god, a copy of the original by Pheidias at Ancient Olympia. Next to it, in typically immodest fashion, Hadrian placed an equally large statue of himself and both statues were worshipped here as coequals. Deterioration set in the 5th century AD and continued during the following centuries due to natural causes and human activities. There was an open-air mosque during the Turkish occupation at the south-east corner of the precinct, and a look-out post was built on top of the architrave. Till 1852, 16 temple columns survived, but later that year, one of them was toppled by a gale and has been lying there ever since. Both statues have since been lost. On the corner of Filellinon street and Amalias avenue, stands the largest Byzantine building, and one of the largest churches in Athens – Russian church of the Holy Trinity. Built on the site of the earlier christian basilica (which in its turn was built over a Roman bath), it was completed in 1031 by the Lykodimou family, hence its original name – Satira Lykodimou. Even now, the building dominates the area with its massive and impressive construction, featuring a 10 m wide dome. Through centuries, the church suffered damages from the natural disasters and wars, or combination of both. After being damaged in 1687 during the invasion of Francesco Morosini, it suffered even more destruction in the earthquake of 1701. In 1780, the Turkish governor, Hadji Ali Haseki, partly demolished the building in order to use its parts for the construction of the defensive wall around the city. It wasn’t spared during the War for the Independence in 1827 either, when it was shelled from the Acropolis. In 1847, a half-ruined church was purchased by the Russian government as a parish for the Russian community in Athens. In 1850, the building was restored, post-Byzantine paintings were replaced, side turbines and a heavy bell tower were added on orders of Tzar Alexander II and now, it is still in use by the growing Russian community. 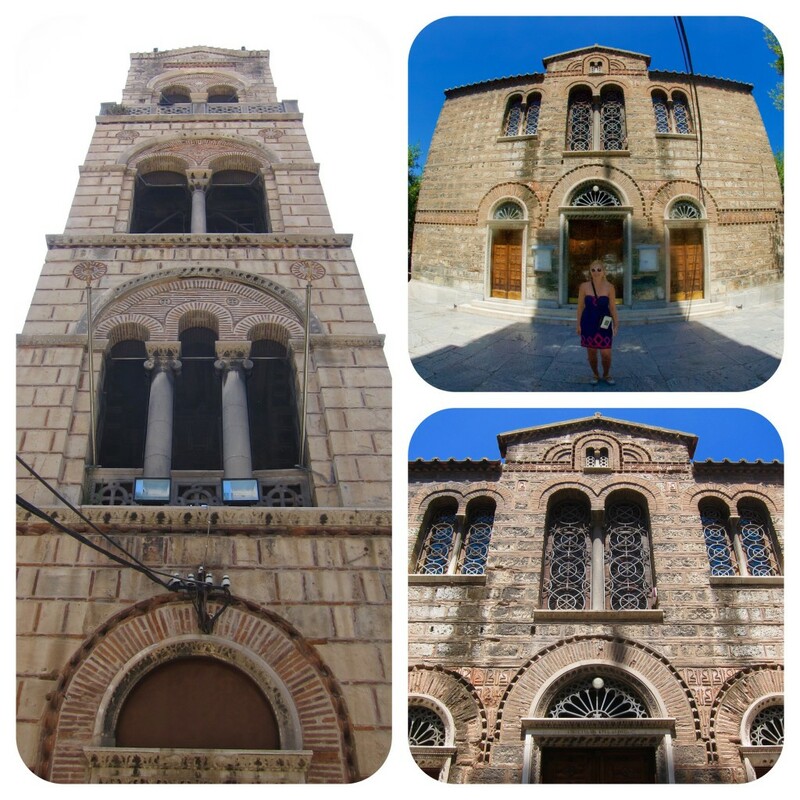 The building, like many churches in Athens, was closed but we did enjoy its elaborate facade. After another 5 minutes walk along Filellinon street, we finally reached Plateia Syntamatos (or Syntagma Square), which is home to the Greek Parliament in the Voulí building, and the tomb of the Unknown Solder, decorated with an evocative relief depicting a dying Greek hoplite and flanked by texts from Pericles’ famous funeral oration. The square is surrounded by high-end hotels (definitely check out Grande Bretagne), cafes and shops and has a marble fountain in the middle. It is a place to manifest and to be seen, but also to watch the change of traditionally dressed guards (evzones) which happens every hour on the hour. We happened to arrived at 15.00 and witness it ourselves. Note that the presidential guards’ uniform of short kilts and funny-looking pom-pom shoes is based on the attire worn by the Klephts (the mountain fighters of the War of Independence). 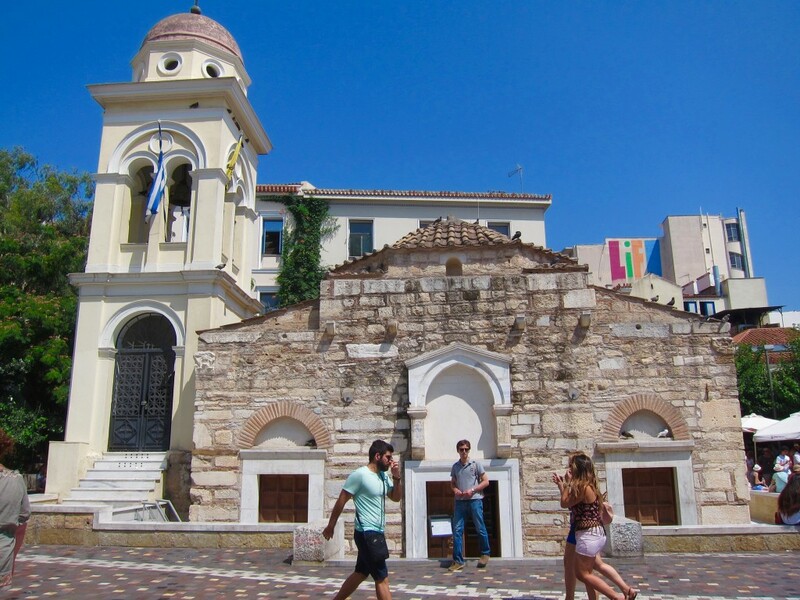 Since we planned to check out the Kerameikos archeological site, from the Syntagma square, we walked east-west via one of the most expensive streets in Europe – Ermou street. Mostly pedestrian, the street, which is 1.5 km long, is lined with expensive shops and busy cafes, however, in mid July, it didn’t look terribly crowded. For the first time in 42 hours, I wasn’t looking at something that was built in 5 century BC or earlier. East section of Ermou street terminates at a small square which houses one of the oldest Byzantine churches of Athens – Church of Panaghia Kapnikarea. Stranded in the middle of a square between Ermou and Kapnikarea Streets, it is surrounded by the modern office blocks and shops. Built over an ancient pagan temple, dedicated to either Athena or Demeter, its foundation is attributed to Empress Irene, who ruled the Byzantine Empire from AD 797 to 802 and it was traditionally called the Church of the Princess. The true origins of the word “kapnikarea” are unknown, although according to some sources, the church was named after its founder, a “hearthtax gatherer”. Saved from the demolition in 1834, thanks to the timely intervention of King Ludwig of Bavaria, and restored by Athens University, it is a true gem of the Byzantine Athens. After the restoration of 1950s, the dome of the church is supported by four Roman columns. Frescoes by Fotis Kontoglou were painted during the restoration, including one of the Virgin and Child. A block south from Ermou street, there is the Metropolitan Cathedral of Athens or Mitropoli. 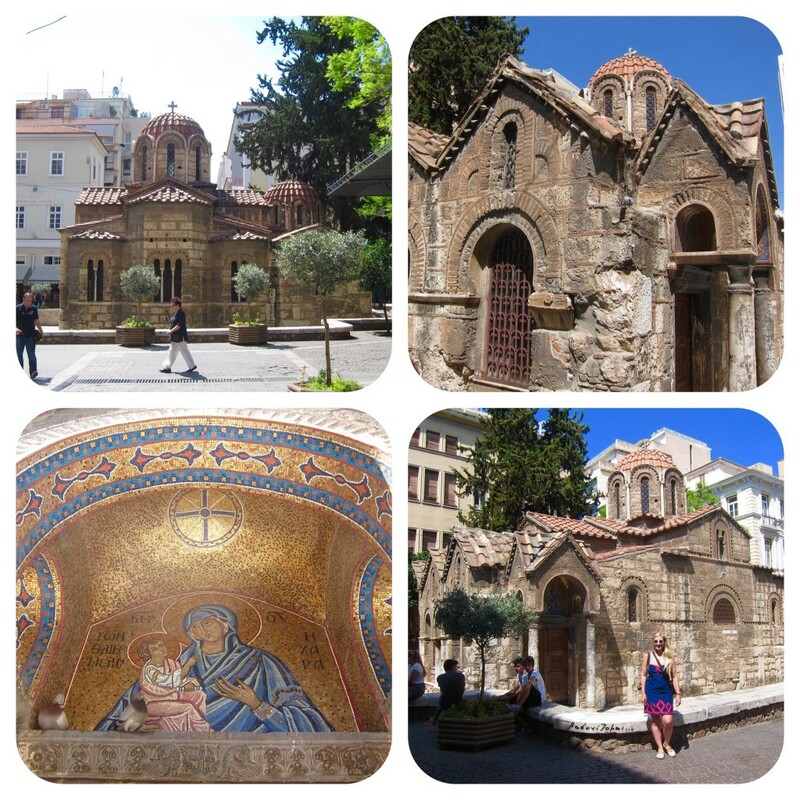 When Athens became the capital of Greece in 1834, a cathedral was needed here to be the seat of the Bishop of Athens. Construction began on Christmas Day in 1842 with the laying of the cornerstone by King Otto and Queen Amalia. Workers used marble from no less than 72 demolished churches to build the Mitropoli’s immense walls and three architects and 20 years later, it was completed. The king and queen were present at the dedication on May 21, 1862 in honor of the Annunciation of the Mother of God. At 40 m long, 20 m wide and 24 m high, it is the largest church in Athens. Inside, there are the tombs of two saints killed by the Turks during the Ottoman period: Saint Philothei, who was martyred in 1559, and her bones are still visible in a silver reliquary, and Patriarch Gregory V of Constantinople, who was hung by order of Sultan Mahmud II and his body thrown into the Bosphorus in 1821, in retaliation for the Greek uprising on March 25, leading to the Greek War of Independence. His body was rescued by Greek sailors and eventually enshrined in Athens 50 years later. 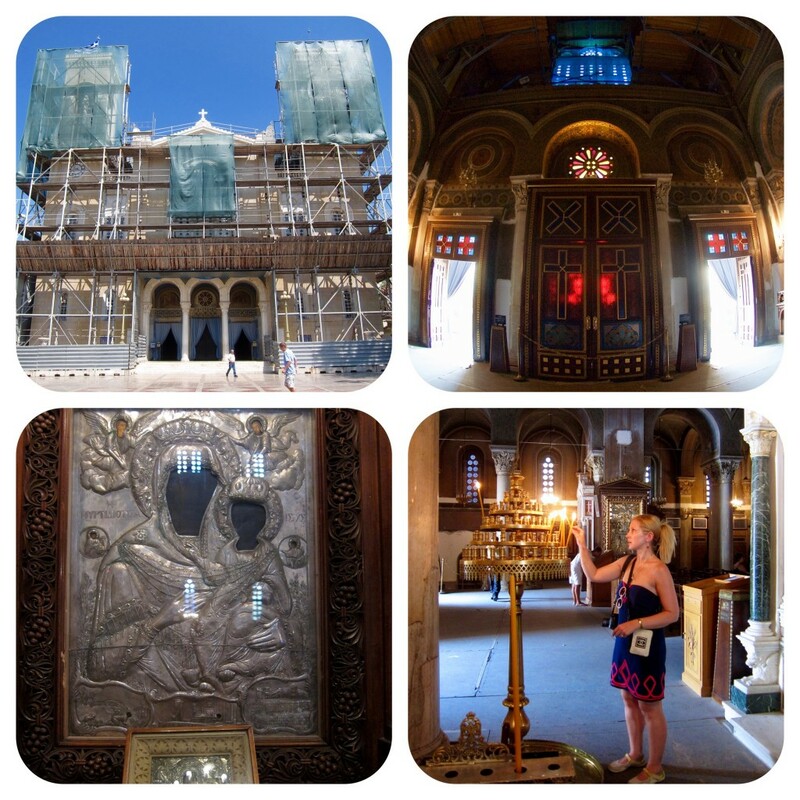 The Metropoli was undergoing a massive restoration when we visited it, so most of the relics were covered up. 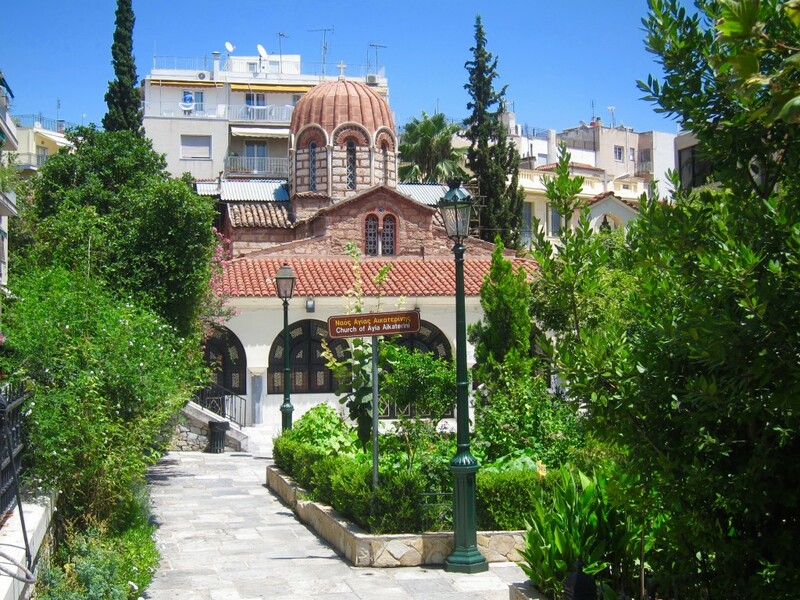 To the immediate south of the Cathedral is the city’s finest Church of St. Eleftherios (originally dedicated to the Panagia Gorgeopikoos, meaning “Virgin swift to answer prayers”), also called the “Little Mitropoli”. This domed cruciform church is built entirely of Pentelic marble, now weathered to a rich corn-colored hue. Dating from 12th century, it measures only 7.5 m long by 12 m wide, though the miniature size of the church is in scale with Athens of the 12th century, when it was just a village. Its exterior mixes the Classical and Byzantine styles, and is adorned with friezes of symbolic beasts in bas-reliefs taken from the earlier buildings. We enjoyed a half-hour break sitting in the shadow of these two Metrolopis. Our final stop of the day was the Kerameikos Cemetery, which was another 850-900 m walk (10-15 minutes). The city’s cemetery from the 12th century BC to Roman times, initially Kerameikos was a settlement for potters who were attracted by the clay on the banks of river Eridanos (hence the modern word “ceramic”). Due to constant flooding, eventually the area was converted into a cemetery and “re-discovered” in 1861 during the construction of Pireos St. The site is very different from the other archeological ruins in Athens. It is the land beyond, land of the “Other World”, land where thousands of Athenians for over 1,500 years found their last resting place. In 478 BC the Themistoclean Wall that surrounded the ancient city divided the place into the Inner and the Outer Kerameikos. The part within the wall became a residential area, and the outer part – a burial ground. To give you the visuals of what I am talking about, please see the map below (courtesy of Baedeker). We entered the site next to the Museum of Kerameikos and proceeded around the cemetery clock-wise. 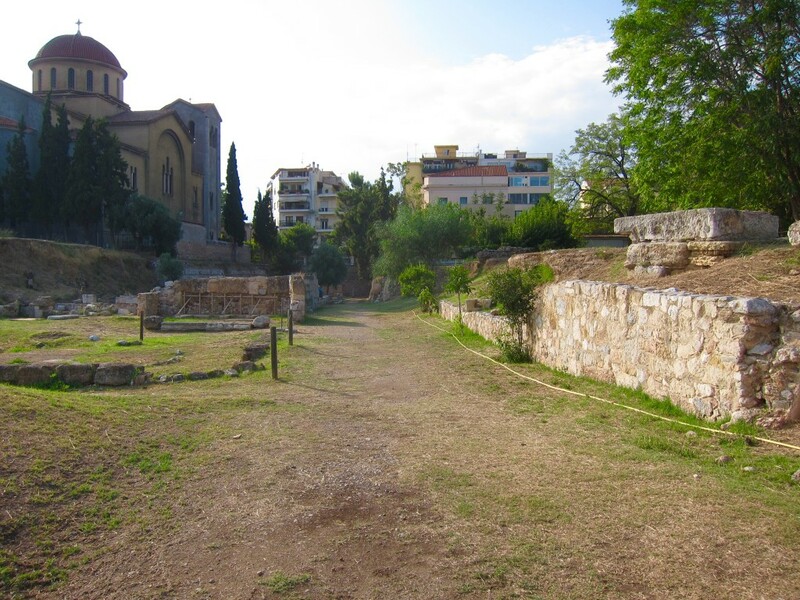 The Kerameikos is crossed from north to south for a length of some 200 m by the most typical and best preserved section of the fortification of ancient Athens. The overall perimeter of the wall, which encircled the city, was about 6,500 m, and it had at least 13 gates (two most important ones I already mentioned earlier – Sacred Gate and Dypilon Gate). The foundations of the fortification wall as we can see them today were laid down in 479-478 BC at the urging of Themistocles, and remained as they were, with recurrent repairs, for about a thousand years. From Thucydides’ description we know the dramatic historical events that obliged the Athenians to hurriedly erect the new city wall after the retreat of the Persians under the pressure of the Sparta threat. This Themistoclean wall had a stone base, the rest of it consisting of unbaked brick. The overall hight was 7-8 m, topped with battlements. It was 2.5 m wide and had a moat in front of it. 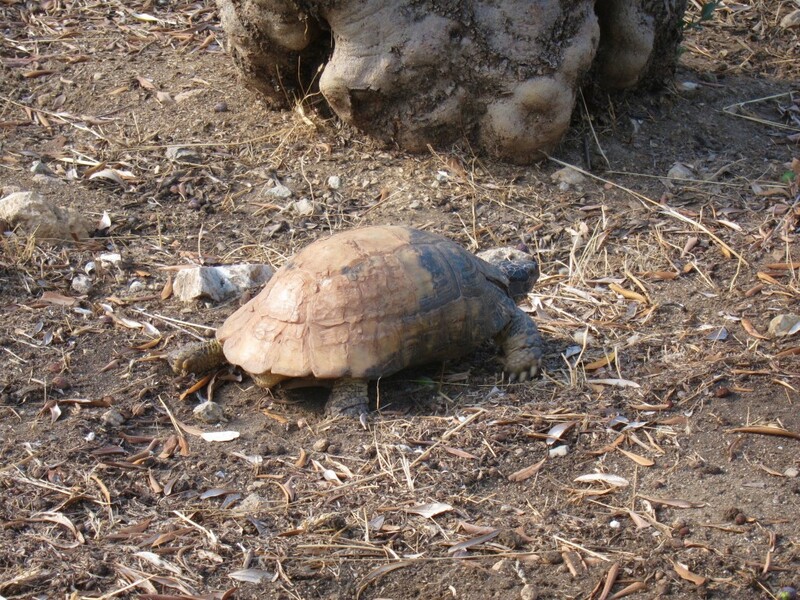 The site was nearly empty of visitors, but populated by a number of slow moving turtles. 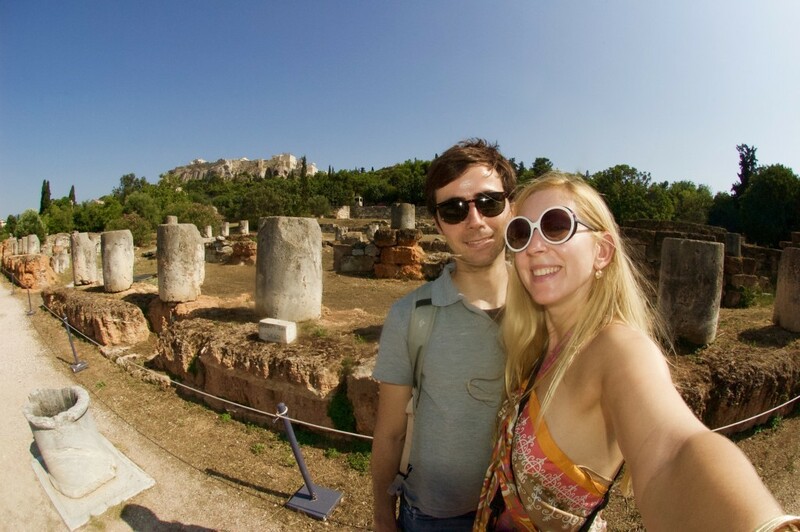 We began our tour at the Eleusinian or Sacred Way which was one of the most ancient roads of Athens. From the Sacred Gate it led to Eleusis, a distance of one hundred stades (about 20 kms). The use of the road for the procession of the Eleusinian Mysteries conferred on it a special religious importance. People who visit the grounds today walk on the same level as that of the Classical Period (5th-4th century BC). Leaving back the Sacred Gate, we immediately came across a square altar. Further above, the high “South Hill” is a mound concealing a host of mainly Archaic and Classical burials. Two grave steles at its foot mark the positions of the Tombs of Corcyraean Consuls. On the opposite bank of the river is another large burial mound – Anthemokritos. Next on the left can be seen the foundation of a small Classical sanctuary and beyond – the Tritipatreion. On the right, almost opposite, is a Hellenistic stone bridge over the Eridanos. Behind the Tritipatreion is another burial mound concealing a large brick funerary monument as well as hundreds of plain tombs. Finally, as one approaches the modern Piraeus Street, is flanked by family funerary monuments of the Classical period, like those of the Sinopeians, of Ampharete and Aristomache. One has also to imagine a similar picture of continuous funerary monuments on both sides of the road outside the present archeological area running for many kilometers towards Eleusis. We first ventured on to the Street of Tombs (the ancient name isn’t known), which is a branch of the Sacred Way. 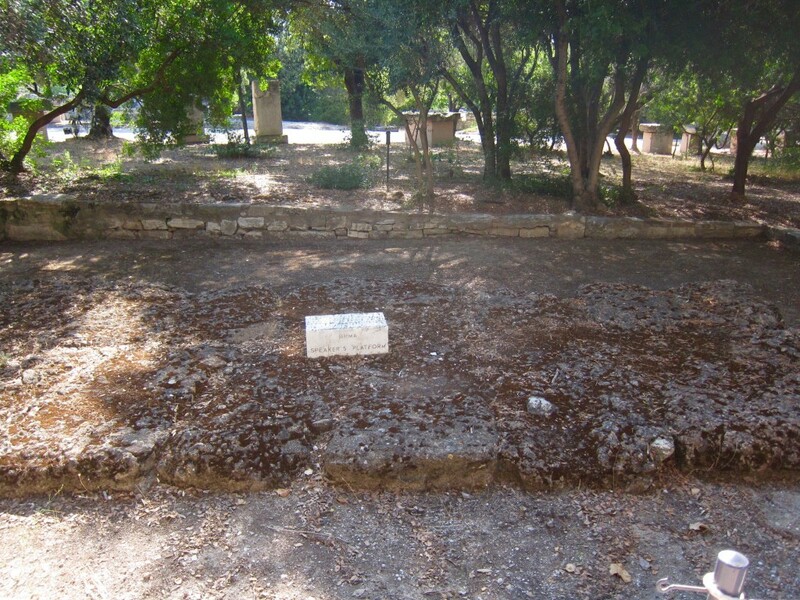 It was reserved for the tombs of Athens’ most prominent citizens. In the part of the Street of Tombs within the archeological zone are the best preserved and most imposing and luxurious funerary marble monuments of the 5th and 4th century BC (note, those are just the plaster copies, originals are either at the Museum of Kerameikos or at the National Archeological Museum). 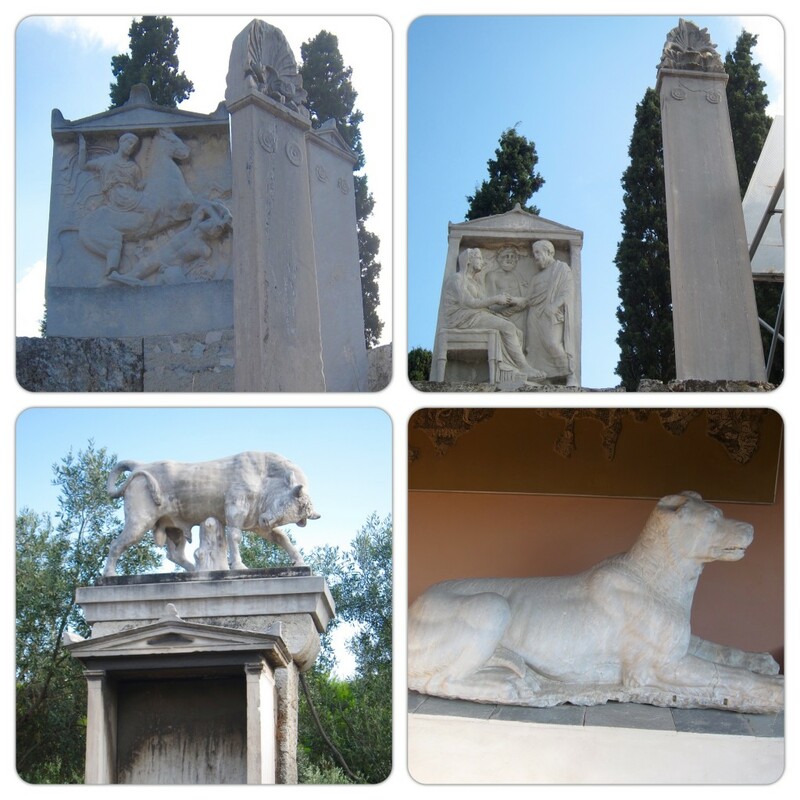 These steles, reliefs and complete marble monuments belonged in general to family burial enclosures. It was the way well-known wealthy Athenian families and foreigners, who had settled in the city, perpetuated the memory of their illustrious members. On the left of the road, going towards Piraeus, we came first to the relief of Dexileos, who was 20 years old when he fell in 294 BC in battle against Spartans. 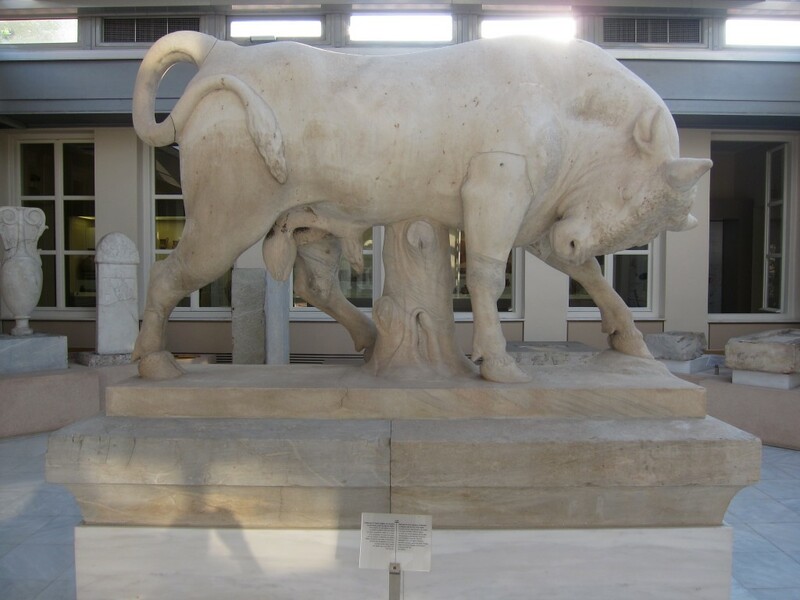 Next were the burial plots of the Herakleians, with the lofty stele of Agathon, Dionnysus of Kolyttos with a marble bull, Lysimachides with the marble Molossian hound and others. Pictures are placed left to right. 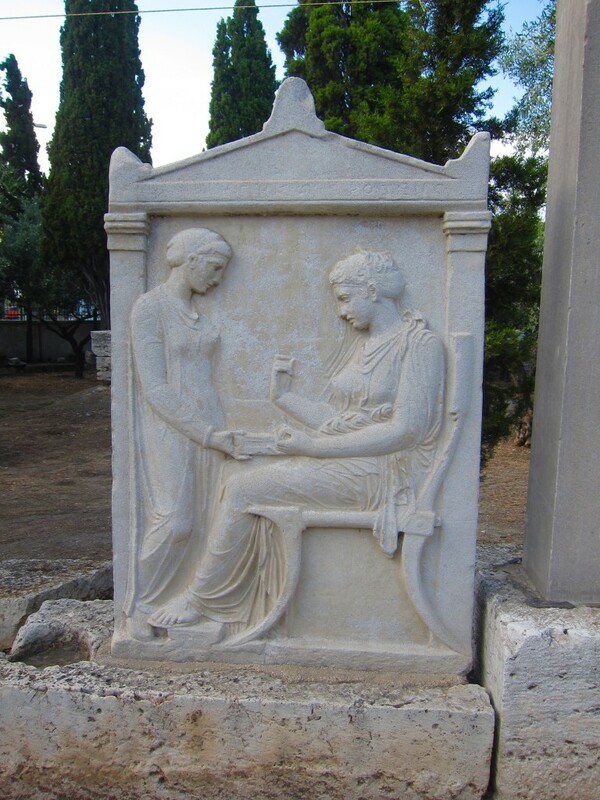 On the right of the road the most important burial memorial is that of Koroibos of Melite: it shows his wife, Hegeso, admiring her jewels with a servant. 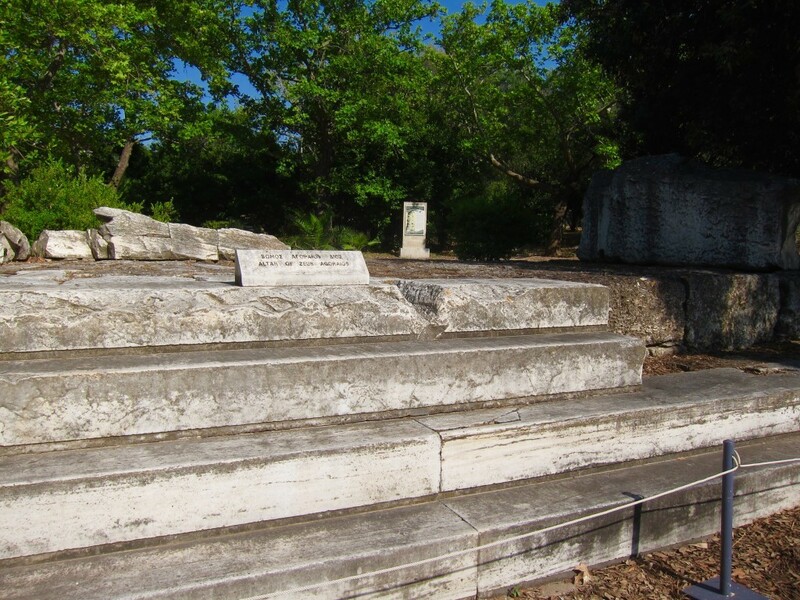 Here at a lower level, filled in after their excavation, are the earlier grave memorials, like one probably connected with famous Alcibiades family of the Peloponnesian War, and also hundreds of tombs from the Geometric period to Roman times. Important to mention, that ordinary citizens were buried in the areas bordering the Street of Tombs but not on the street. 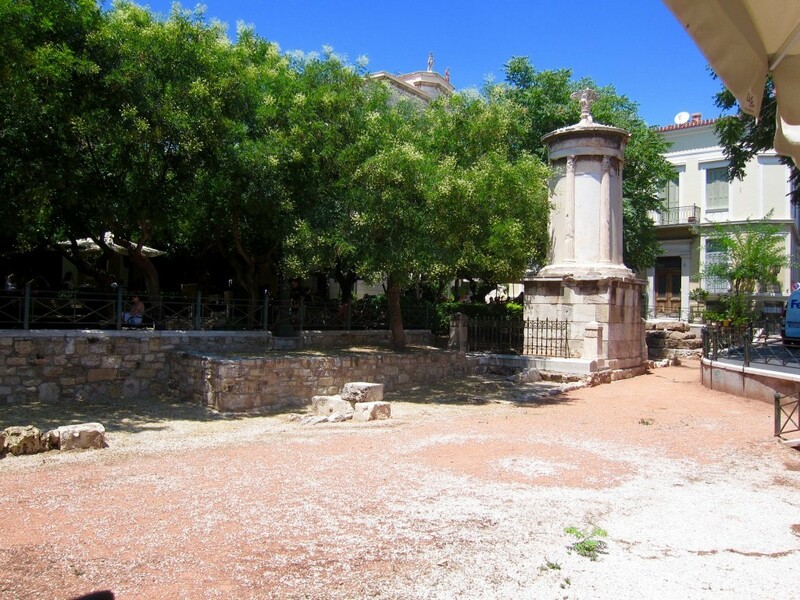 In the place, where the Street of Tombs merges with the Sacred Way is the Triropatreion sanctuary, a simple unroofed sacred precinct, the place where the Athenians worshipped their common ancestors. The cult was installed here in the early 5th century BC and the sanctuary ceased to exist around 300 BC, lasting therefore two centuries. In a first phase, ca. 500 BC, the sanctuary’s position was marked by an irregular limestone block which was later used in the south wall of the second phase of the sanctuary. A tumulus was formed, with an aperture on top in order to receive offerings. According to ancient texts, the Tritopatores were worshipped regularly by the Athenian citizens in common cult: the ancestors were offered food and drink and were begged, in private wedding ritual, for the birth of children and in particular for the birth of sons. The Ancient road, 1,600 m long, leading from the Dipylon Gate to Plato’s Academy was called simply the “Kerameikos” or the “Dromos“. 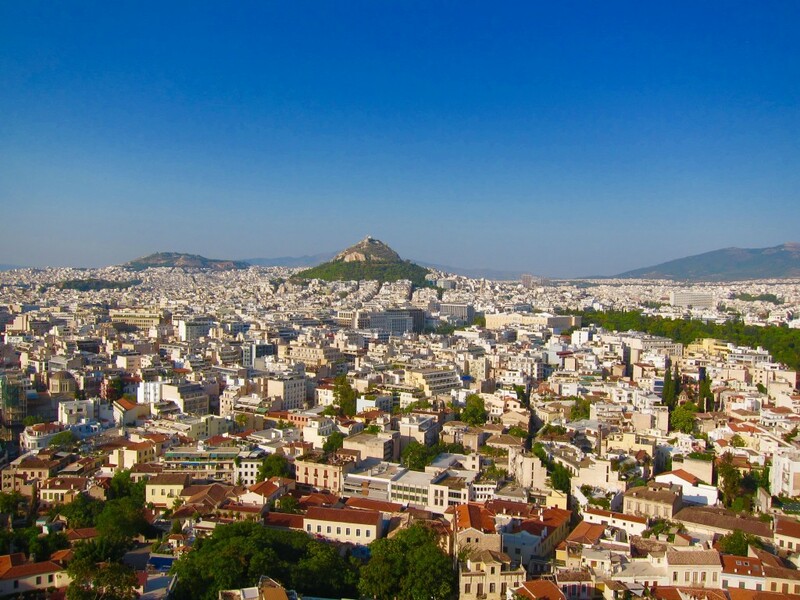 It was the most official road in the city because on either side of it, in the Demosian Sema (public tombs) were buried prominent Athenians and also those who fell in the city’s battles. 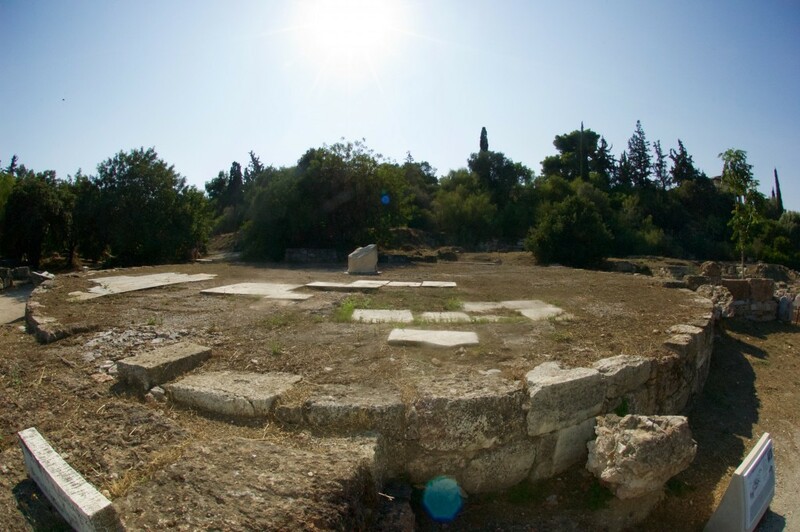 At the beginning of the Dromos, where was a square 40 m wide, where the Athenians congregated to honor their dead with ceremonies, games and funerary speeches. Pericles’ Funerary Oration for the first dead in the Peloponnesian War in 430 BC was one of them. In the Demosion Sema were the tombs of distinguished Athenians, like Pericles, the Tyrant – Slayers Harmodius and Aristogeiton, Cleisthenes, Thasubulos, Lycurgus and others. The excavation of the Dromos uncovered its Classical level only along the western side. The monuments bordering it are, in order, an Archaic tumulus, a Classical bath, the funerary monument of the Lacedaemonians and the peculiar “burial monument at the third boundary stone”. The east side of the Dromos has not yet been excavated. 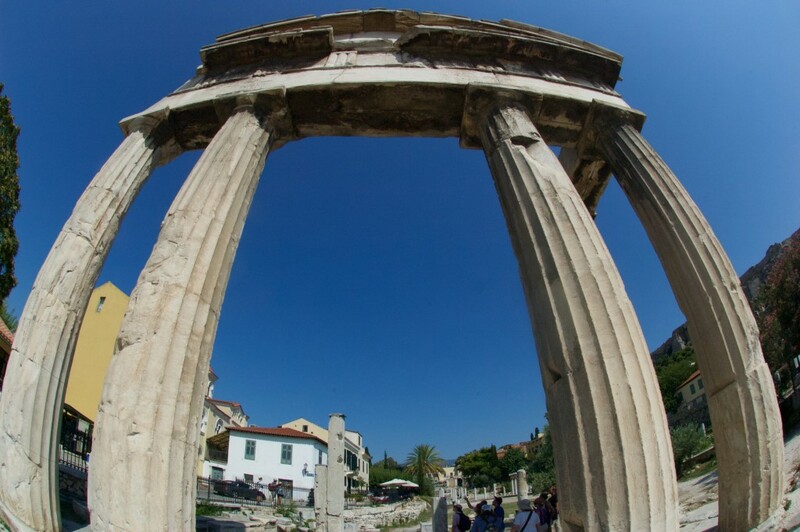 Dipylon (the “Thriasian Gate”), the most important gateway of the Athenian City Wall, was the main entrance of the city. Covering an area of 1,800 sq m, it was the larges gateway in the ancient world. Four tall towers at the corners created a large rectangular courtyard, the purpose being to hem the besiegers in. The towers were probably roofed and had steps to their tops; there were windows for archers on the ramparts of the walls connecting them. On the side of the city the gateway was closed by two doors, to which it apparently owed the name Dipylon (double gate). The gateway was constructed at the same time as the Themistoclean walls in 478 BC, and it lasted in more or less the same form until the Roman period. In Hellenistic times the tower were enlarged and two doors were added on the side facing away from the city, and in the Roman period a statue was erected on a large marble pedestal. The large courtyard of the Dipylon, in addition to acting as a protection and a thoroughfare, was also a place frequented daily by merchants and peddlers. It had a further function, however, as an official meeting place for the Athenians in two different situations: when there were funerary ceremonies in the Demosian Sema (public cemetery), and at the time of the Panathenaian procession to the Agora and Acropolis. As in nearly every ancient city, there was a large fountain at the Dipylon, where travelers arriving from all over Greece on their way to the City could refresh themselves. Between the Dipylon and the Sacred Gate, stood the Pompeion, a place where preparations were carried out for the most important festival of ancient Athens, the Panathenaia, which was held every four years in the middle of August. 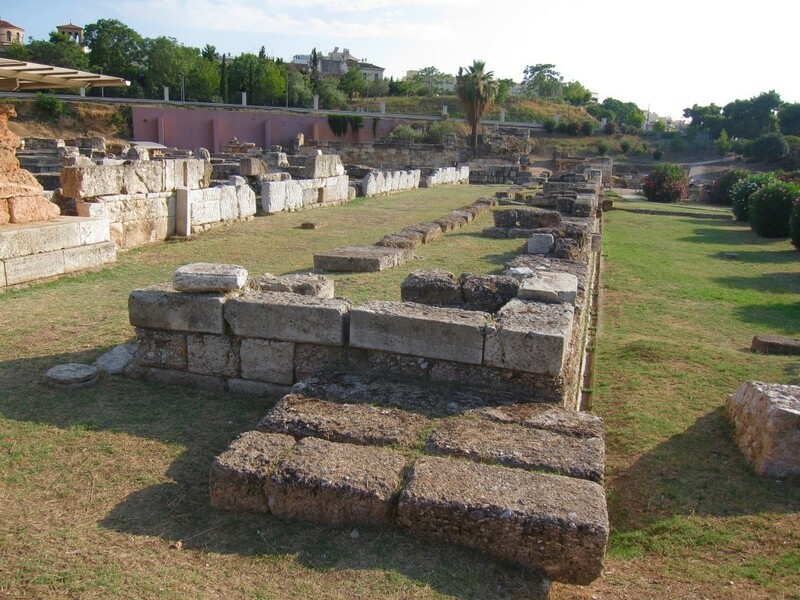 This large rectangular edifice, measuring some 70 by 30 m, was built in around 400 BC. It has a large colonnaded court, a monumental propylon on the side towards the city, and rooms for public feasts. The building was used for storing the equipment and materials, for collecting offerings, etc of the great festival, while in its large court the Panathenaian processional ship was made ready. It was from here that the procession set out for the Agora and Acropolis. During the rest of the year the Pompeion appears to have have other uses, like that of the Gymnasium. Ancient sources mention that there was a bronze statue of Socrates by Lysippos here and painted portraits of Isocrates and comic poets. Of the mosaics and paintings only the mosaic floor depicting animals has survived, exhibited in the Museum. 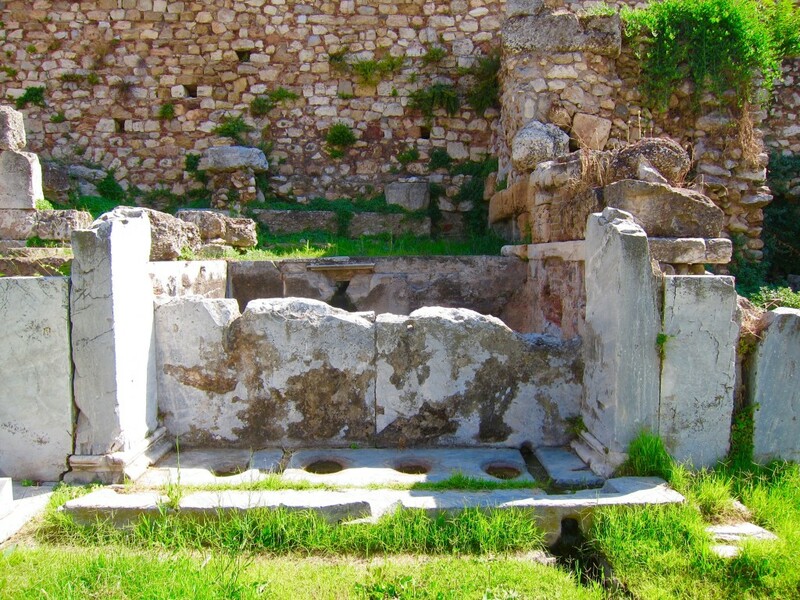 The Pompeion was also frequented by the Cynic philosopher Diogenes. 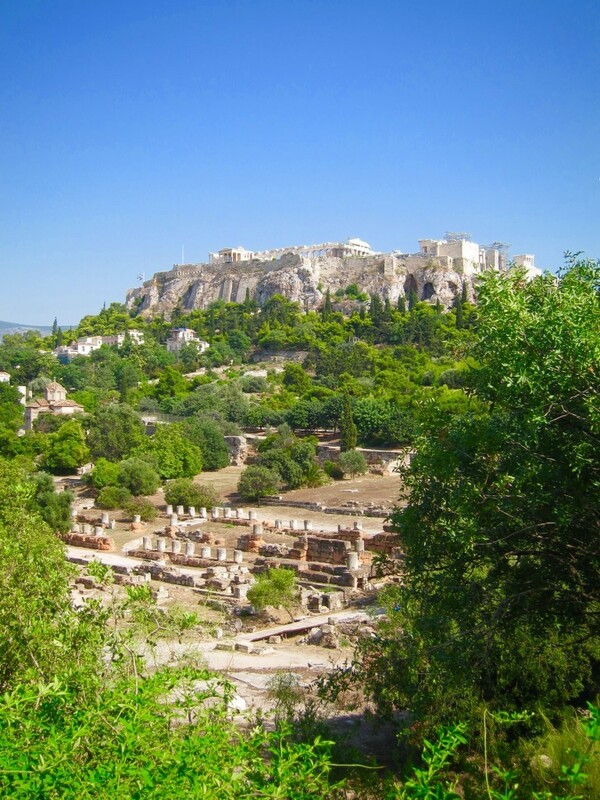 The Classical building was destroyed in 86 BC at the time of the Roman incursion into Athens. Later two buildings were erected on its ruins, first the so-called “Storehouse” (2nd century AD) and afterwards, in around AD 400, two arcades with a street ending in a gate. It is probable that both these structures continued to be used for the preparations of the Panathenaia until the end of antiquity. In the deepest levels of the Classical Pompeion approximately 160 Submycenaean burials were found (1100-1000 BC). 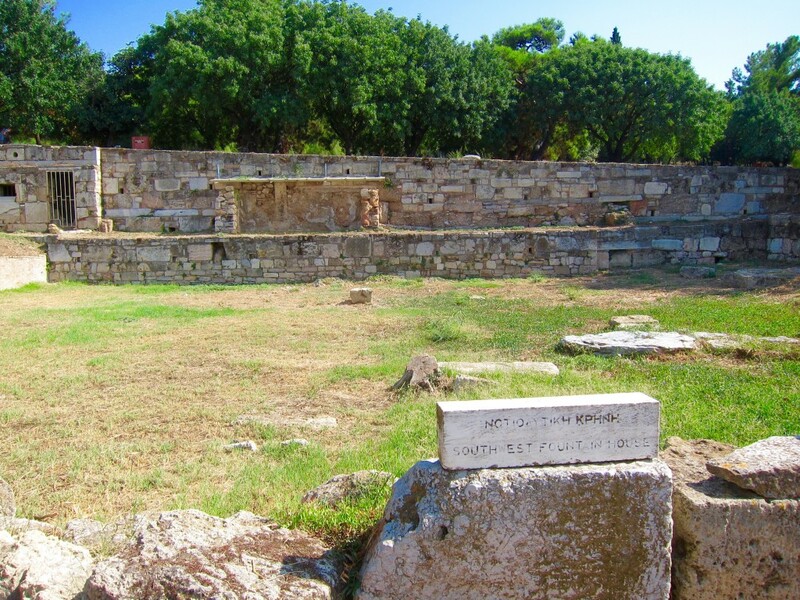 Inside the city walls, next to the Pompeion, the archeologists identified three houses, given the names X, Y and Z. Z, the most completely excavated, is a large house with an area of 600 sq m. It was built in about 430 BC and with continuous reconstructions existed until the 1st century BC (or AD). It belongs to the characteristic class of two-storied ancient Greek houses, with a courtyard with a well in the center of the house and rooms around it, men and women apartments, a kitchen and storerooms. During the course of the long history of building Z, its function changed. During the 4th century BC it may have been an inn with maids, weavers and prostitutes, who served the travelers. From the 1st century BC (AD) the whole quarter of the houses X,Y and Z was turned into a district of pottery workshops and bronze smiths. Pits for casting bronze objects have survived, as well as the considerable potters’ installations containing tanks for levigating the clay and kilns for firing the pots. We ended our tour of the Kerameikos at the Museum, four rooms of which and a courtyard contain almost exclusively finds from burials. 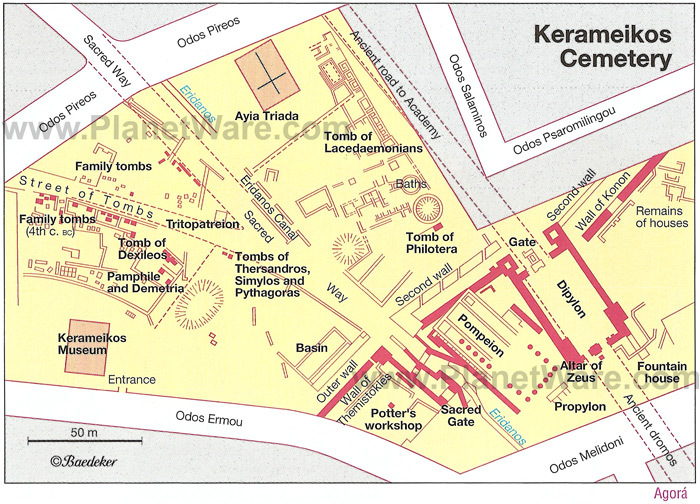 Please follow Museum of Kerameikos Map for the reference. 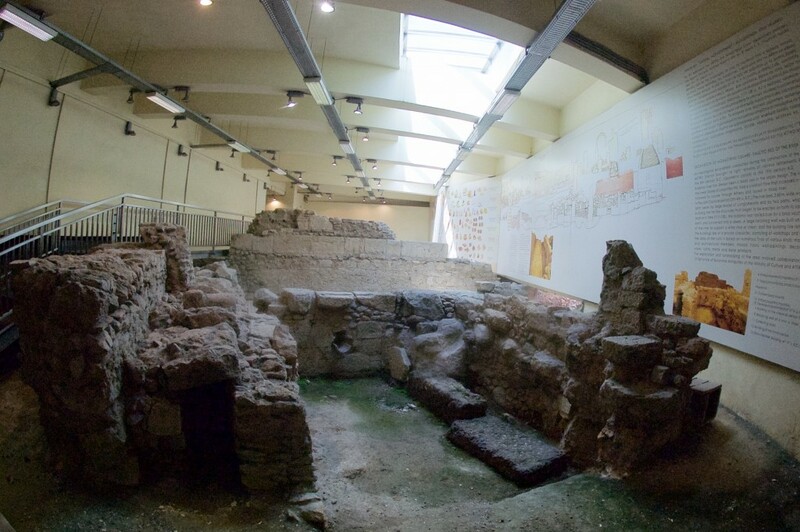 Two groups of burial monument are displayed in the first room: the first group contains a collection of Archaic tombstones, many of which were found built-in the Themistoclean Wall, where they had been used as building material during the hasty erection. The fragment of a boxed relief, the seated man wearing a himation, the lions, the “elegant” sphinxes and the noble Kouros at the end of the room are some of the most important Attic works of Archaic sculpture. The other group near the door consists of steles of the Classical period. Among them stand out the grave relief of the young horseman Dexileos, a grand mother, Ampharete, and two women, Demetria and Pamphile. The figures are depicted at characteristic moment in their lives and radiate grandeur and dignity. Other figures from funerary monuments are also exhibited in the courtyard. The center is dominated by a bull that came from the tomb of Dionyios from Kollytos. In the first room of the vase collection, in Case 1, are grave-offerings from the first phase of the cemetery, especially of the Prehistoric period (2500-1000 BC). The following Case 2,3 and 4 contain vases of the Protogeometric period (1050-900 BC), a period during which neatness of form and simple linear decorations appeared, the first examples of the new spirit in ancient Greek art. The large vases of this and the following periods were used either as cinerary urns to hold the ashes of the deceased or as grave “markers” (funerary monuments). 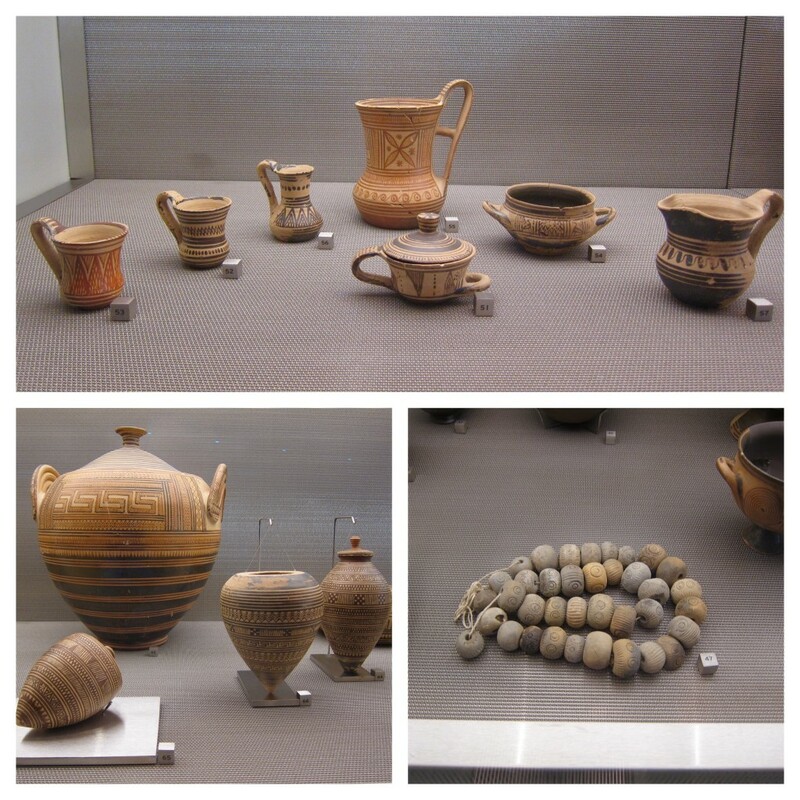 In the second room Cases 5 and 6 display some of the many grave-offerings from the Geometric period (900-700 BC), the period most strongly represented in the Kerameikos. Alongside the linear decoration, human and animal figures now become more and more frequent in vase-painting, and form the start of the Attic potter’s pictorial repertoire. In the first part of the third room in Cases 7, 8 and 9 are finds from the Archaic period (700-480 BC). The pottery was now enriched with new shapes and vase-painting made great strides in its repertoire, which becomes narrative, depicting scenes of mourners, myths, gods and heroes. With the introduction of the black-and-red-figure styles, the era began of the renowned Attic vases that were in demand by foreign markets. 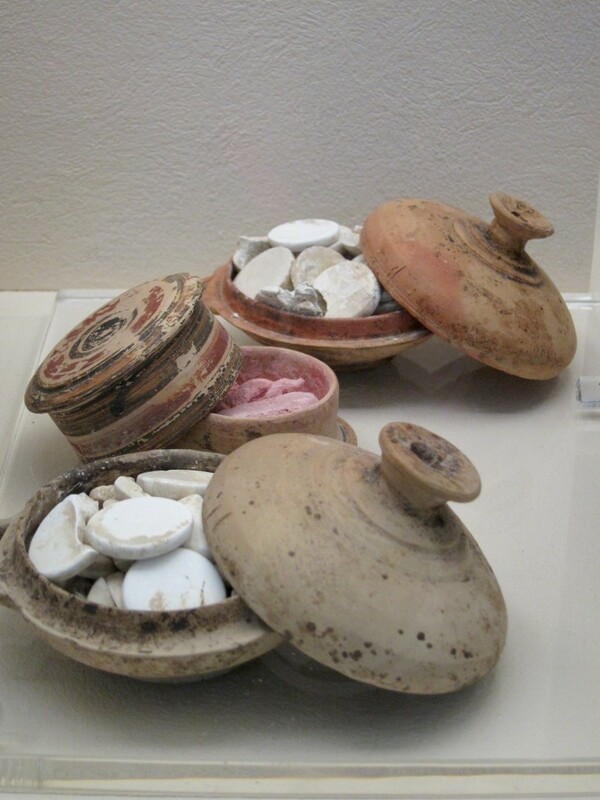 Cases 11, 12 and 13 contain grave-offerings of the Classical period (5th and 4th century BC). Some of the red-figure vases and white lekythoi, vessels painted exclusively with funerary representations, were the ornate creations of the Athenian potters who had their workshops in the surrounding district. The hydria by the Meidias Painter, dating to the end of the 5th century, is one of them. Case 14 brings the history of the cemetery to a close with finds from the Hellenistic to the Early Christian periods (3rd century BC – 6th century AD). Graves and grave-offerings now become less elaborate. Black-gazed pottery with simple foliate decoration gives way to unglazed pottery with the gradual disappearance of every decorative style. Jewelry becomes especially popular and frequently accompanies the body. Case 10 and 15 are different from the rest: in case 10 finds are shown from an excavation at the corner of the lera Odos and Piraeus Streets, which is an extension of the cemetery outside the organized archeological site. A communal burial of men, women and children was discovered there, buried in disorder, victims of the plague that broke out in Athens in the summer of 430-429 BC and was mentioned by Thucydides. The plague decimated the population and was the reason for the violation of the ancient burial laws. Case 15 contains finds from public and private life, which came from the Inner Kerameikos, the residential part of the city. The lead sheets with the names of Athenian aristocrats formed part of the archives of the Athenian Cavalry. Also of interest is a collection of potsherds inscribed with the names of famous Athenians who had been subject to the ordeal of ostracism. We had an inexpensive but delicious dinner at one of the restaurants on Adrianou street overlooking the Ancient Agora and then caught a train back to Chalandri. Wow, what a day! 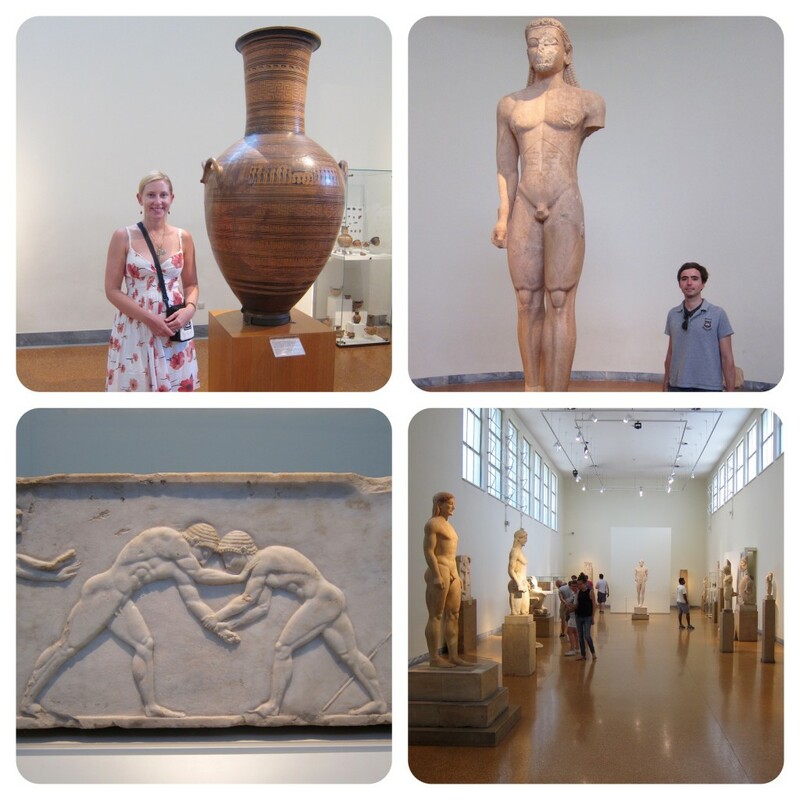 Today, we devoted the entire day to the National Archeological Museum, one of the best and certainly one of the largest exhibitions of Greek artifacts from prehistory to late antiquity in the world. Over 11,000 items (and growing) are housed in a beautiful 19th-century neoclassical building and take up to 8,000 sq. m. The exhibits displayed largely thematically and are very easy to navigate. Cost is €7 per person, no-flash pictures are ok, allow yourself at least 5-6 hours to enjoy this collection. Even though, I wouldn’t dare to describe every piece in the museum, I would like to point out to a few interesting sections, collections and items to watch out for. Check out the National Museum Map for reference. We browsed through the museum clockwise. Rooms 7-35 are Sculpture Collection and contain sculptures from all over Greece from the 8th century BC to the end of the 4th century AD, displayed chronologically. Among those in the collection, the most important are the series of Kouroi and these of Classical grave reliefs. Also, pay attention to the Dypilon Amphora – a huge Geometric vase which was used to mark an 8th century BC woman’s burial and shows the dead body surrounded by mourning women. It was named after the place of its discovery (Kerameikos’ Dipylon Gate, that we visited the evening prior). Rooms 36-39 are the Bronze Collection – world’s largest collection of bronze statues and objects. 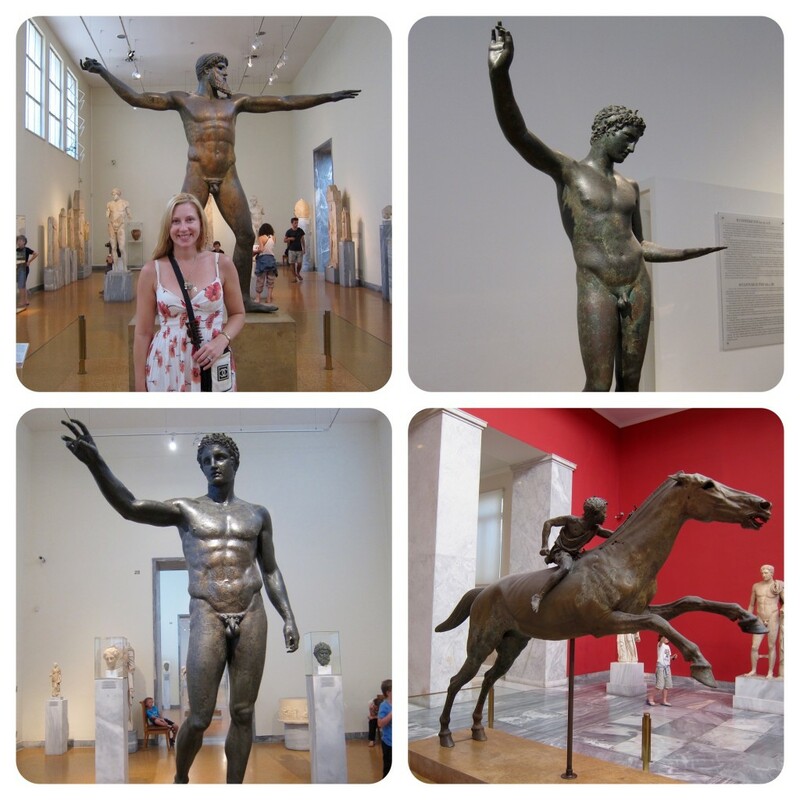 It is famous mainly for its unique, large-scale original statues such as the Poseidon or Zeus from Artemision, the Marathon youth, the Antikythera youth, and the jockey from Artemision. Rooms 40-41 are the Egyptian collection, renowned throughout the world for the importance of its objects, from statues to pottery, and from mummies to jewelry. I won’t deny, room 42 – the Stathatos Collection – was one of my favorite. Its 970 objects, works of the Minor Arts, looked very much like something I would like to own myself. Also, pay attention to the museum’s more than 600 pieces of jewelry, they are inspiring. Pretty much most of the second floor (rooms 49-63) is dedicated to the Collection of Vases and the Minor Arts. The great quantity and quality of the Geometric pottery, the early black-figure vases from Vari, the white-ground lekythoi and the red-figure vases of the 4th century BC make this collection one of the richest in the world. 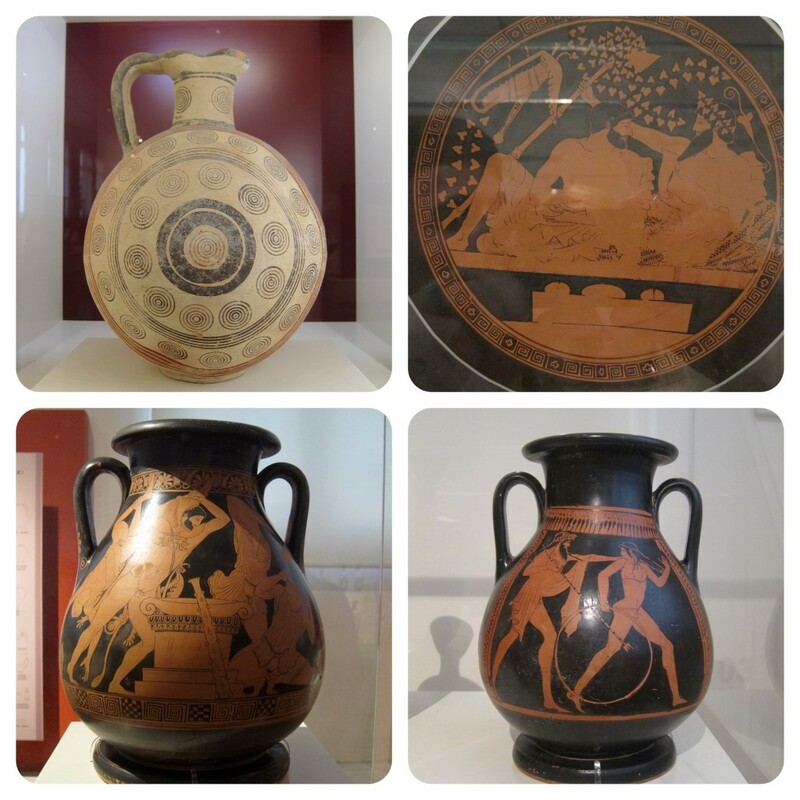 The museum also houses an excellent collection of terracotta figurines, glass vessels, Cypriot antiques, Vlastos-Serpieris collection and has a beautiful garden sculptures. However the most famous rooms in the museum are 3-6, which accommodate the Pre-Historic Collection. 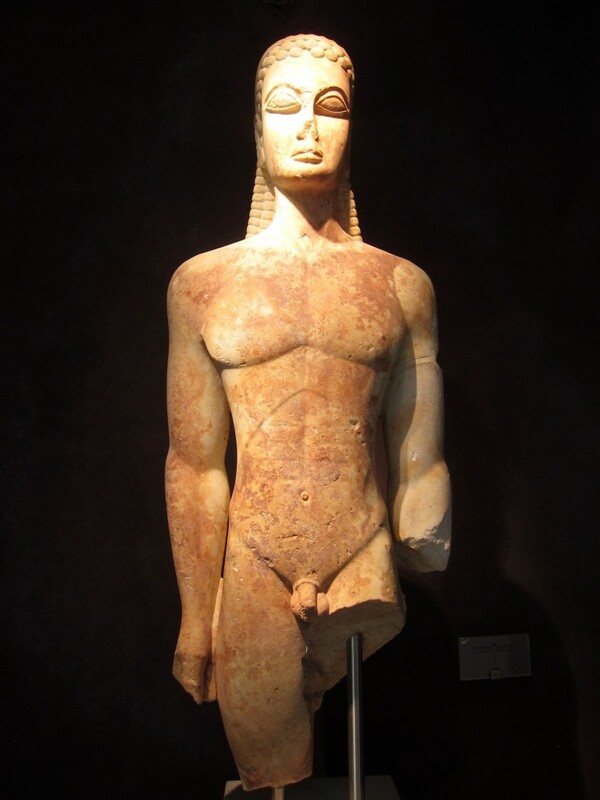 The most important exhibits are the treasures from the royal tombs at Mycenae, the famous Cycladic marble figurines, and the superbly preserved wall-paintings from Thira in Santorini. 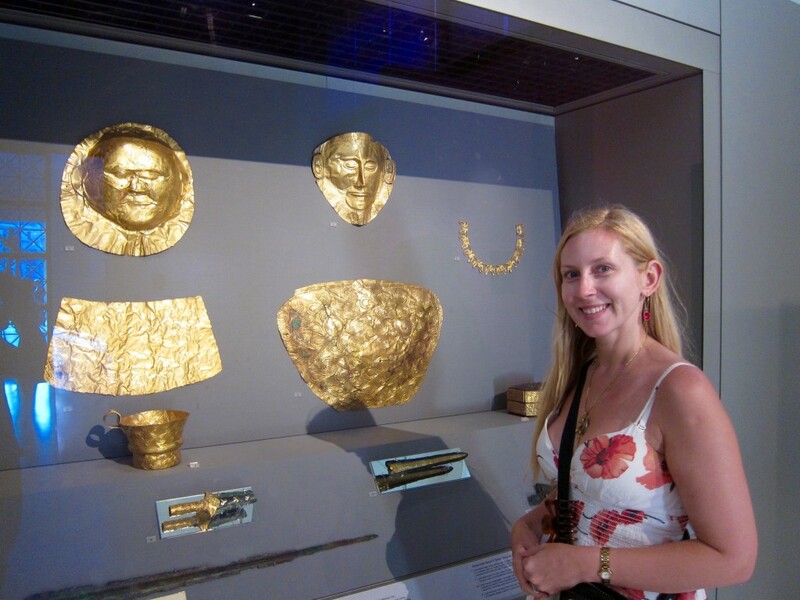 The golden death mask of Agamemnon, found at Mycenae by Schleimann, is also there! However, it is not the mask of the legendary king, since it dates 2 centuries earlier than the time of Agamemnon. 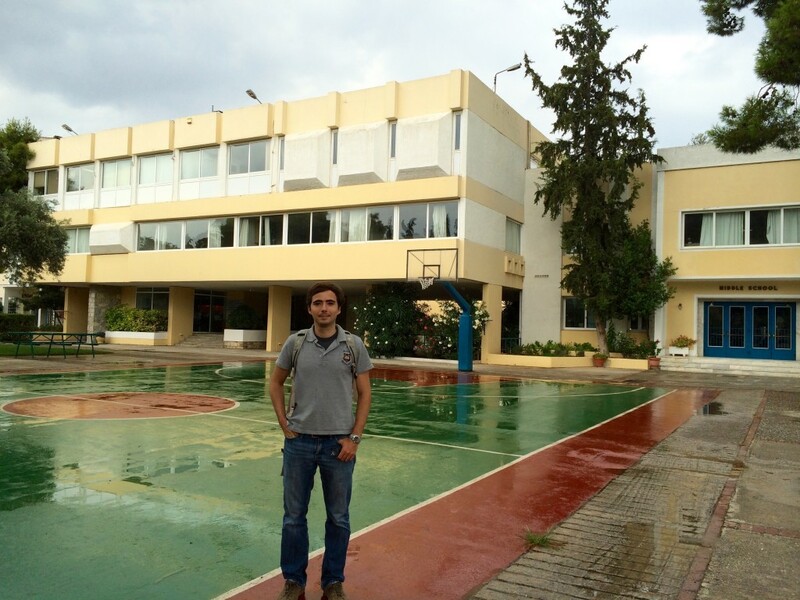 Tomorrow, we were starting out road-trip around Greece, so after the visit to the museum, we went to D. mom to pick up a car, and on the way back to the apartment, we passed by the Olympic Stadium and stopped at the campus of the ACS Athens where D spent 6 years of his middle and high school. By no means we were able to visit all the places in Athens, but we were yet to return in a few weeks to attend a Big Fat Greek wedding, as well as to visit the Kallimarmaro Stadium, Benaki museum, Lykavittos hill, and the first cemetery of Athens; to do some fur shopping and check out a famous flea market. Click here for Athens, part II. 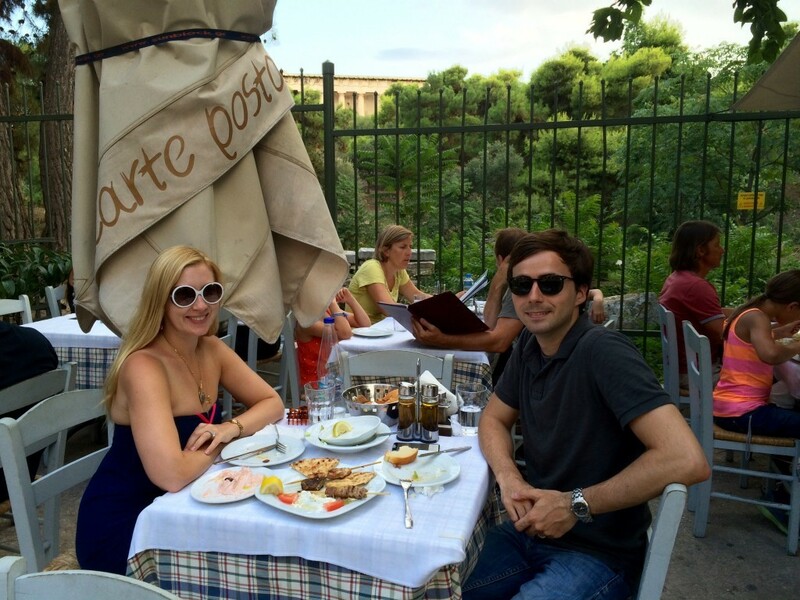 Pictures of Athens, July 2014. 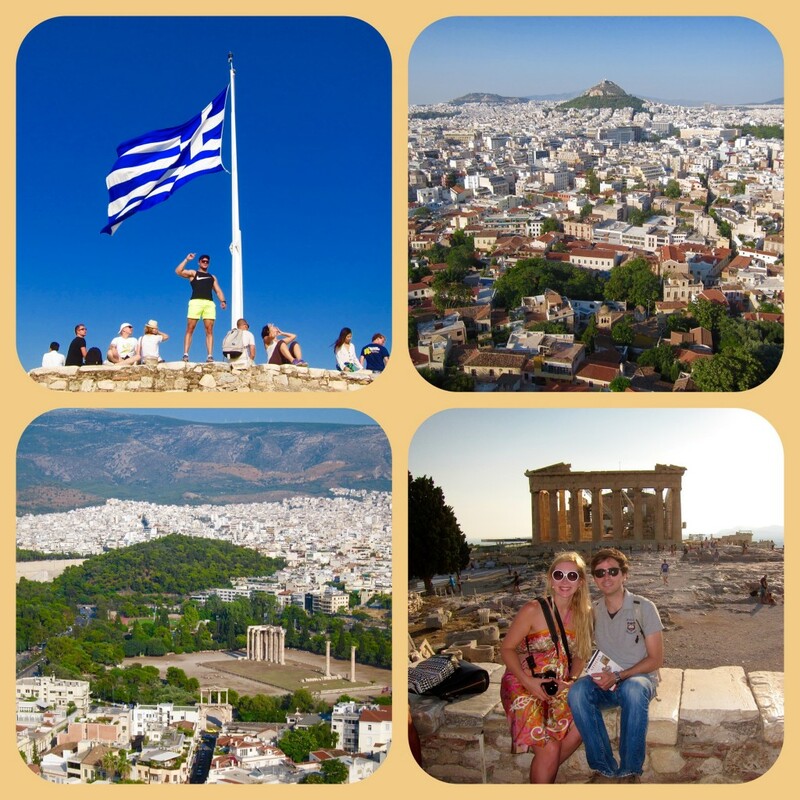 This entry was posted in Europe and tagged "Gallery of the Slopes of the Acropolis", "Old Temple" of Athena, "Parthenon Gallery", "The Palace of Giants", Acropolis, Acropolis Museum, ACS Athens, Agoracritus, Agoranomeion, Alexander the Great, Altar of Athena, Altar of Zeus Agoraios, Ancient Agora, Apostle Paul, Archaic Gallery, Areopagus Hill, Aristotle, Aristotle's Lyceum, Arrhephorion, Asclepieion, Athena Promochos, Athens, Beule Gate, Brauroneion, bronze foundries, Byzantine Empire, Callikrates, Caryatids, Chalandri, Chalkokondyli family, Chalkotheke, choragic monument, choregic monument, Church of Agia Aikaterini, Church of Panaghia Kapnikarea, Church of St. Eleftherios, church of St. Paraskevi, Church of the Holy Apostles, Cleisthenes, Cyclopean, democracy, Dionysius the Areopagite, Dipylon, Dorian, Dromos, Eleusinian Mysteries, empress Eudocia, Erechtheion, Ermou street, Eumenes II, Fethiye Cami, Fethiye Mosque, fountain house, Gate of Athena Archegetis, Great drain, Greece, Gymnasium, Hadrian, Hadrian's Arch, Hadrian's gate, Hadrian's Library, Herculius, Herodotus, Hippocrates, Julius Caesar, Kerameikos, Kerameikos Cemetery, King Cecrops, Kyriazopoulos Folk Ceramic Museum, Later Temple of Dionysus, Library of Pantainos, Lysikrates Choregic Monument, Megali Panaghia, Menander, Metroon, Metropolitan Cathedral of Athens, Middle Stoa, Mitropoli, Monastiraki, Monopteros, Monument of Agrippa, Monuments of the Eponymous Heroes, Museum of Ancient Agora, Mycenaean, myth, National Archeological Museum, New Bouleuterion, Nike, Odeion of Agrippa, old Acropolis Museum, Old Bouleuterion, Ottoman Empire, Panagia Gorgeopikoos, Panagia i Spiliotissa, Panathenaic Games, Panathenaic Way, Pandroseion, Pantanassa church, Parthenon, Parthenon Marbles, Pausanias, Peloponnesian War, Pericles, Pheidias, Philip II of Macedon, Plateia Syntamatos, Plato, Plato's Academy, Plutarch, Pompeion, Propylaea, Roman Agora, Roman Empire, Russian church of the Holy Trinity, Sacred Way, Saint Asomatos, sanctuary of Artemis Brauronia, sanctuary of Dionysus Eleuthereus, Sanctuary of Pandion, Sanctuary of Zeus Polieus, Socrates, Solon, Sophocles, south slope of the Acropolis, Sparta, statue of Athena Promochos, Statue of Hadrian, Stoa of Attalos, Stoa of Eumenes, Street of Tombs, Sulla, Syntagma Square, Temple of Athena Nike, temple of Dionysos, Temple of Hephaistos, Temple of Olympian Zeus, Temple of the Olympian Zeus, The Archaic Temple of Dionysos, The Horologion of Kyrrhestos, the Temple of Rome and Augustus, the tomb of the Unknown Solder, the Triropatreion sanctuary, Tholos, Tower of the Winds, Tzistarakis Mosque, Vespasianae, Ηiera Hodos. Bookmark the permalink.